Everything we do at JPSA is for a purpose. 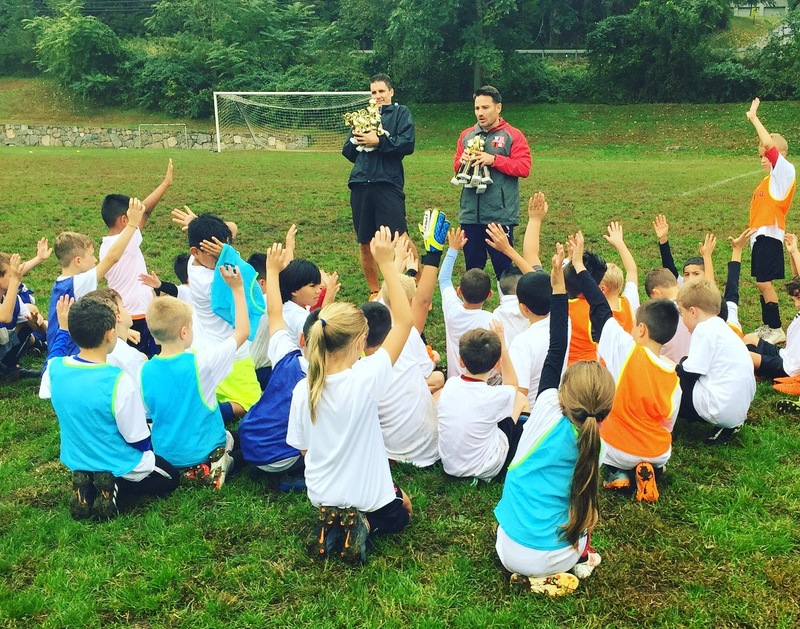 Everything we teach the kids, the speeches we give, the training sessions we plan; the list goes on and on! 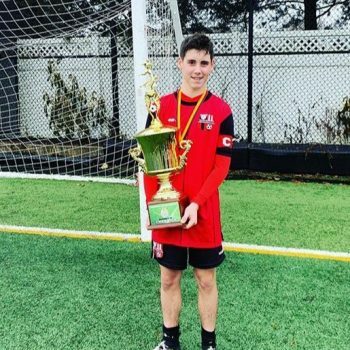 So, why these unique academy tournaments? 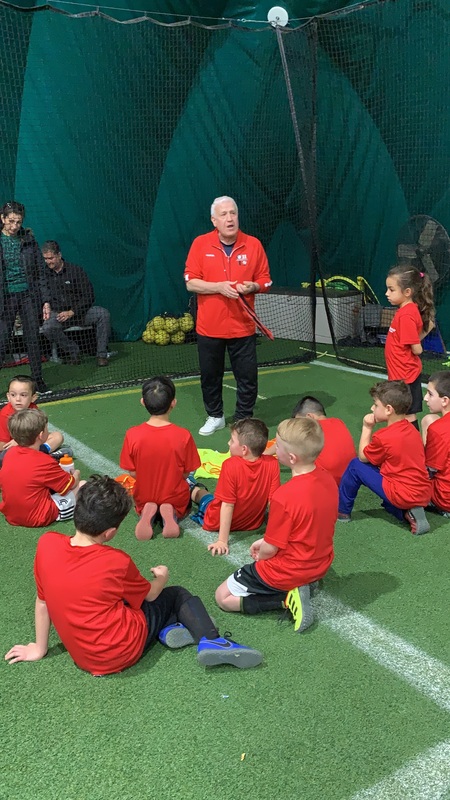 The purpose is mainly for the players to be given the opportunity to play with the energy and desire from within their hearts and the freedom to make different decisions within the game that they may not feel during their season games and/or competitions. 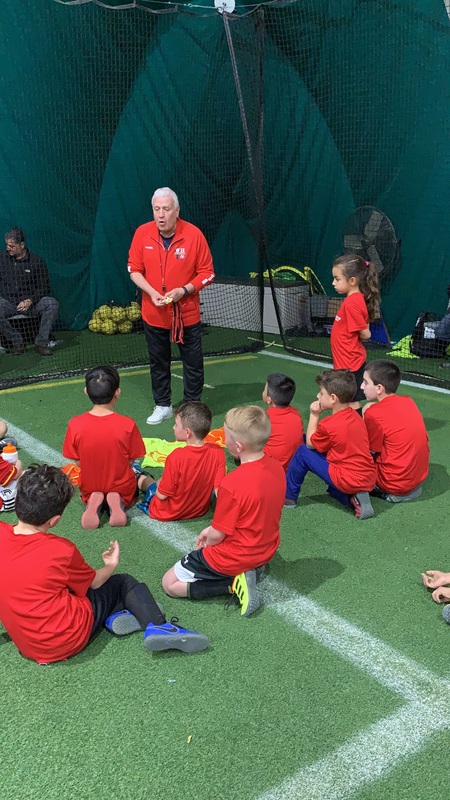 We do get involved by teaching certain components of the game and giving ideas to the players but most importantly, we make the tournament fun and exciting by giving the power to the players to own the game. 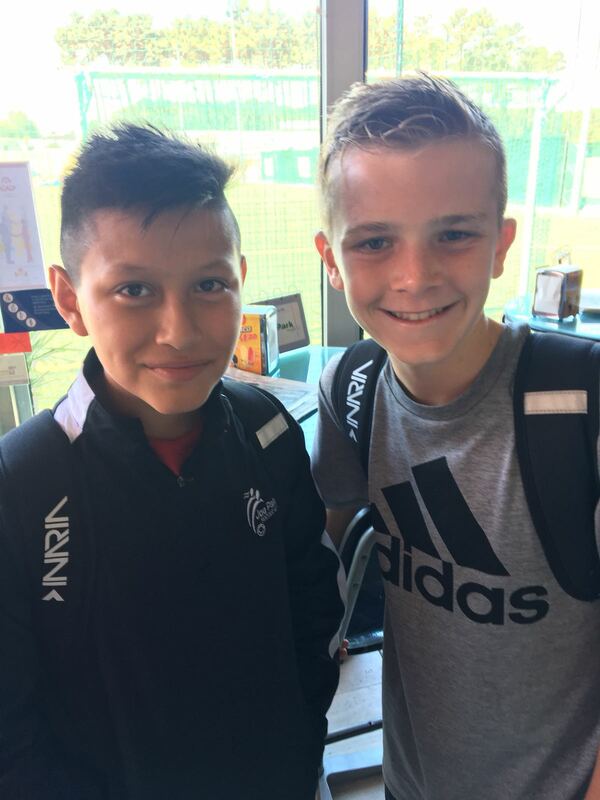 The emotion, excitement and suspense from the players, together with the respect, sportsmanship and education that’s being enforced throughout is what makes these tournaments so special to us! 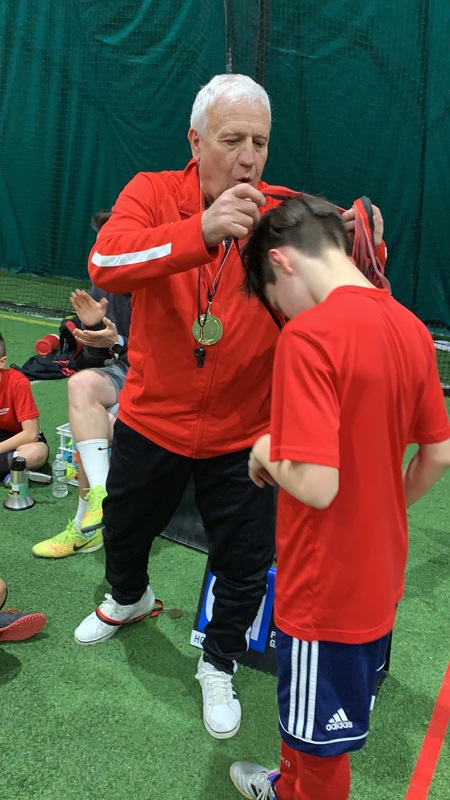 Our tournament this past Saturday, March 9th was nothing short of this. 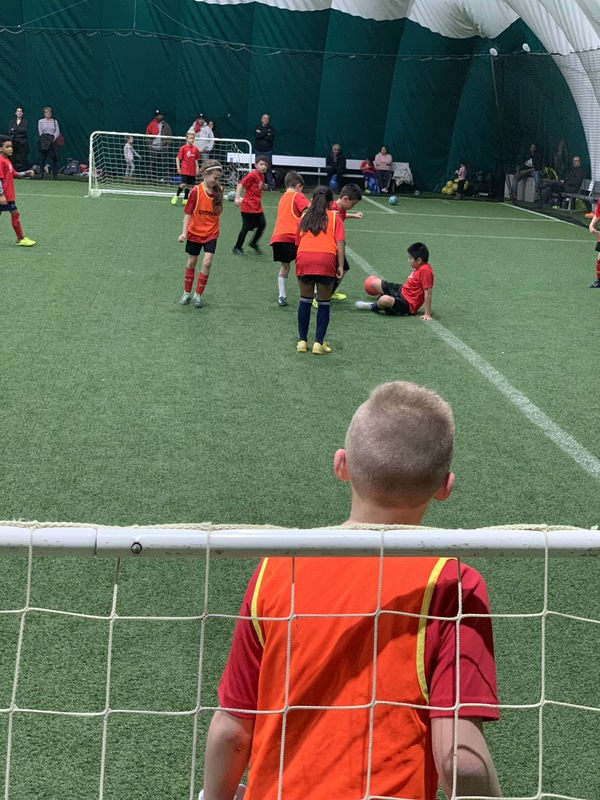 The international favorites in the Junior, Senior and Masters divisions were present from 12pm – 4pm and the coaches, referees, spectators, supporters and passersby all had the honor of watching these mini professionals enjoy this beautiful game. 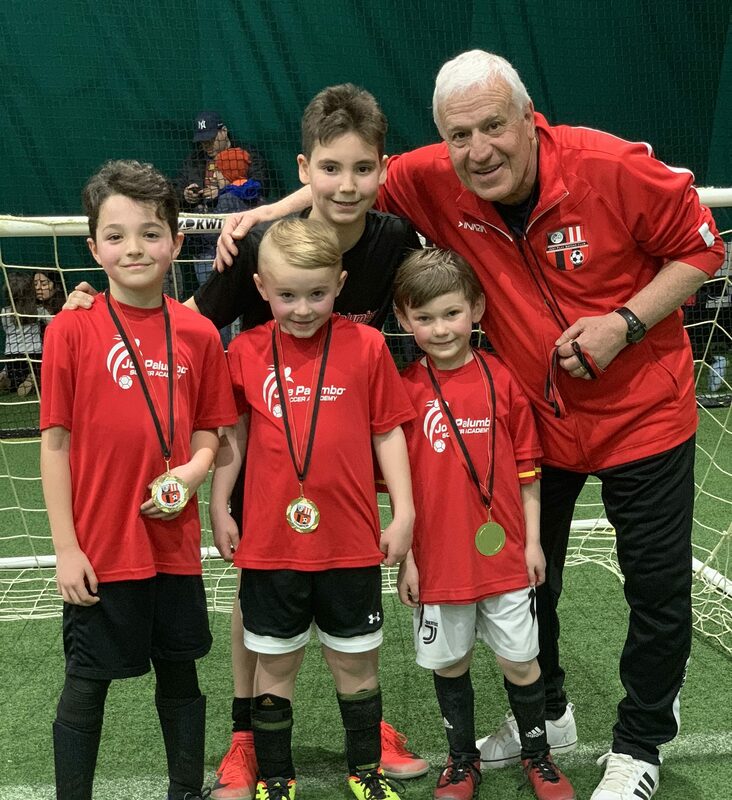 In the 12pm Juniors division, we had AC Milan who came 1st place and showed their true professionalism and class throughout the afternoon games. 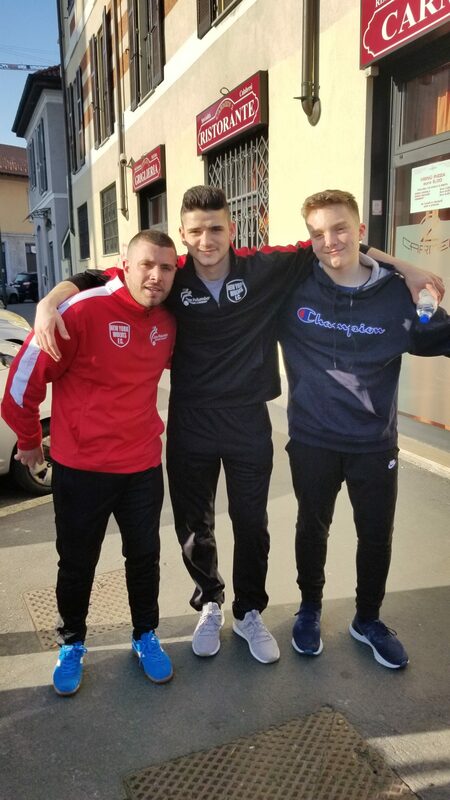 Napoli came in a close second, Roma following in 3rd and unfortunately for the Palumbo Soccer staff, Juventus didn’t have a great result falling in 4th place. Our Seniors division at 1:30pm was an absolute joy to be a part of and watch from behind the net. 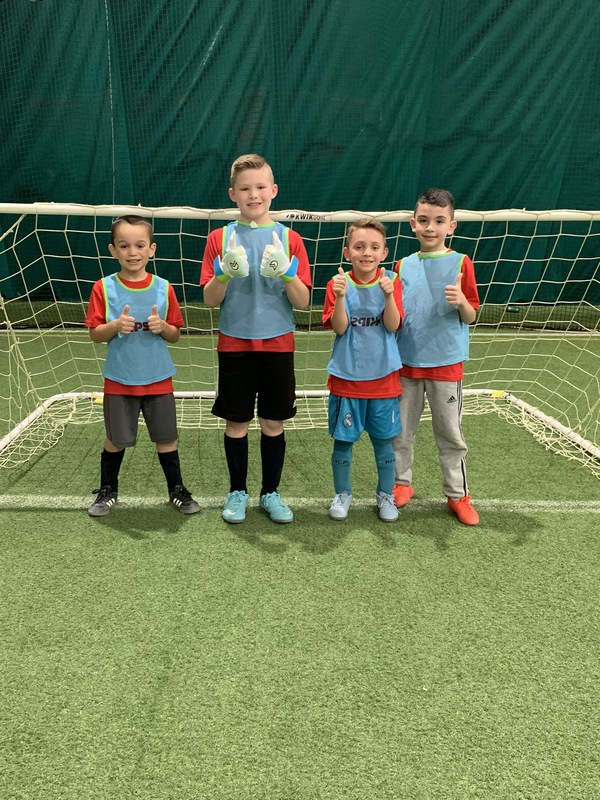 Atletico Madrid came away with the title and the trophy in this group with Barcelona falling behind in 2nd, Sevilla in 3rd and Real Madrid (with Cristiano Ronaldo rostered and dressed) in last place. The Masters division was at 2:40pm and is always a very well balanced tournament. The maturity, confidence and pure love for the game was shown through all their faces on Saturday. 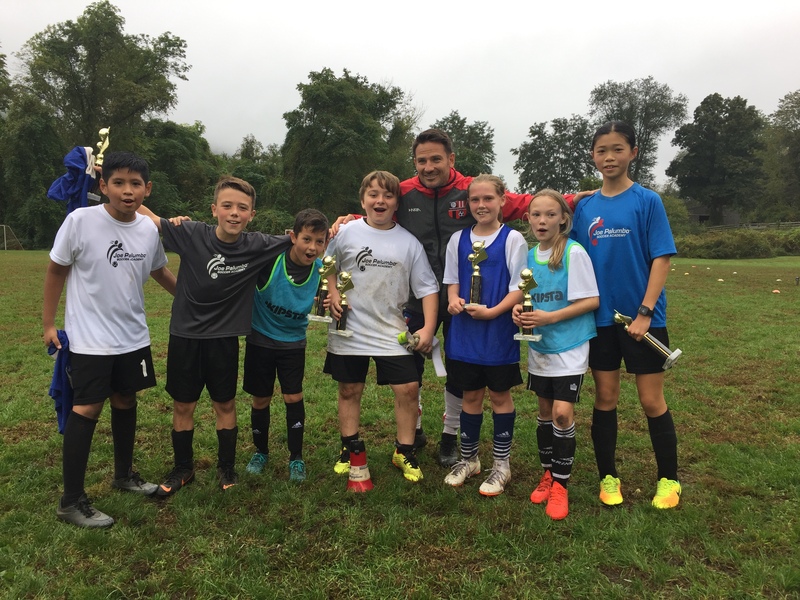 Our 1st place champions were Werder Bremen with Peyton Case leading the team. 2nd Place will go to Dortmund and 3rd to Shalke. 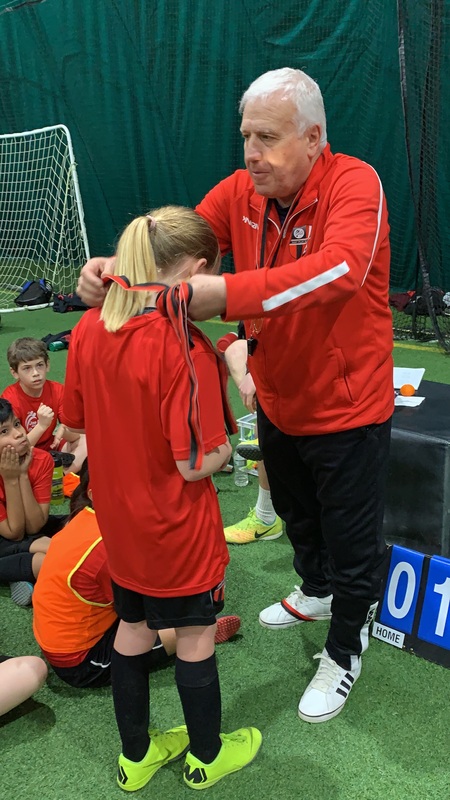 The tournament concluded just at 4:00PM with the medal distribution a winners picture and Hugs at dismissal! 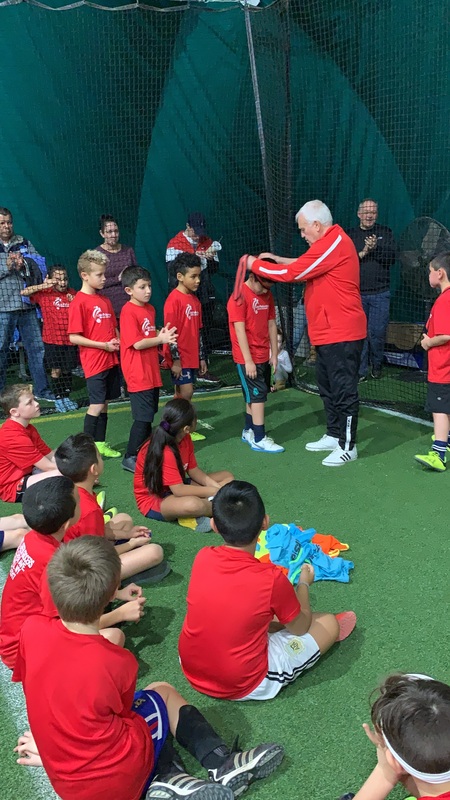 The soccer SNL final games kicked off right after this tournament. Stay tuned for our next blog on how the SNL turned out! 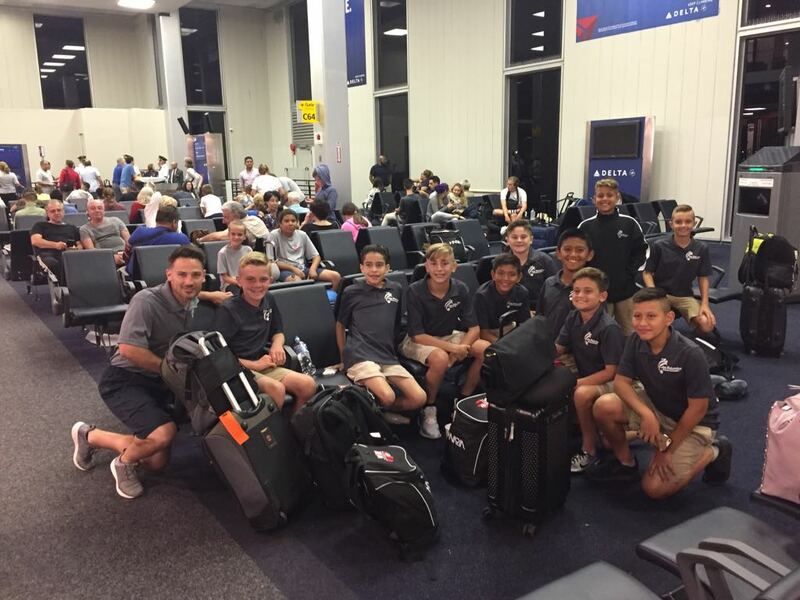 We had a great check in and take off with no incident and everyone very excited to start the trip! The flight was smooth as buttah with BLanz catching some Zs on his goal keepers shoulder. 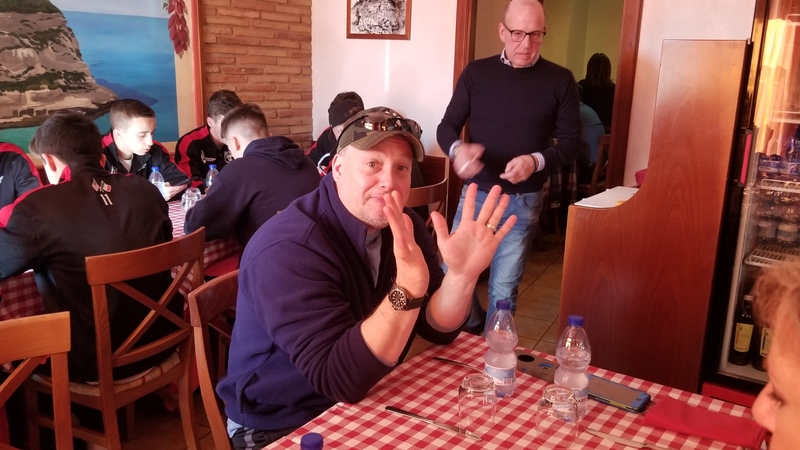 We were greeted in Milan by the legendary coach, Fabrizio and our fantastic driver, Luca who whisked us away for a traditional lunch of risotto, chicken francese, oven roasted potatoes, salad and typical cookies, macchiato, espresso, and we’re on our way to San Siro for the Inter v Sampdoria match. More details to follow. We’re laughing and reminiscing about previous trips while making new great memories! 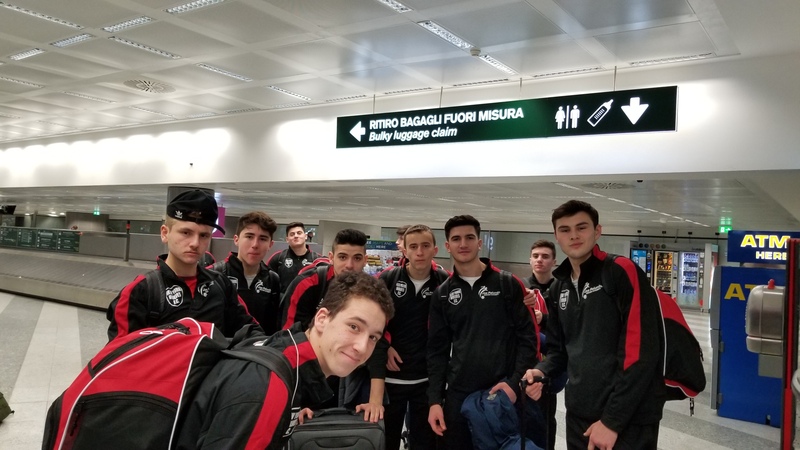 Tonight, we will arrive in our hotel in Lucca with our first match v Lucchese tomorrow at 2pm after a good night’s rest!! 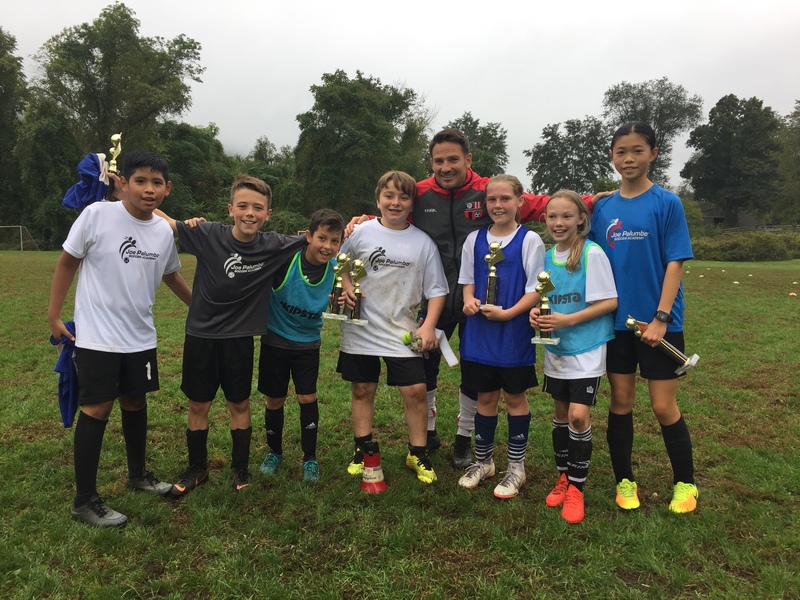 Congratulations to all of the winners at our JPSA Columbus Day Tournament this past Monday! 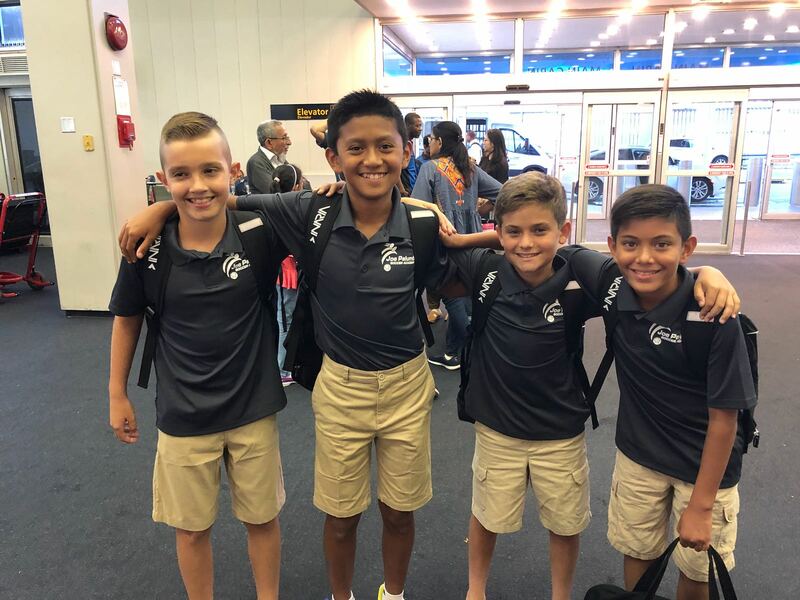 The day began around 8:30 in the morning with players making their way into the pavilion for check-in and team selection. 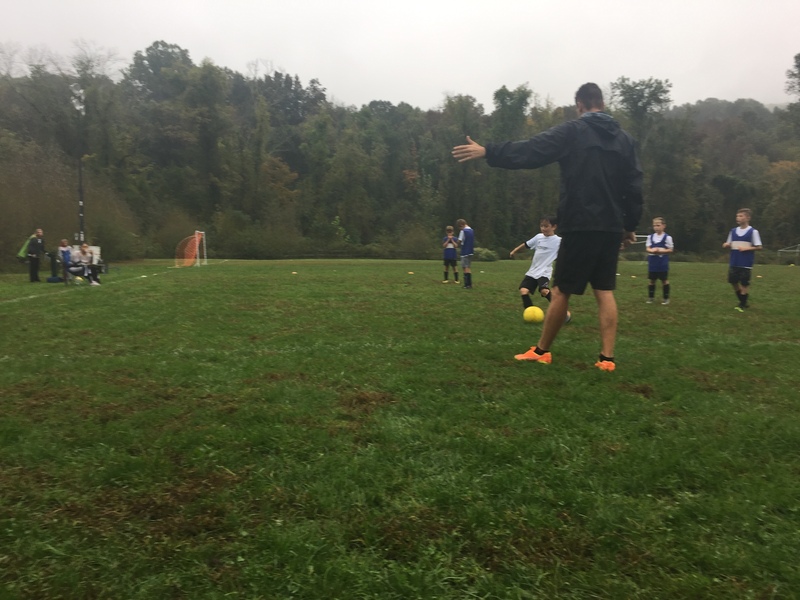 I have to say the tournament was full of dedicated soccer players who were eager to play because when you looked outside on Monday morning it was dark, cold and wet! 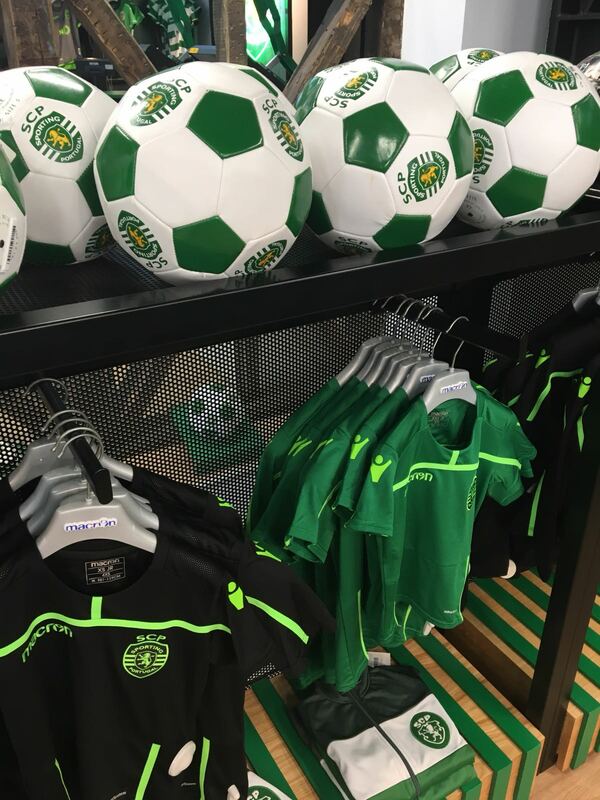 The true soccer lovers made it out on Monday and we were impressed with the quality they demonstrated on the field. 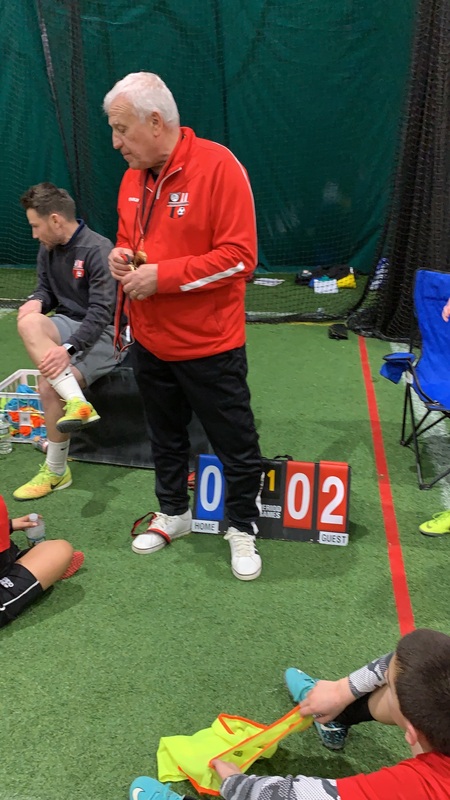 Yes, there were winners in each division however the real winners were us coaches and parents who got to witness kids who were competing in an environment that was safe, educational and most importantly, fun. 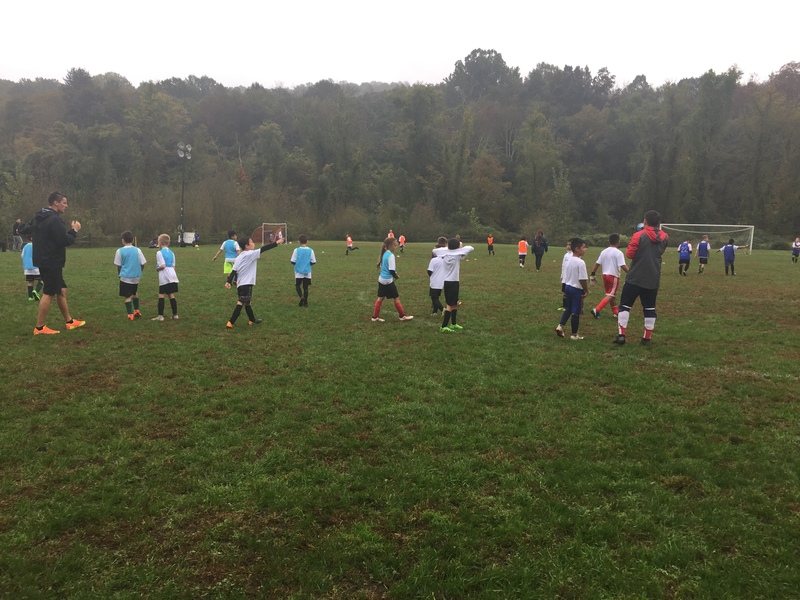 The tournament had two time slots with 4 different divisions. 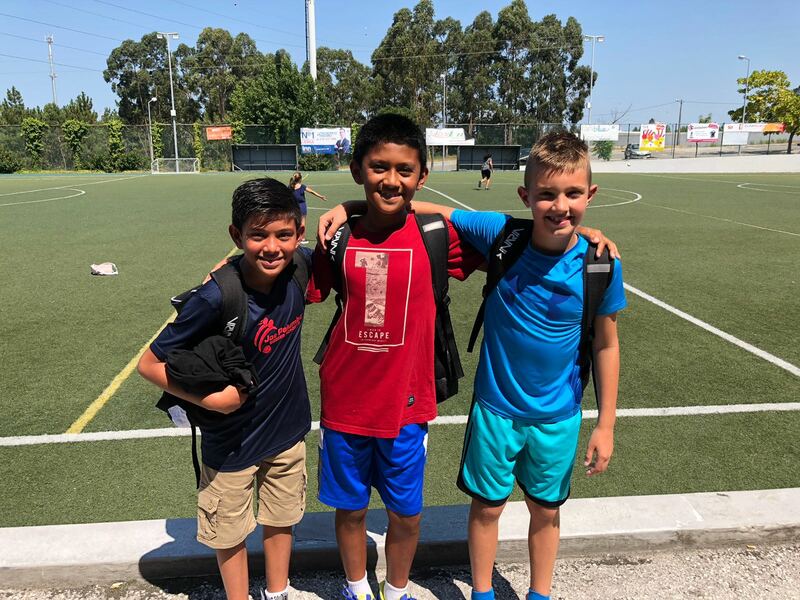 The morning began with our youngest age group participating in the JPSA Portuguese Primeira Liga and consisted of the following club teams: Benfica, Porto, Sporting, Braga and Benfica Jrs, Porto Jrs, and Sporting Jrs. 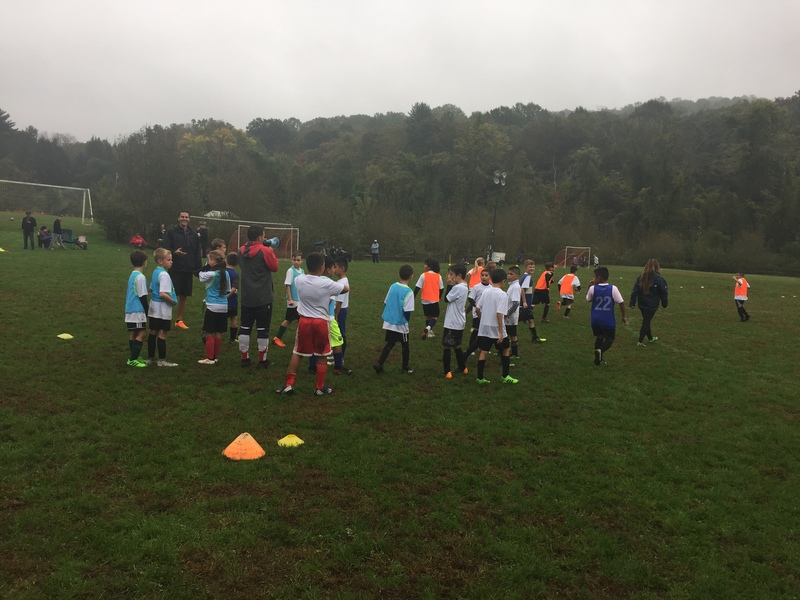 The start of the tournament games was delayed slightly because of some last minute transfers amongst the participating clubs. 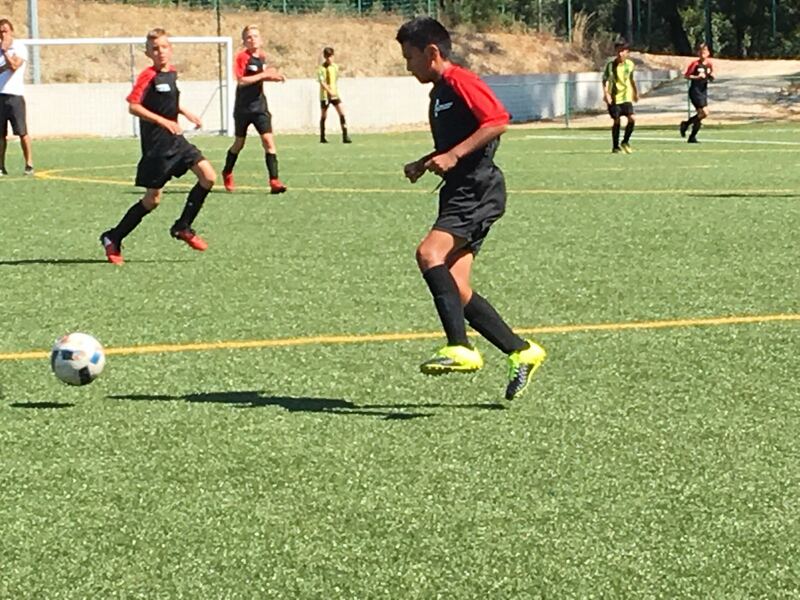 The games opened with a 1-1 tie between Benfica and Porto and Braga over Sporting with a 2-0 score line. 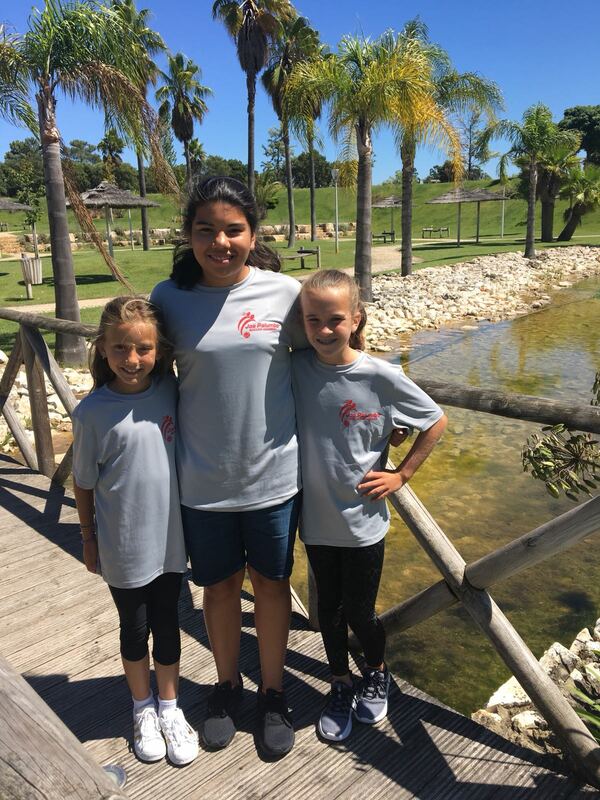 In the Jr. 3 team round robin Sporting Jrs. were dominant in the 1st game with a 3-1 win. 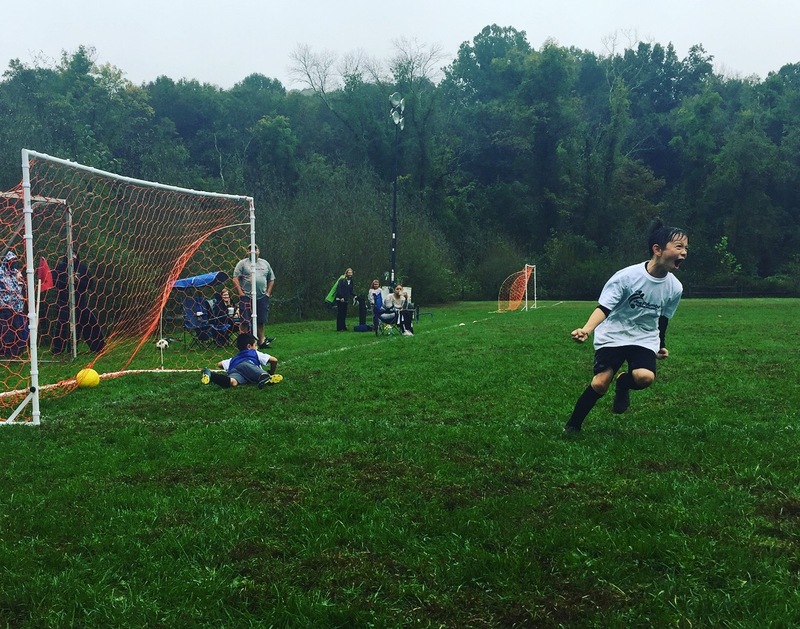 The games that took place in the first bracket were exciting, competitive and all close. This shows that the last minute transfers worked out to improve the quality of the tournament. 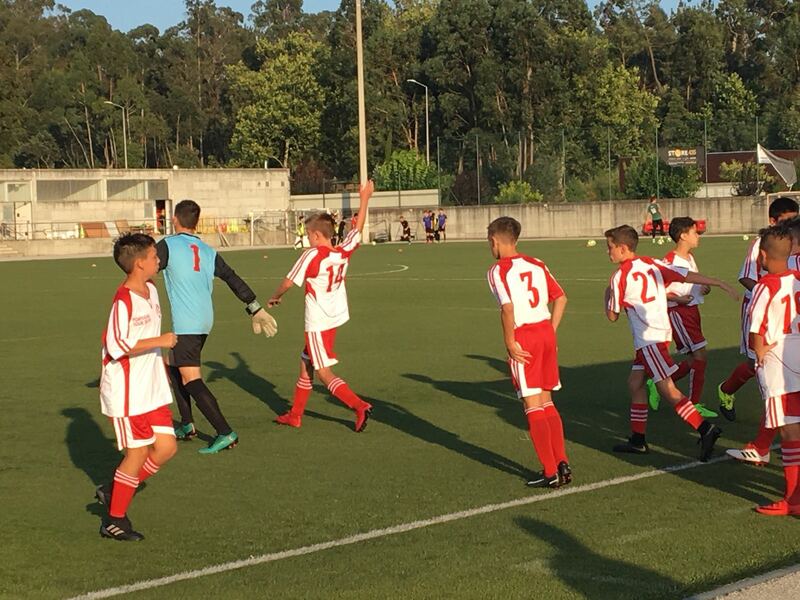 The semi- finals for the senior teams was as close as it could be with Porto beating Sporting by a 1 goal margin and Braga eliminating Benfica in penalties! This now set us up for a Final that consisted of Braga and Porto for the Seniors, and Benfica and Porto for the Juniors. We separated the Sporting Jrs. as they proved to be very strong in the earlier 3 team round robin. 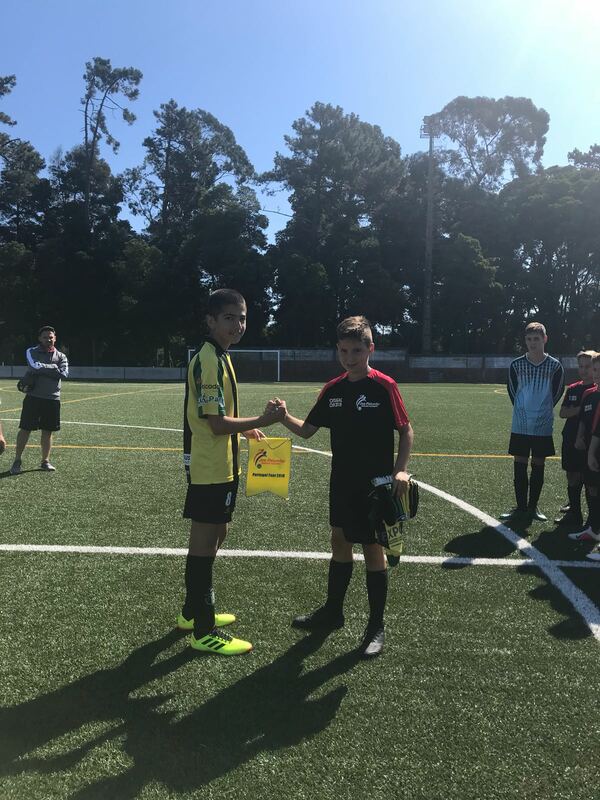 There were, goals, assists, tackles, tears and more in both finals but it finished with the champions of the first time slot going to Braga and Benfica Jrs! Congratulations!! 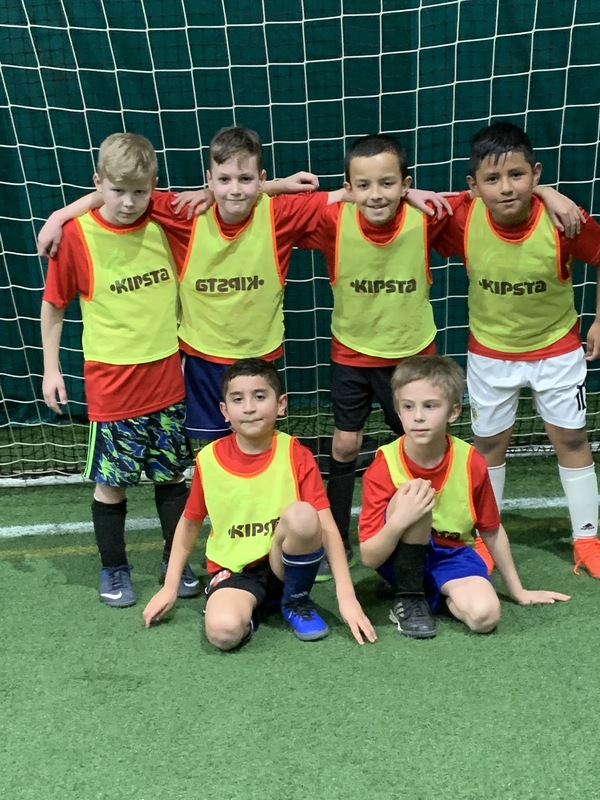 Our second time slot for the tournament also had two divisions which were labeled JPSA La Liga and JPSA Serie A.
JPSA La Liga consisted of: Sevilla, Real Madrid, Barcelona and Atletico Madrid. JPSA Serie A consisted of: Juventus, Inter Milan and Roma. 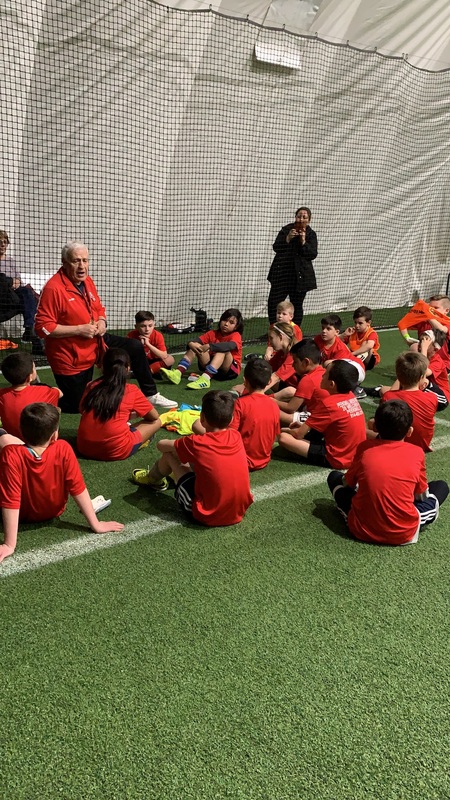 Many of the players lived up to the names of their teams as the coaches, siblings and parents were spectators of skillful players, healthy competitors and hard working players looking to win but enjoying each game that was played. The games were again very close in score line and similar to the first division. 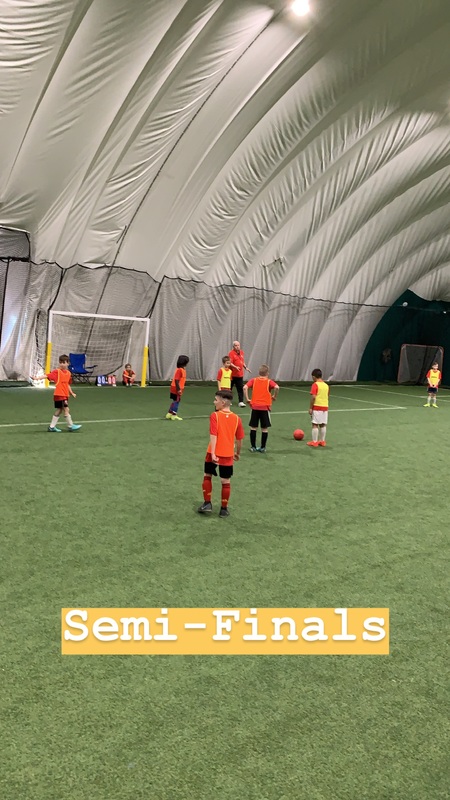 One thing that happened in the age group that normally does occur in our infamous JPSA tournaments is the last place team making it to the finals. 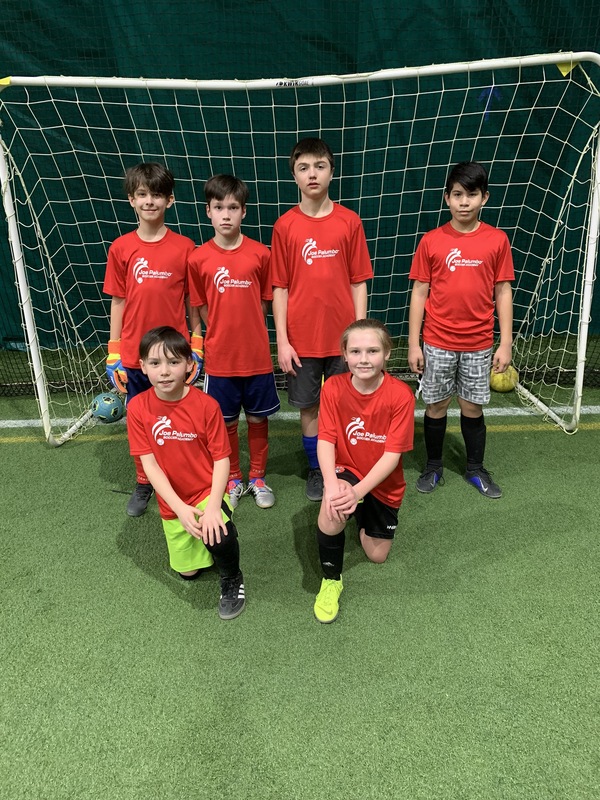 Barcelona happened to finish in last place after the round robin games however battled to a 2-1 victory over Real Madrid who were the heavy favorites. Now I believe there was some controversy involved in this game as the 2nd goal might have been not fully over the line and JPSA has already begun discussions on if VAR should be used in these tournaments. We will keep you updated on this and hopefully we will have a decision before out Veteran’s day tournament on November 12th. If VAR is not used by then I trust that the players will respect the call of the coaches and continue their best efforts throughout the game keeping in line with our motto of sportsmanship. The Serie A Division had Juventus as the favorites going into the finals as you would expect! 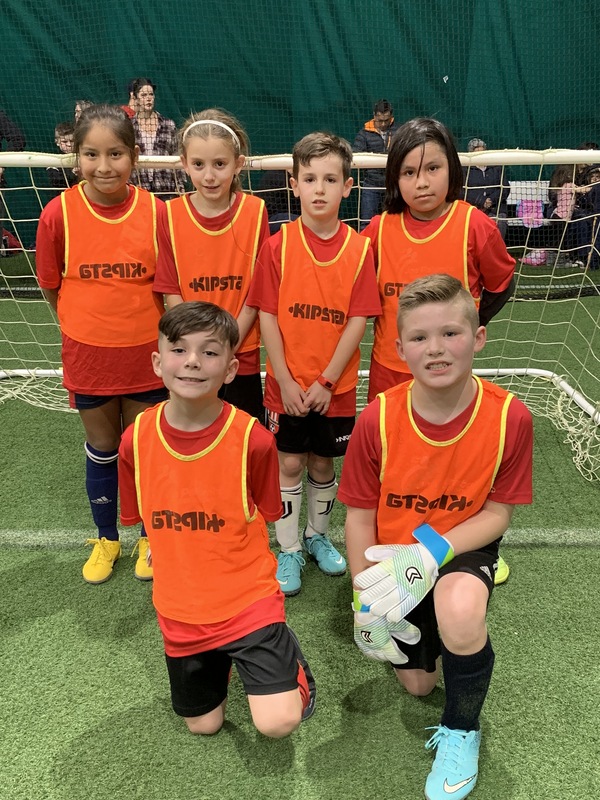 The games were very close and open as these games had higher score lines that the other division but this could have been due to the goal size as well as the non interest of some playing in goal. 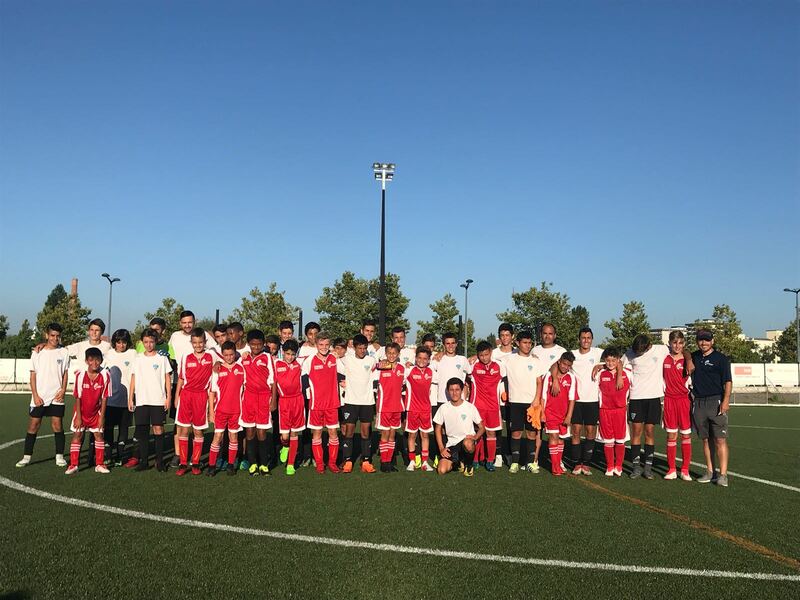 The finals ended with Juventus winning the JPSA Serie A division and Atletico Madrid winning the JPSA La Liga División. Throughout the competition both of these teams showed their quality and were probably the two most consistent teams on the day! 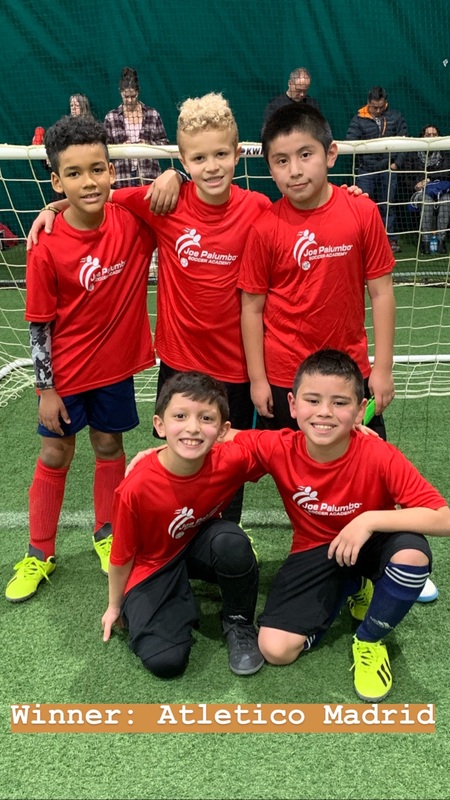 Once again, this tournament was a successful one in reiterating our motto to players who attend any of the JPSA programs. 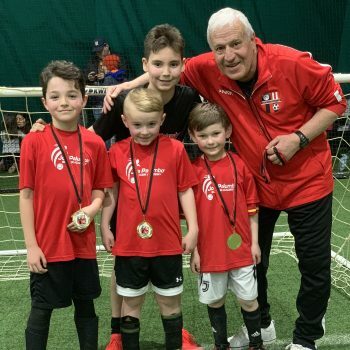 The goal of these tournaments is to welcome all players who love the game, respect the game and want to compete with and amongst players of the same interest. 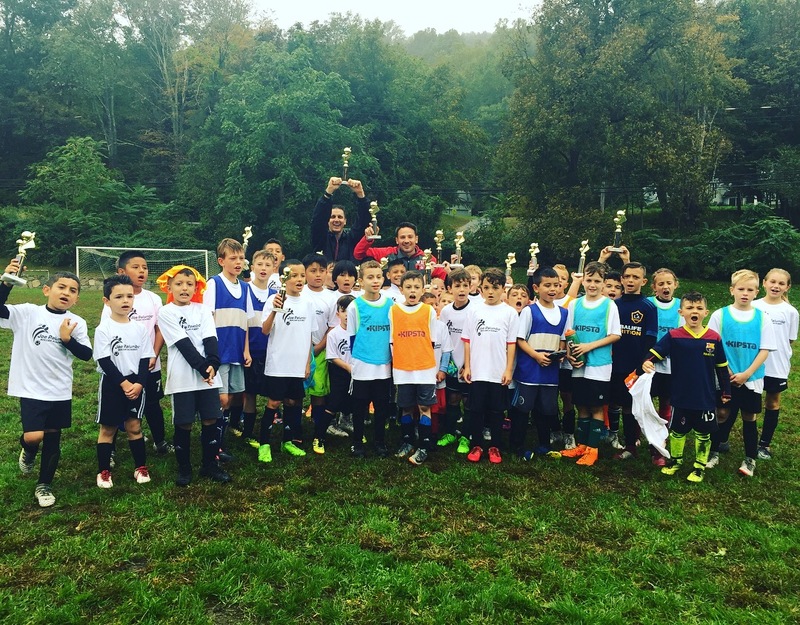 There is a difference between a team competition and our individual tournaments. 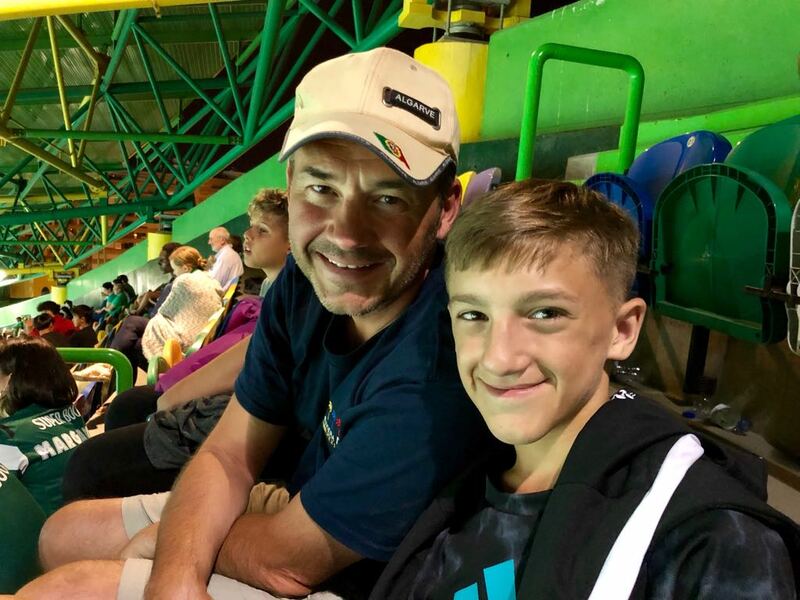 The strategies or tactics that need to be implemented in these tournaments come from the players themselves and not a set coach on the outside giving set instructions. 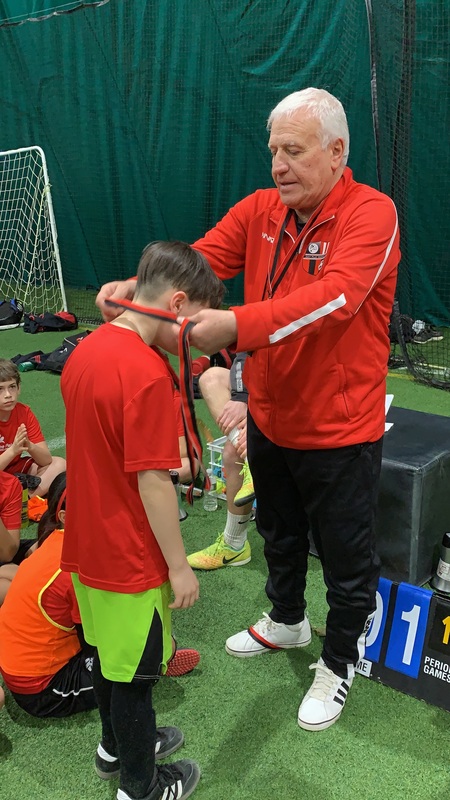 There is an ownership of the game that comes from the players knowing that they don’t have a coach but they have a trainer or teacher who is guiding them at times in the game or commentating on the great pass they just made. 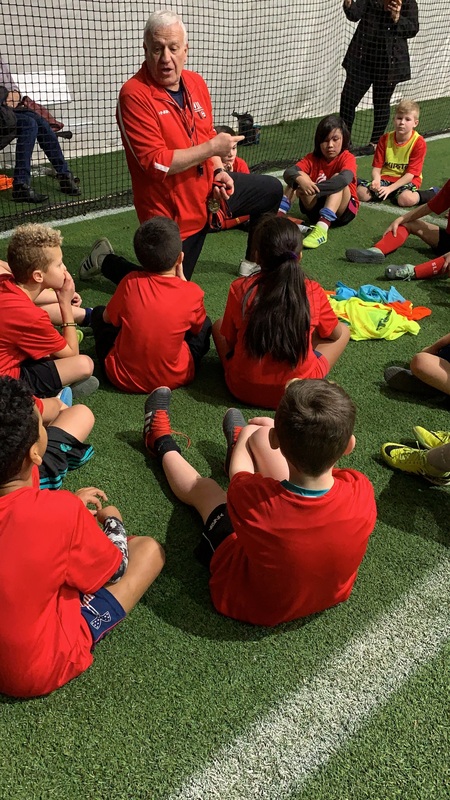 The game of soccer is for everyone who wants to play it, watch it, listen to it and learn from it. 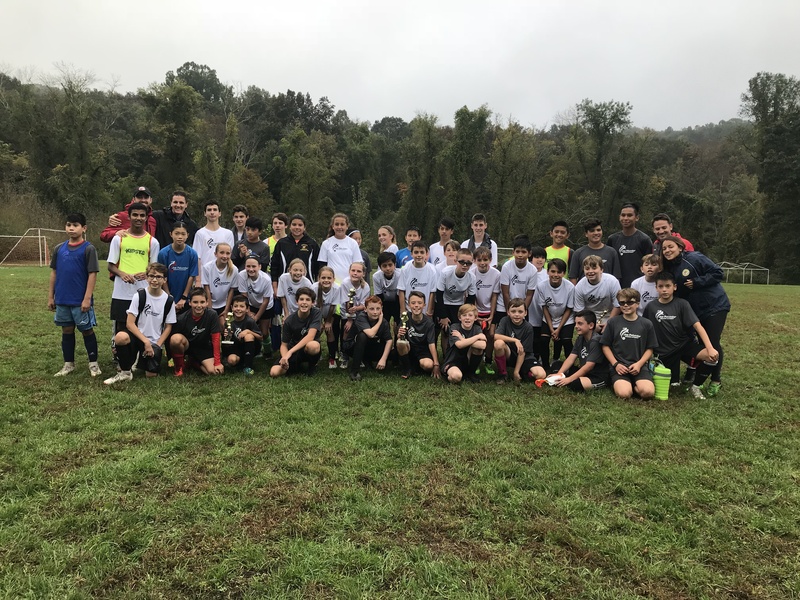 Thank you all for attending our JPSA Columbus Day Tournament this past Monday and we look forward to seeing you all again at our next one! Today would be the 4th game in one week for the boys and it happened to be the hottest day of the week so far. 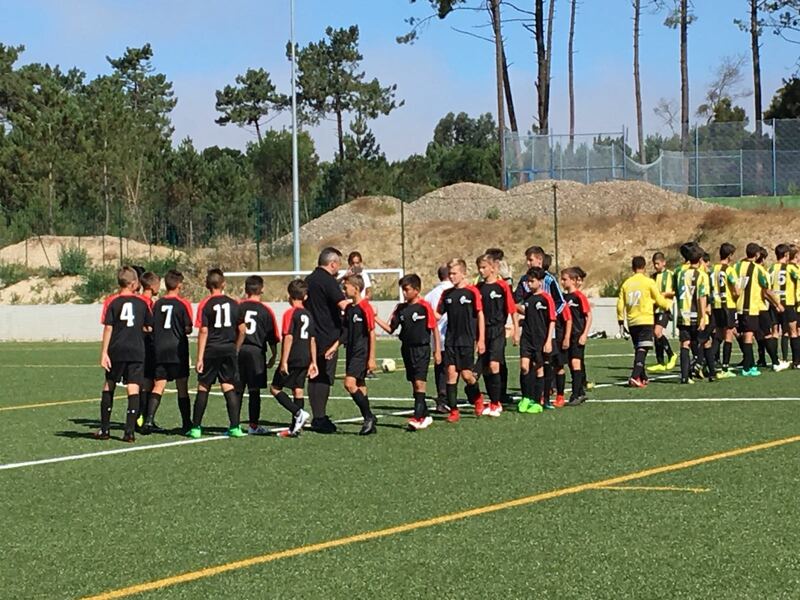 They would be going up against Leiria 2005s. We decided to do three periods of 20 minutes because of the heat. 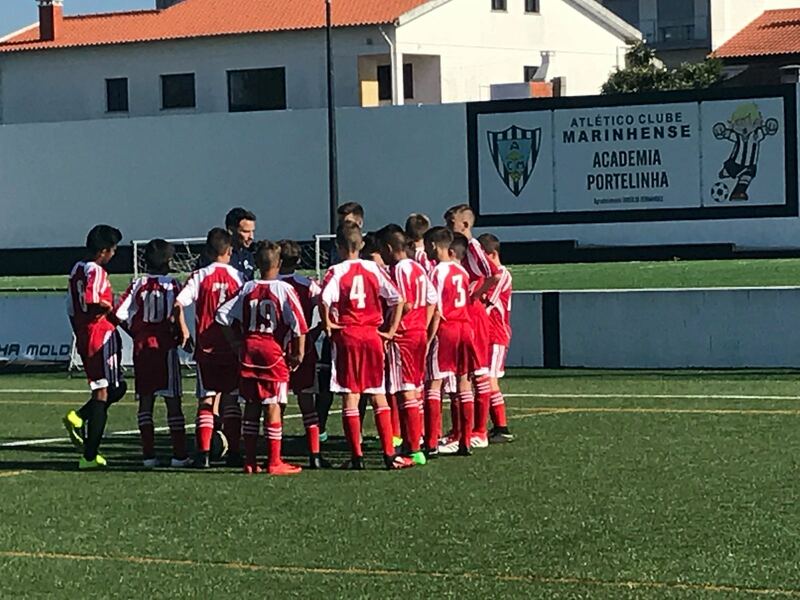 Leiria was a better matchup for the boys as they were closer in age and physically not as dominant as the past teams they have gone up against. 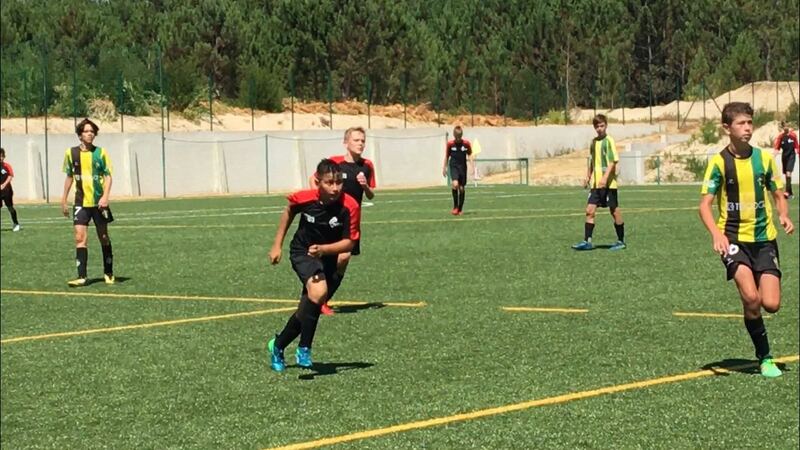 Leiria showed quality in their possession of the ball and continuous play from the back. Especially with the heat the boys found themselves a little tired and disconnected when pressing. Leiria took the lead in the 1st period and continued control up until the last 15 minutes of the 3rd period. 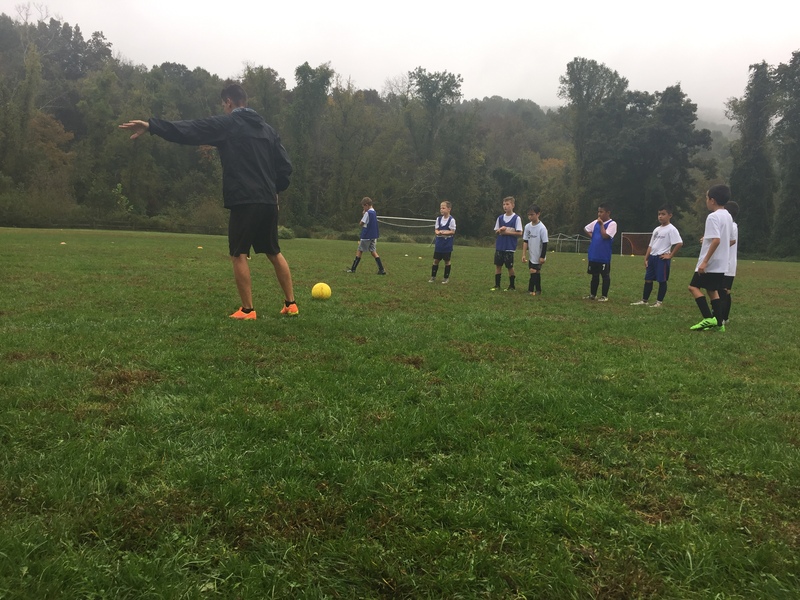 Our boys found more of a rhythm and energy to close spaces quicker and cause mistakes closer to their goal. AJ won a ball took another player on and got taken down inside the box for a penalty. Although we missed the penalty by hitting the post, this was the start of the boys come back. 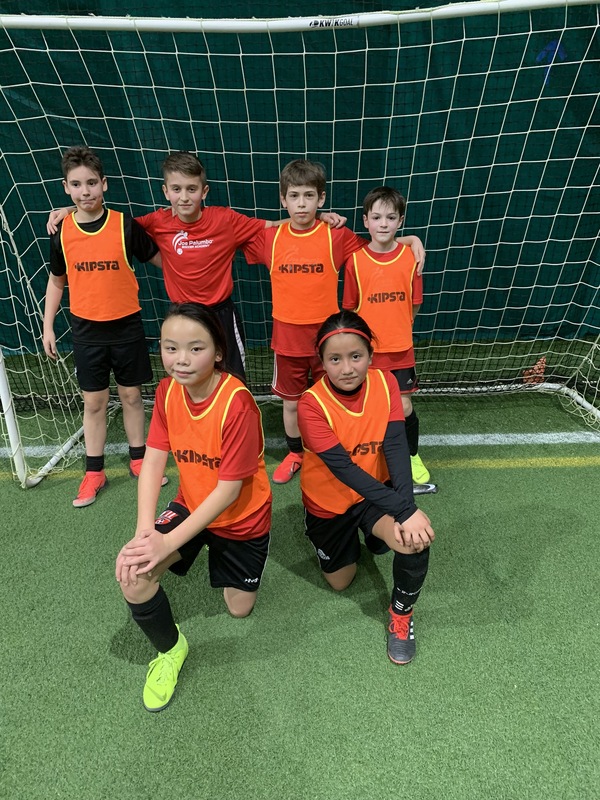 They continued to press higher up the field and eventually cause another mistake in the middle for Alex G, Connor, Neel and AJ to combine for the tying goal! The boys deserved to score based on their effort in these final 15 minutes but with respect, Leiria was a good team that created many unfinished chances throughout the whole game. 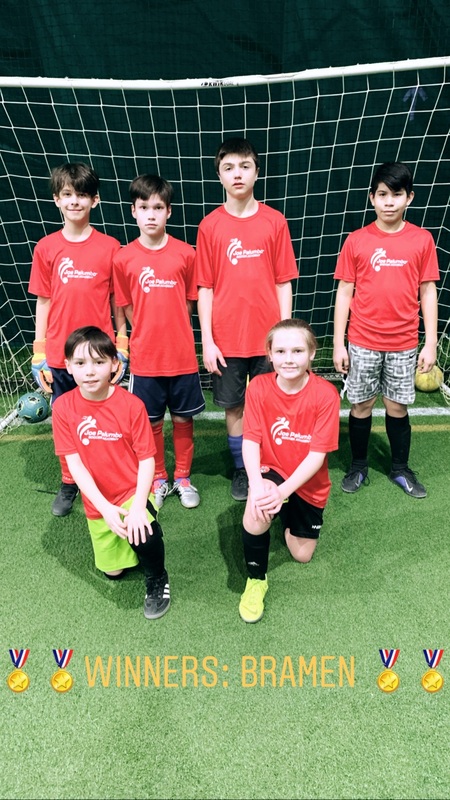 They are a real team one year older compared to our mixed Academy group that is a few steps ahead on certain concepts. 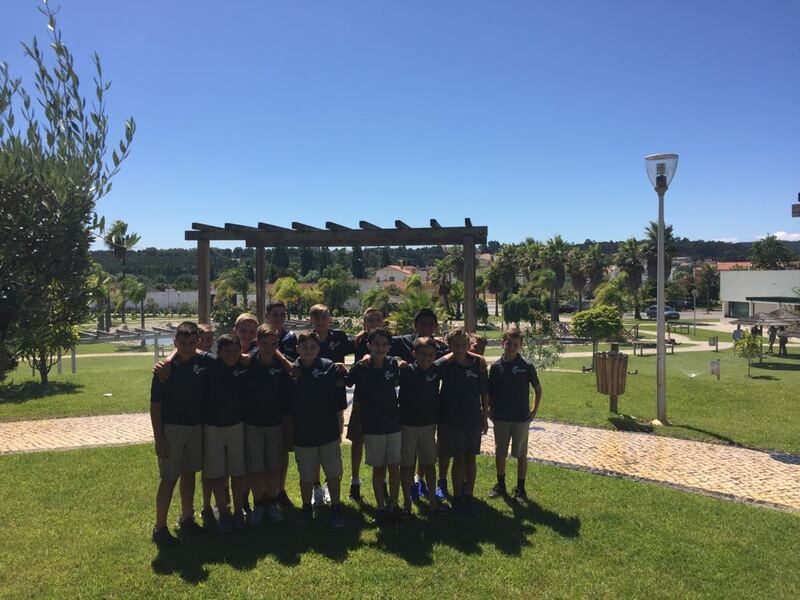 The game was a good start to another long day ahead with a lunch at O Telego which is a beautiful wedding venue in Rio Maior. The restaurant is a family owned business that cooks daily and only opens for lunch with walk-ins. The food was very good and a buffet style so everyone could pick what they liked from octopus to beef to fish. 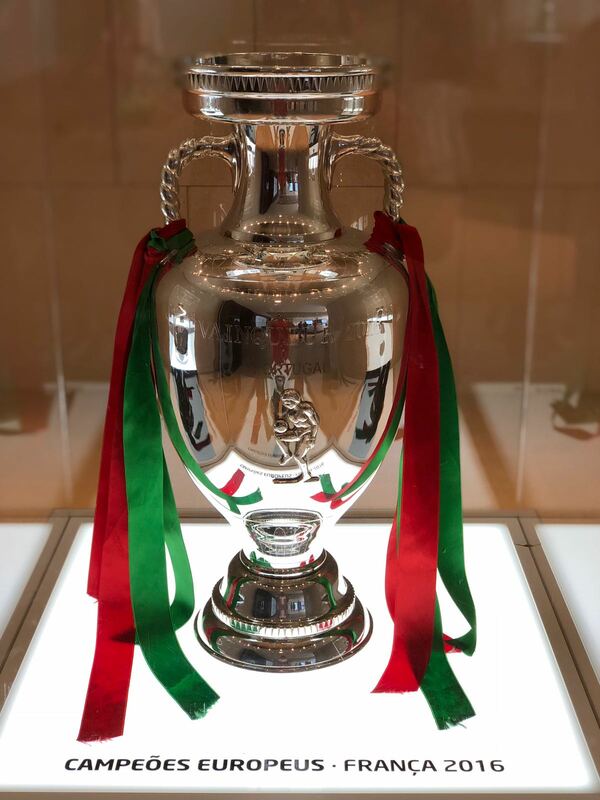 After lunch it was time to head back to Lisbon for people to tour Lisbon before attending the Sporting Setubal game. Upon arrival in Lisbon we decided to spilt up so everyone had the option to see what they wanted in a larger city. It is a beautiful city however there was this semi-important game on that some of you might have watched. Juventus against Chievo Verona @ the stadio Bentegodi. 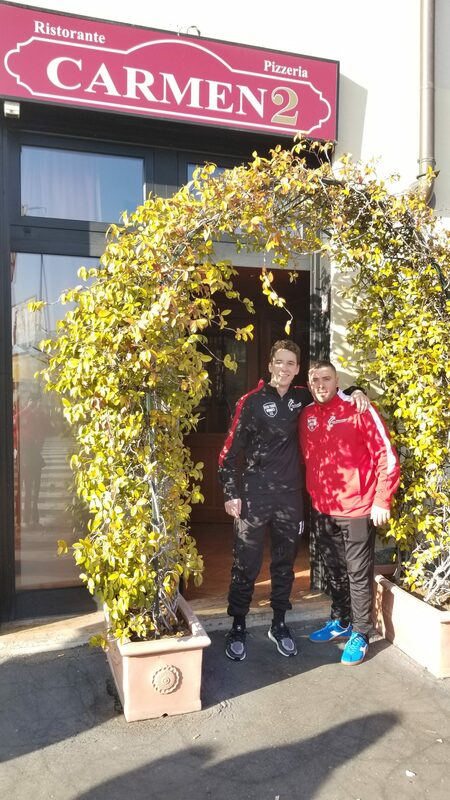 This would be Ronaldo’s first game with Juventus and it only made sense to find the CR7 hotel in Lisbon to watch the game. To no surprise the place was filled with ronaldo and Juve fans for the game. It wasn’t the easiest game for them to start off the season but they were able to squeeze out the victory 3-2 if you didn’t catch the game. This game brought us right to our meeting time so we had to report to the bus and start our trip to Sporting Stadium. This would be the professional math that all the tour members would see. We arrived earlier so we could eat and drink before going in for the game since it was a late kickoff! The game had 36,500 in attendance for their home opener. To be honest it made the game that much more exciting having a good turnout for them in a stadium that holds 45k. The people came to watch and support their favorite team but is wasn’t the best of games that I have seen live. Nani scored twice for Soorting and the game finished 2-1 but it was a lower level game. 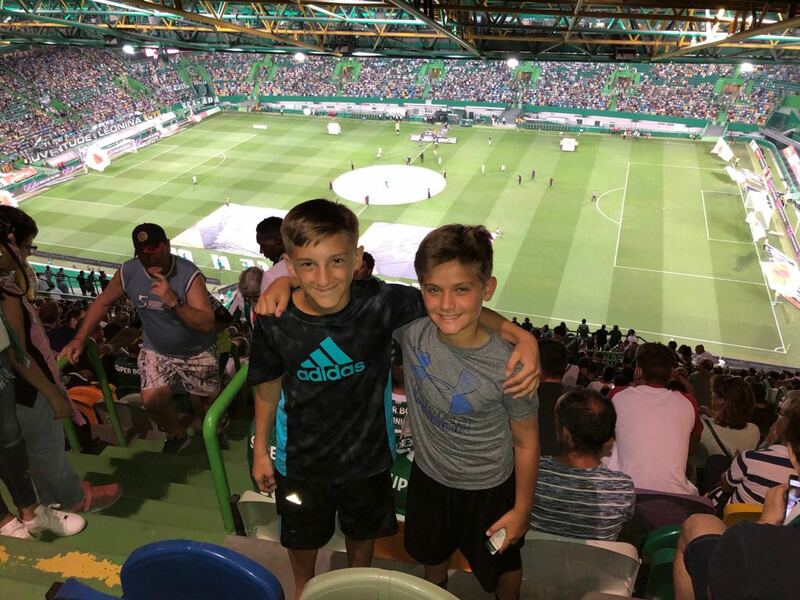 The unexpected mistakes from both teams was surprising for this level and I doubt Sporting will be fighting for the title if they continue to play this way especially against Benfica and Porto. 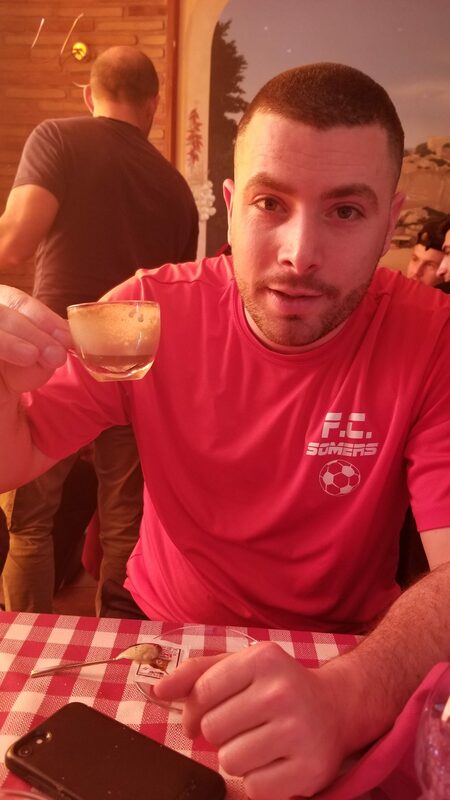 Overall I believe everyone enjoyed the experience and got to see the love Portuguese people have for their club, their team and colors. 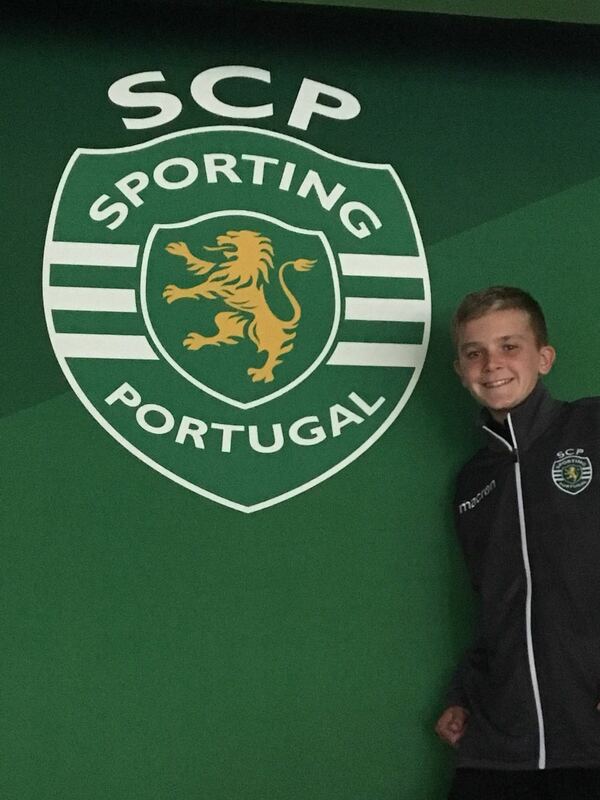 So congratulations to Sporting for going up to 6 pts for the league so far with 2 wins. But Benfica and Porto are in the same situation as Benfica also won tonight 2-0 and Porto most likely winning tomorrow against Belenense. 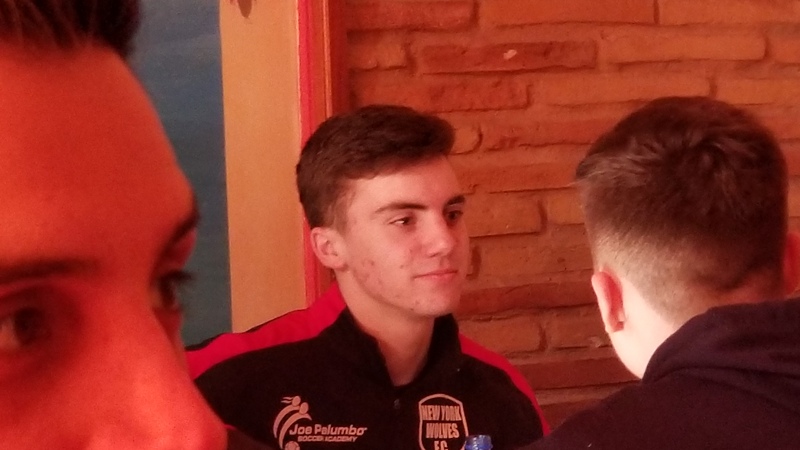 We will see how that all plays out but we got our first goal of the week today, got our first result with tying 1-1 and we are all looking to finish the tour strong with the game against ABCD tomorrow morning. Let’s see how it goes tomorrow! Thanks! The 7:30am breakfast approached quickly as many were still dragging from the long day yesterday. 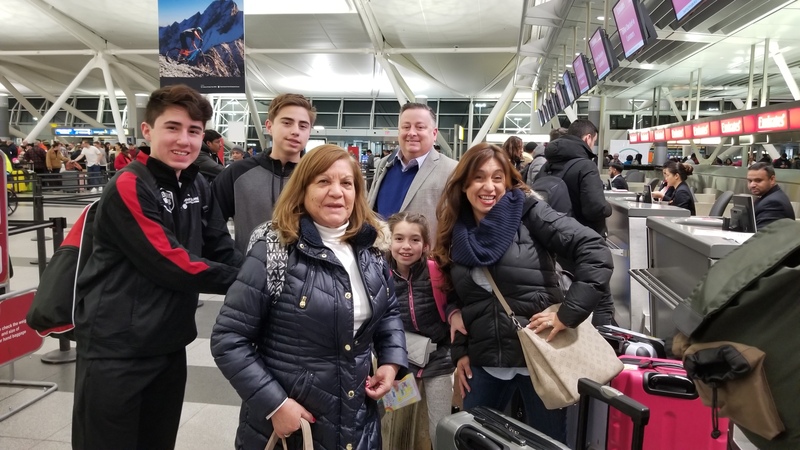 Everyone made it down on time or close to so we were able to eat and leave for Lisbon! 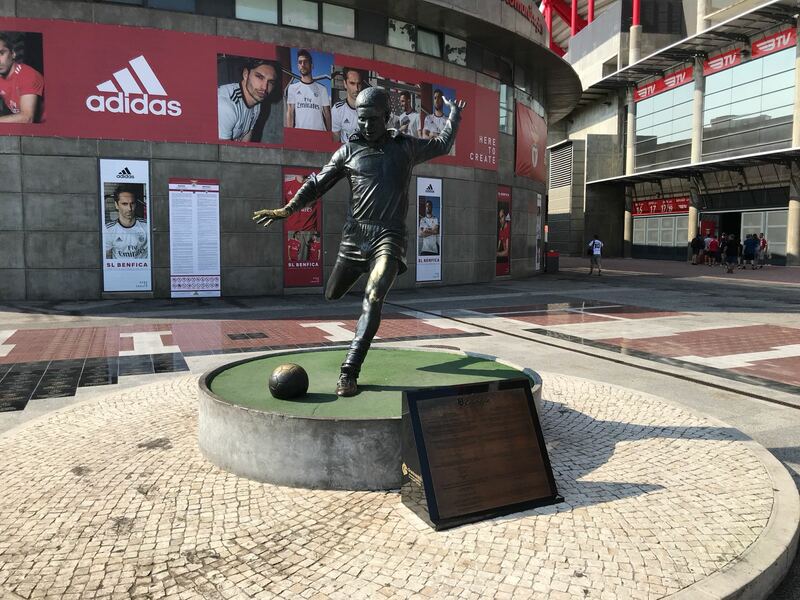 We had a 2 hour drive ahead of us to arrive at one of the most infamous clubs in the world Benfica. We would start the day with a tour of the Stadium. 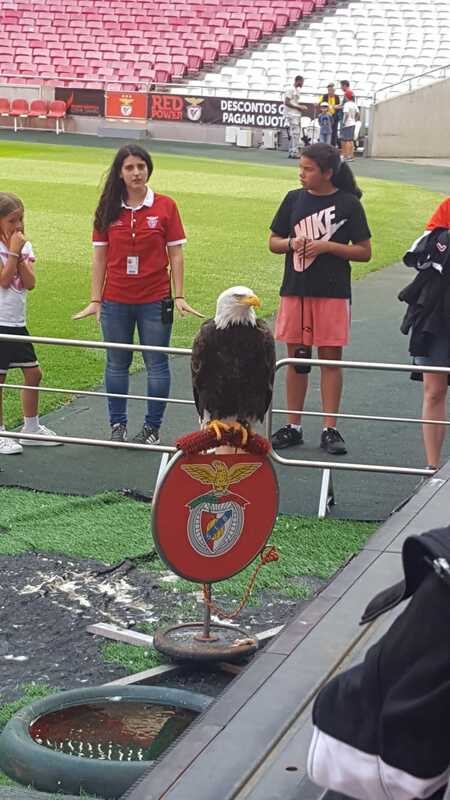 The tour guide brought us throughout the stadium showing us all that Benfica had to offer. 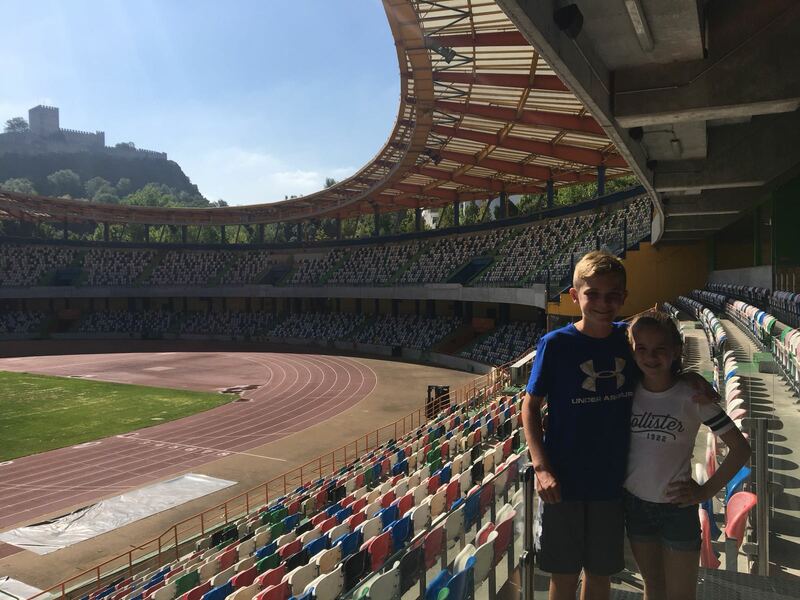 She explained the history of the construction of this stadium as well as the off site complexes for training. 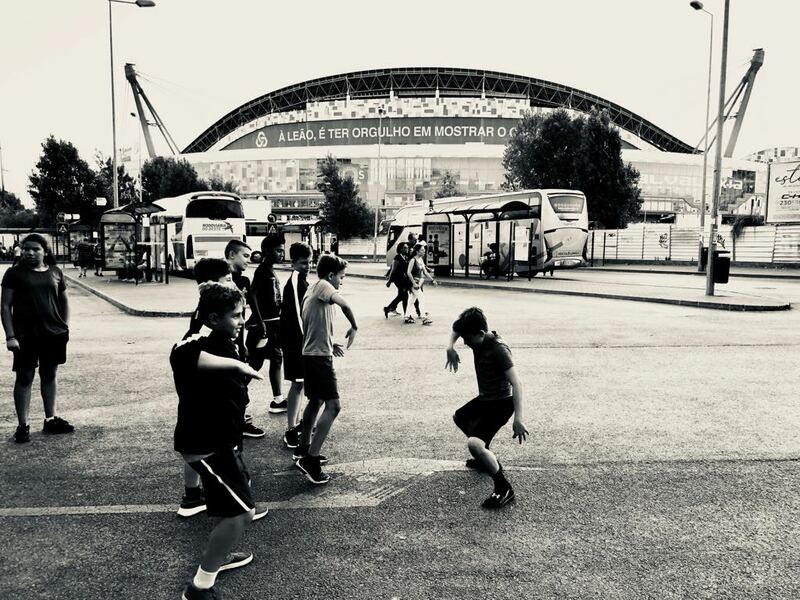 This Stadium has been used in the euro 2004, as well as the 2014 Champions league final between Real Madrid and Atletico Madrid and of course the home of all Benfica games! We were permitted into the press conference room, the locker rooms, the field level viewing and access to the VIP viewing area. 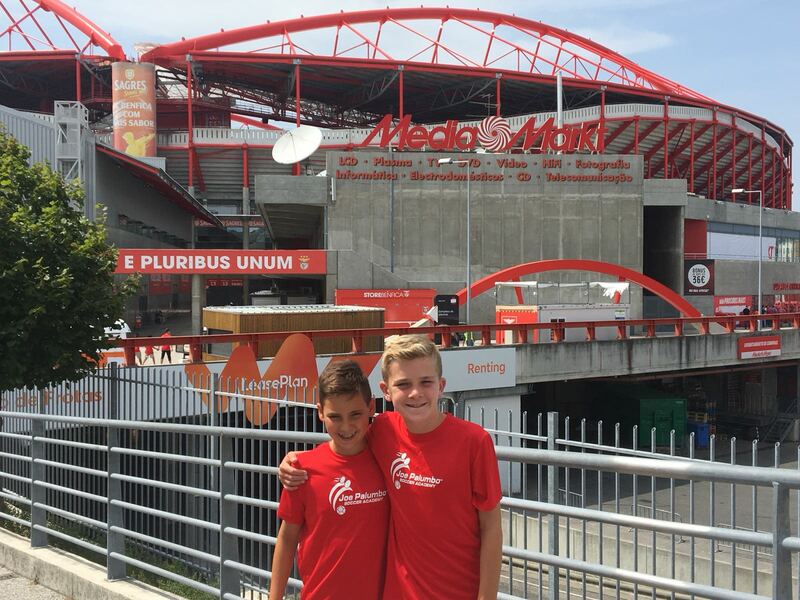 After seeing the Stadium at length we traveled to Cidade do Futebol. 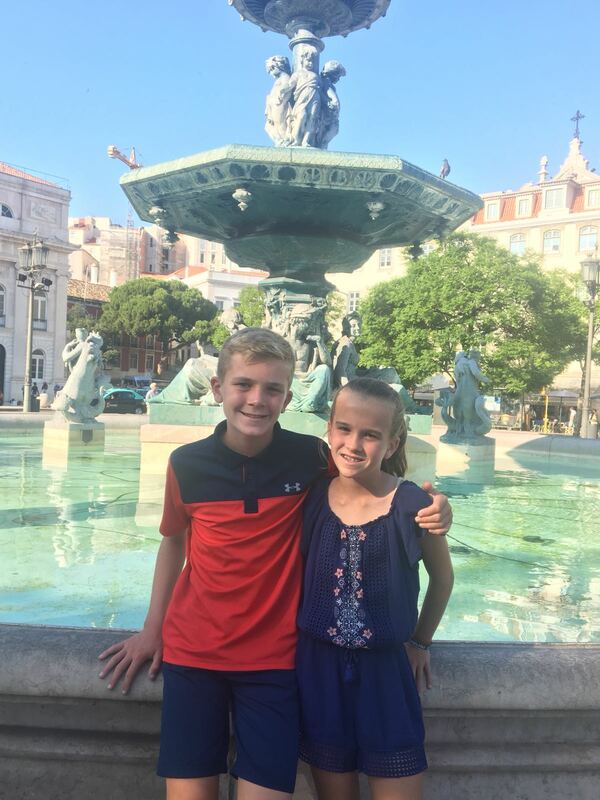 After a long morning of travel and touring it was time to grab a bite to eat at Lisboa burguer house and pizza. It was a very commercialized restaurant and different than many of the places we have been at throughout the week. 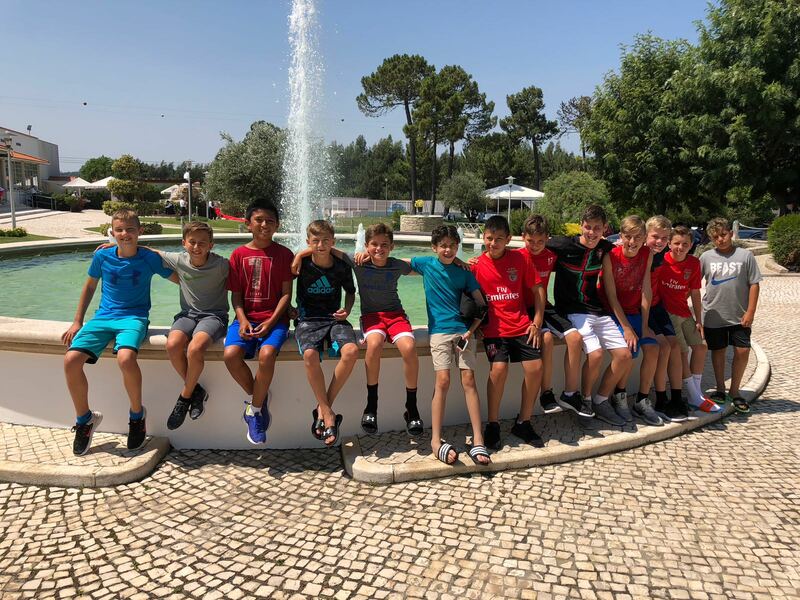 It was a nice lunch and separation before returning back to Benfica Stadium for our tour of the Museum and training session! 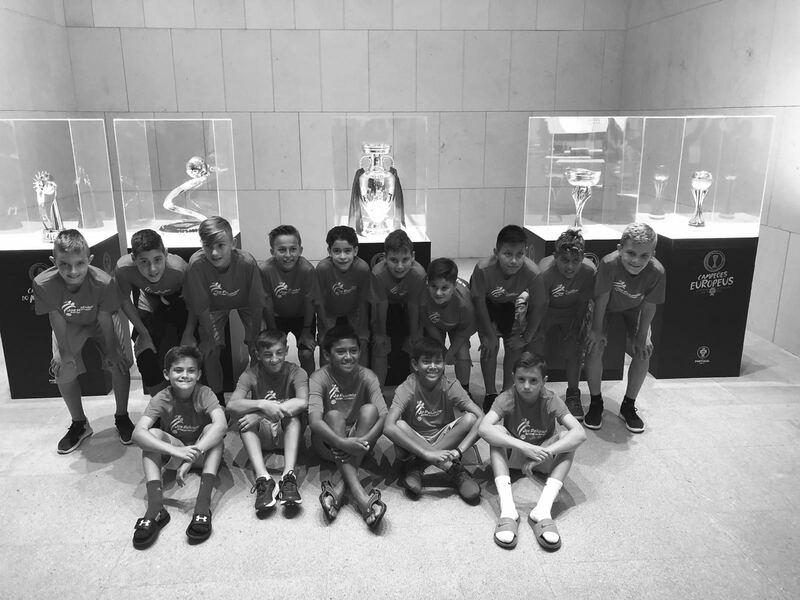 The museum felt a little too fast but the boys were able to see the incredible success of the club in Futebol but also many other sports. 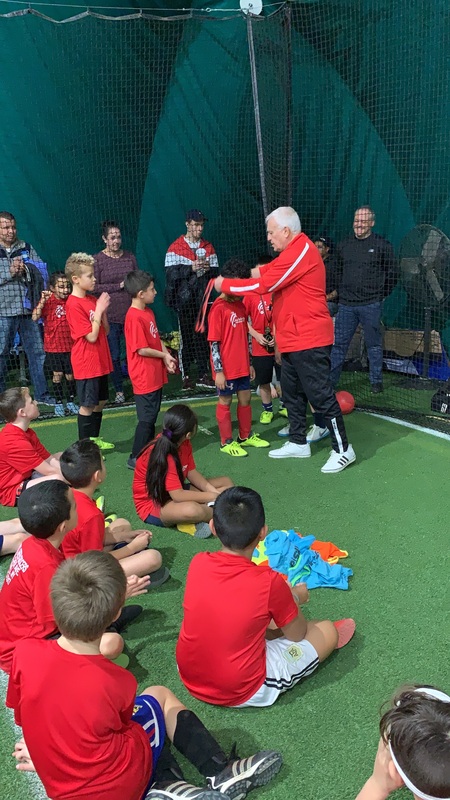 It is a winning Club who continues to impress newcomers and strengthen the passion of their long time fans! The trophy case alone had some of the boys not believing it was possible to win this much. 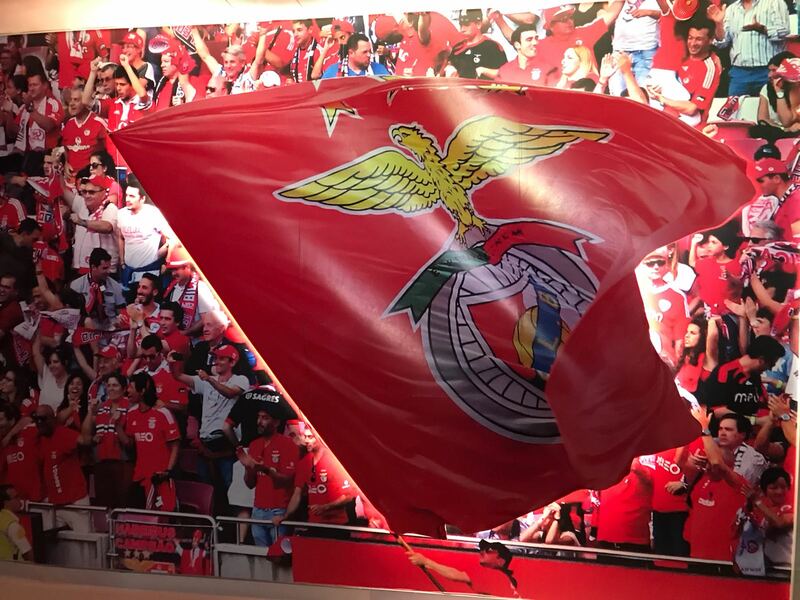 The museum is something that impresses everyone who enters as it is strategically put together to represent everything Benfica and the hard work that goes into making it an important club! The boys finally reached the time to train. It was a long day up to this point and I could see the kids were getting anxious to play. 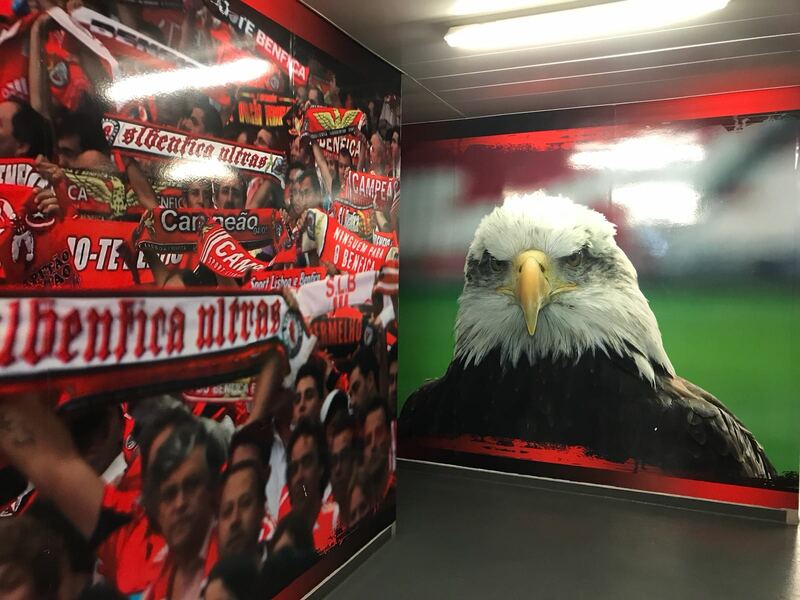 So we were fortunate to stay in the away teams locker room inside the Benfica stadium to prepare for training and return to after for showers. This isn’t just any locker room but more of a place where players/legends like: David Beckham, Ibrahimovic, Ronaldo, Pirlo, Raul etc. Have prepared for games. It’s tough for some of the boys to really understand how great it is to be welcomed into these type of places. 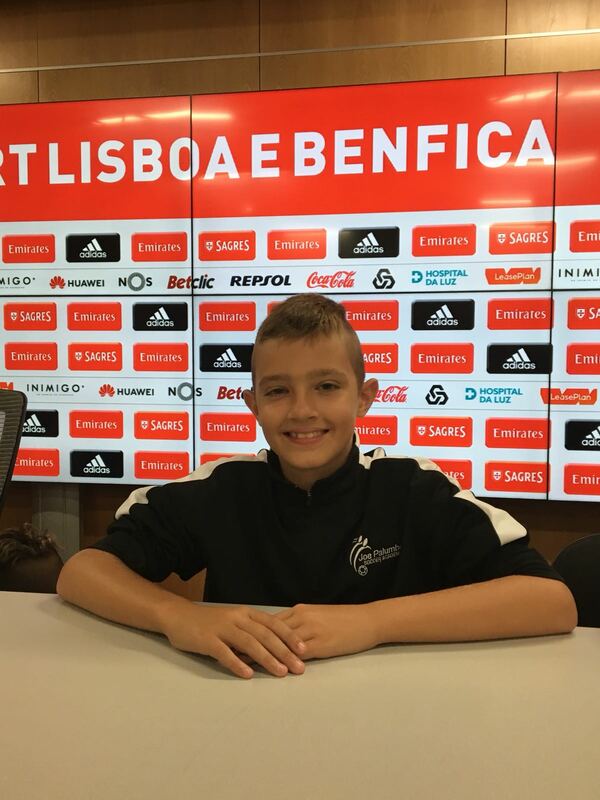 The training was run by Andre’ who is a coach of Benfica and assisted in coordinating all of the events of today’s trip. 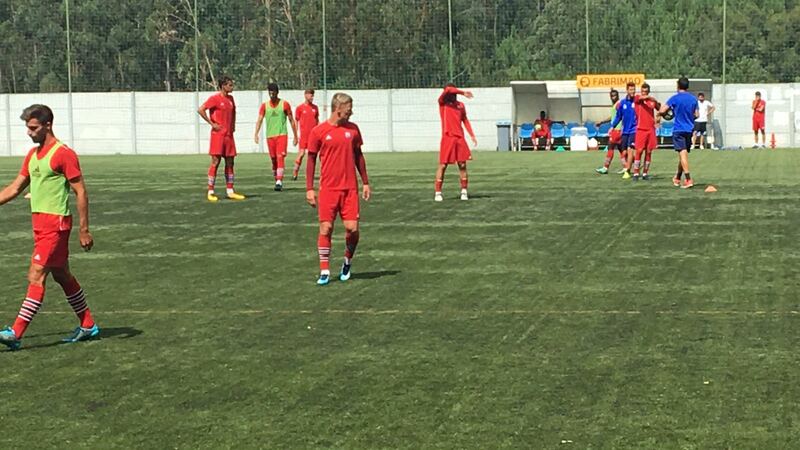 The session was enjoyable and many of the players enjoyed the training. 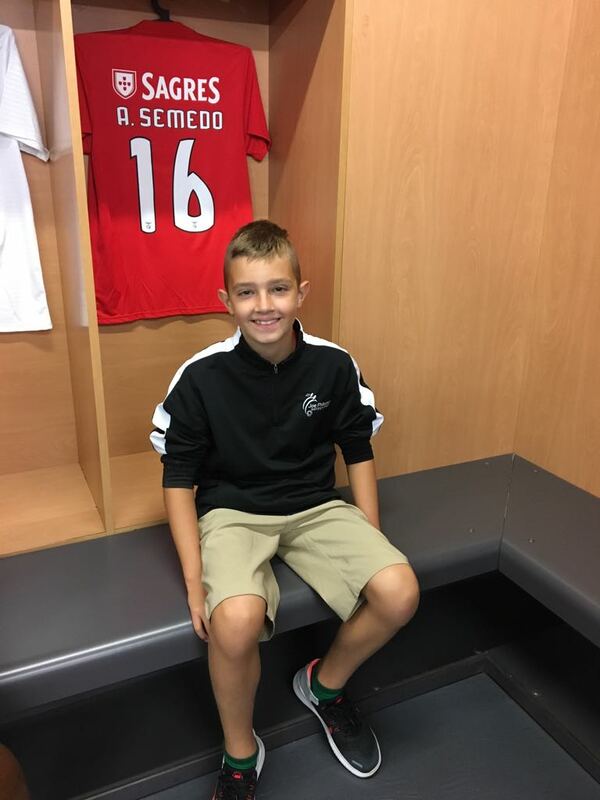 At the end Andre had some nice things to say about the boys in terms of their quality for the age group. He had something basic planned and they exceeded his expectations quickly which he was happy about. The training finished around 6:15pm we made our way back into the stadium for one final picture and straight to the locker room to shower and get on the bus for a return to the Hotel! We arrived at the hotel around 9:45pm for dinner and off to bed! 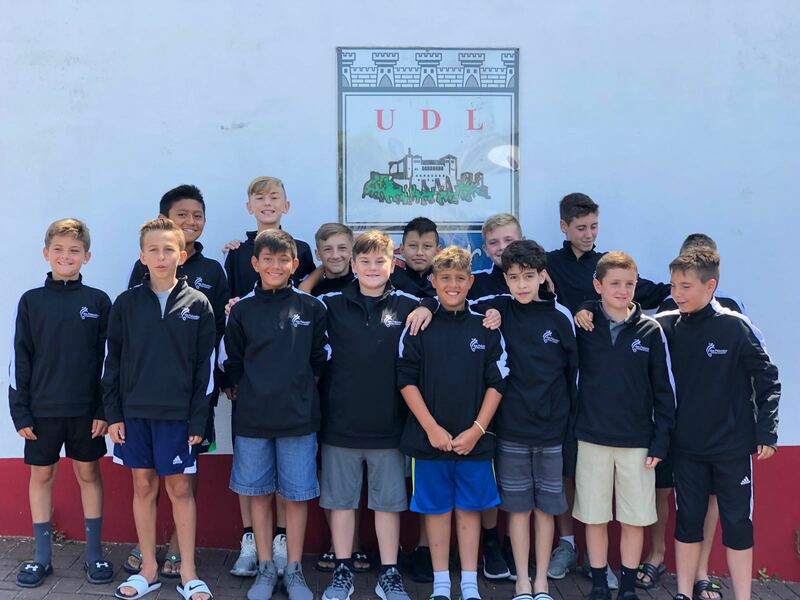 Tomorrow the boys will be playing Leiria in the morning then off to lunch in o tolego and then returning to Lisbon to see the city before heading to the Sporting game at night! Talk to you all tomorrow! What an eventful day! 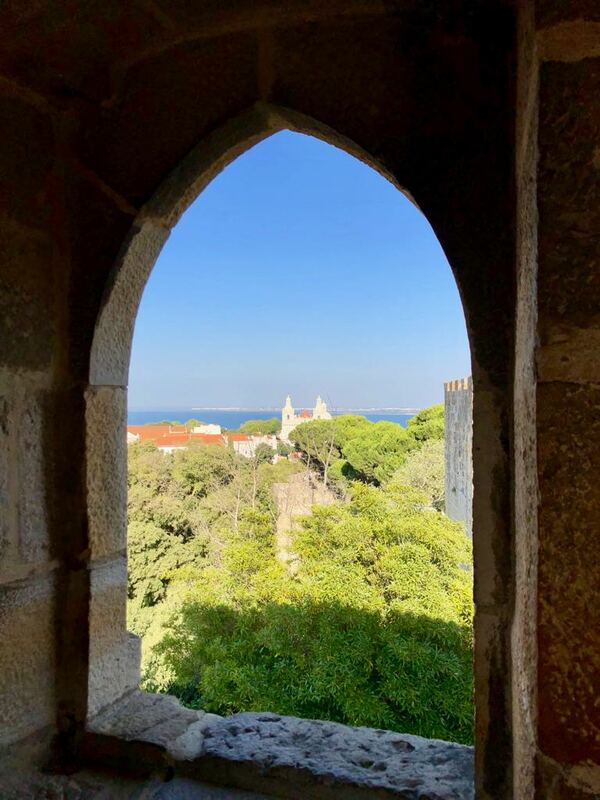 JPSA Portugal Tour 2018 – Day #4 packed schedule! 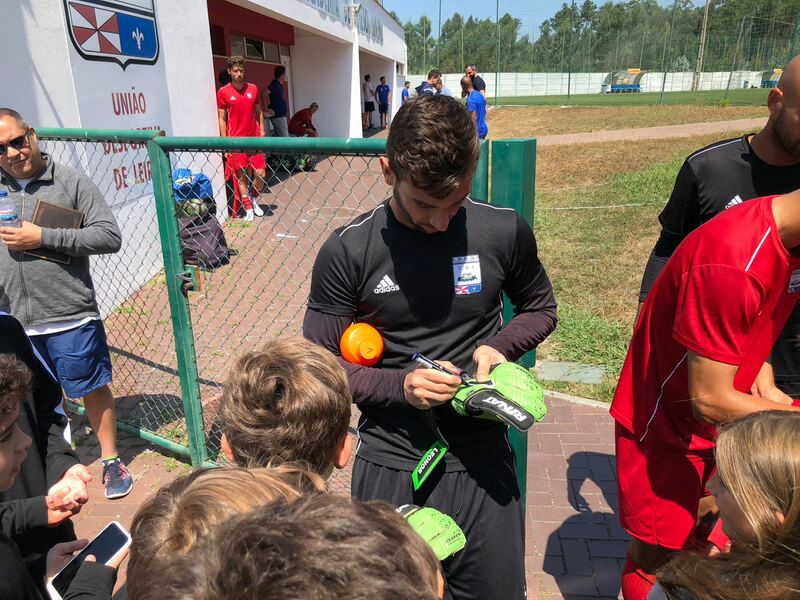 Professional training session of Leiria, a visit of Nazare and a game in Marrazes! 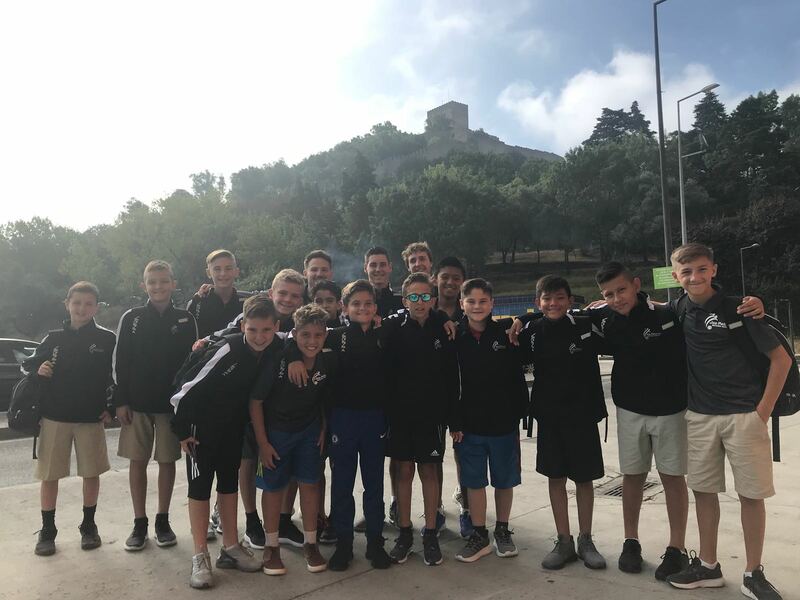 Another early start to our 4th day of the tour with all players and parents starting with a quick breakfast and a quick visit of the upper area of Nazare’. 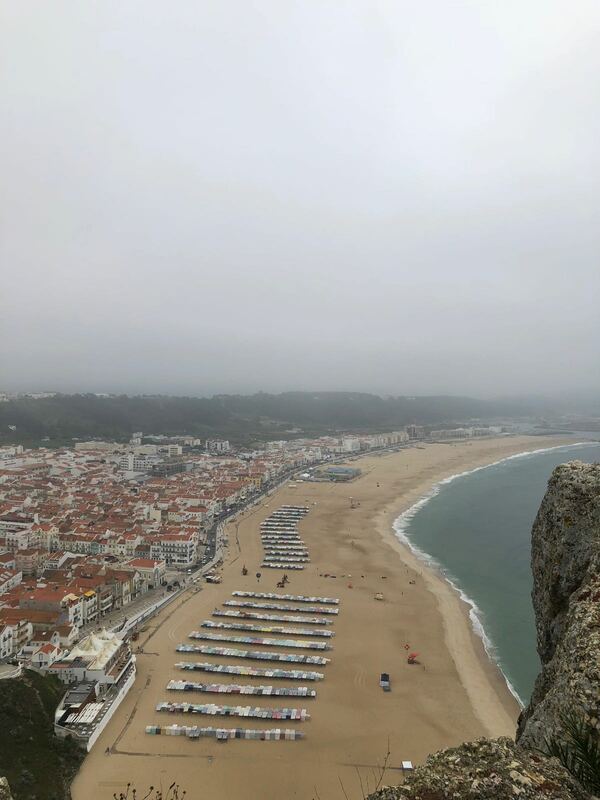 Nazare’ is a famous beach in Portugal where many surfers from around the globe come to face some of the largest waves in the world. 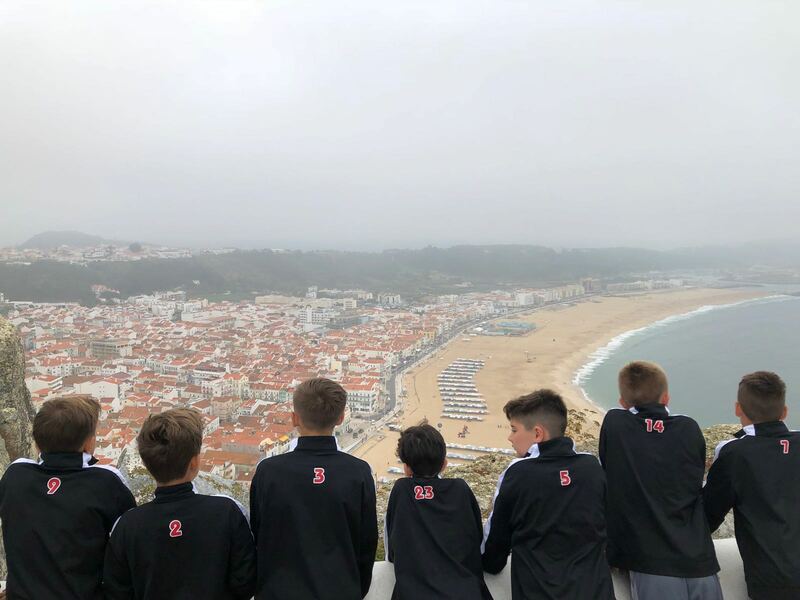 All of the players and parents were able to take pictures of the view overlooking the beach and buy a few personalized bracelets. 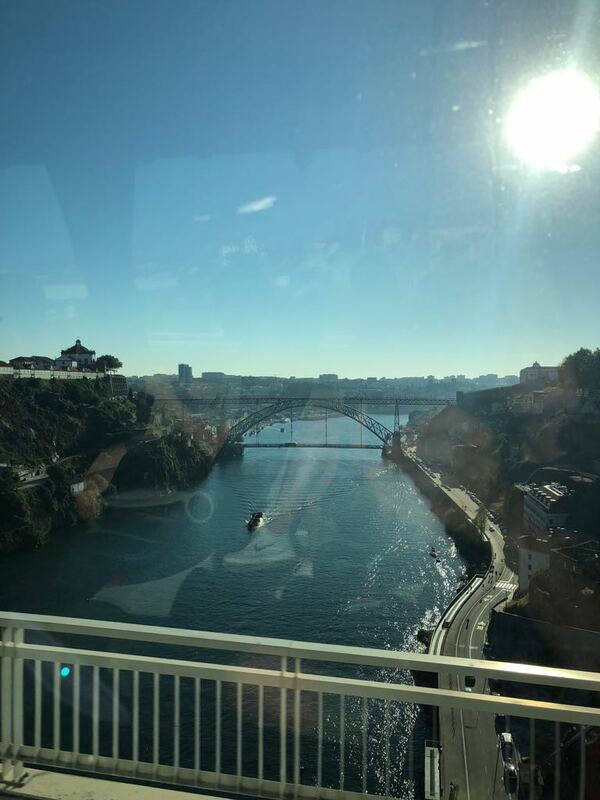 With the attractive views and early morning start we departed from Nazare later than we wanted to to make it to the first team training of Leiria. 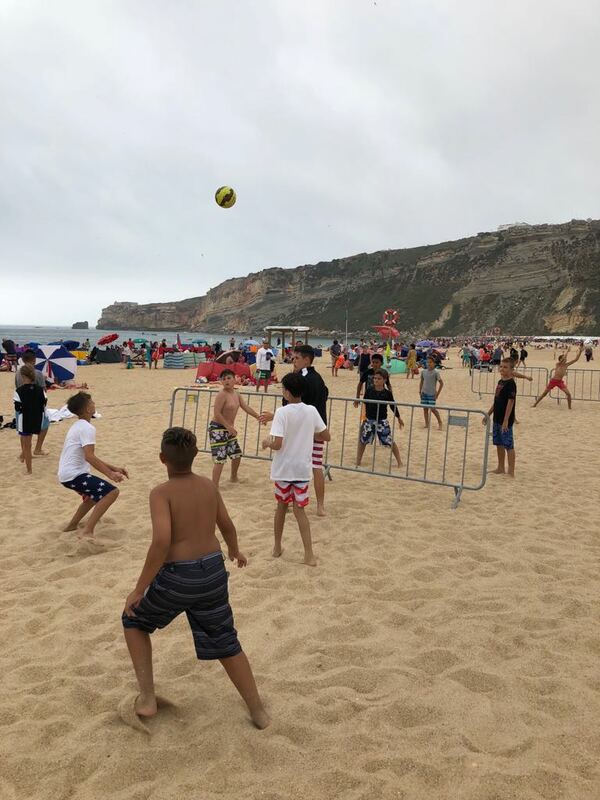 Some of the supporters stayed back and enjoyed the entire day at the beach while the team was mandated to go to the first team training along with any other tour participants that wanted to stay with the group.. 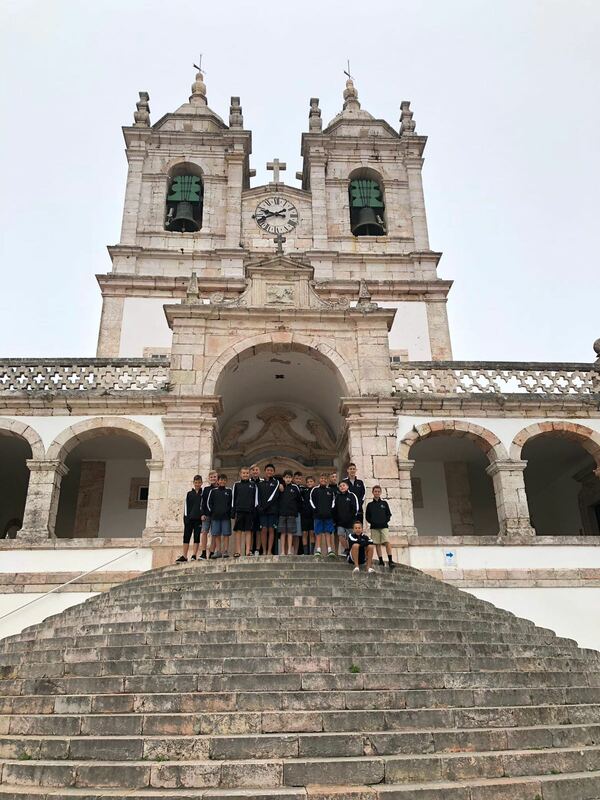 The training session was worth the trip back to Leiria as the boys got to see the high level that a 3rd division team possesses here in Portugal. The Russian owner of the club has been investing a lot in the past 5 years to gain promotion and reach his goal of arriving in the 1st division but it has not been easy. 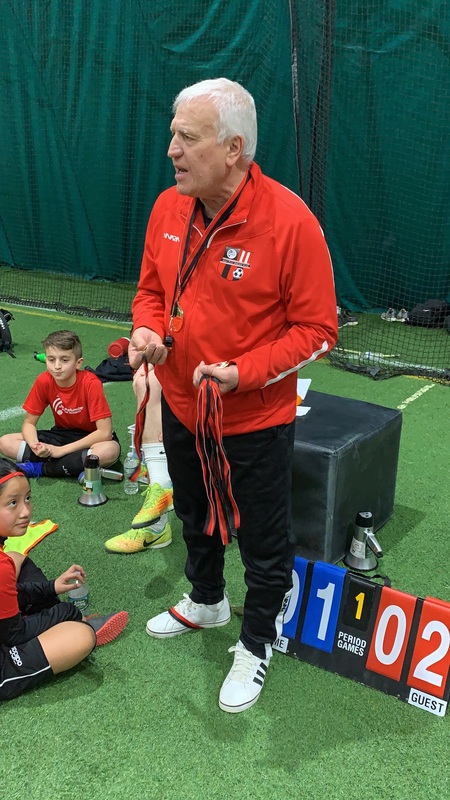 They had an undefeated season last year and were expecting a promotion however they tied their matches in the playoffs of the 4 regions to be disqualified from promotion. 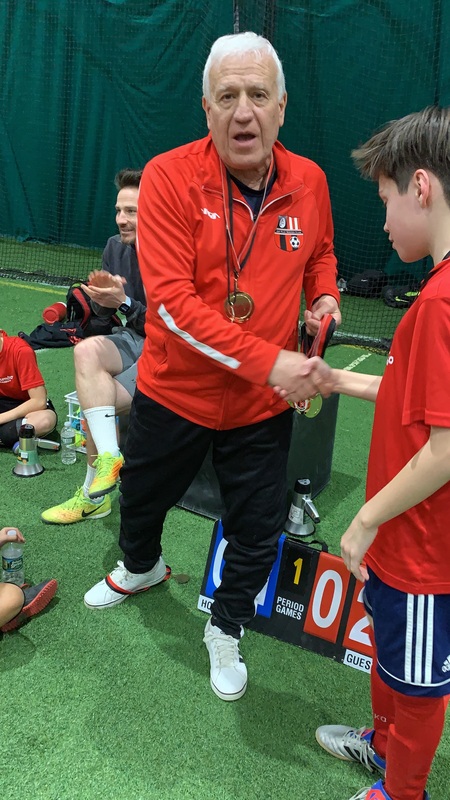 It is a tough season going undefeated and not gaining promotion, very similar to our 04’s season this past year who went undefeated in the Metro League but missed out on the final four by a point! The training session showed the coach going through transitional play and attacking from different areas of the field. 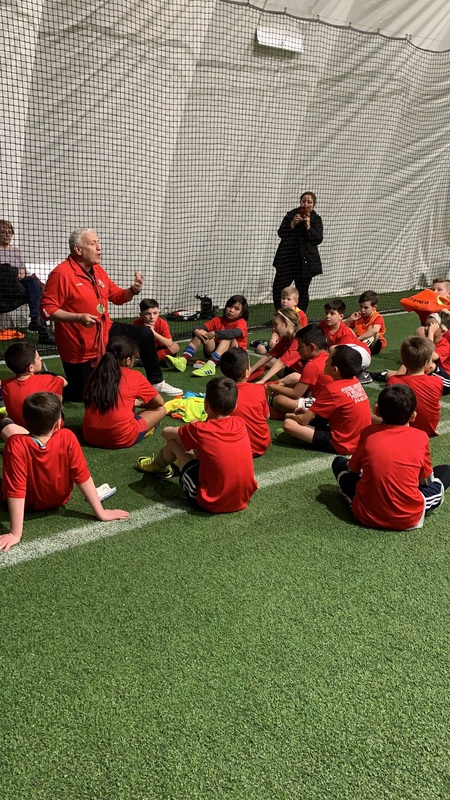 He was explaining to the team the tendencies of their opponents for this weekend and how they like to press very high up the field, so he had one team pressing and the most likely starting group trying to break the press with a few different options. 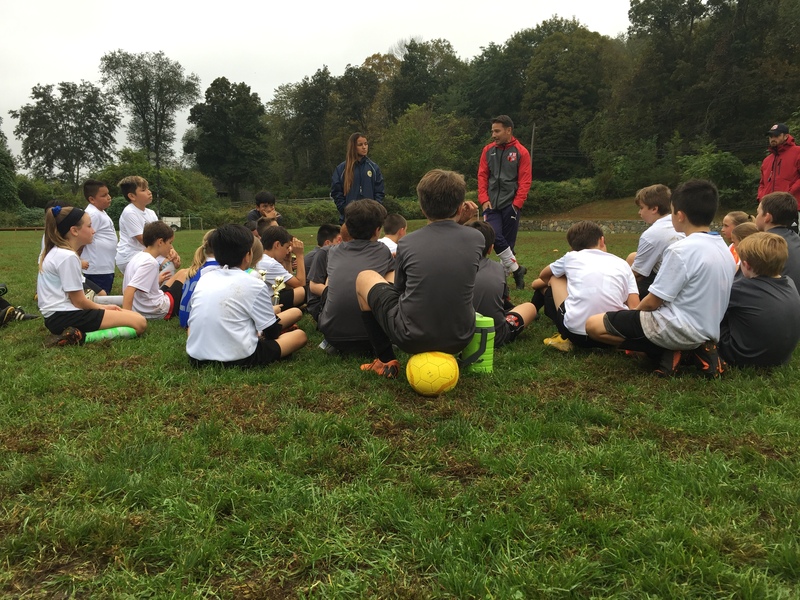 The boys were impressed, engaged and fortunate to interact with the players and coaches after the session. 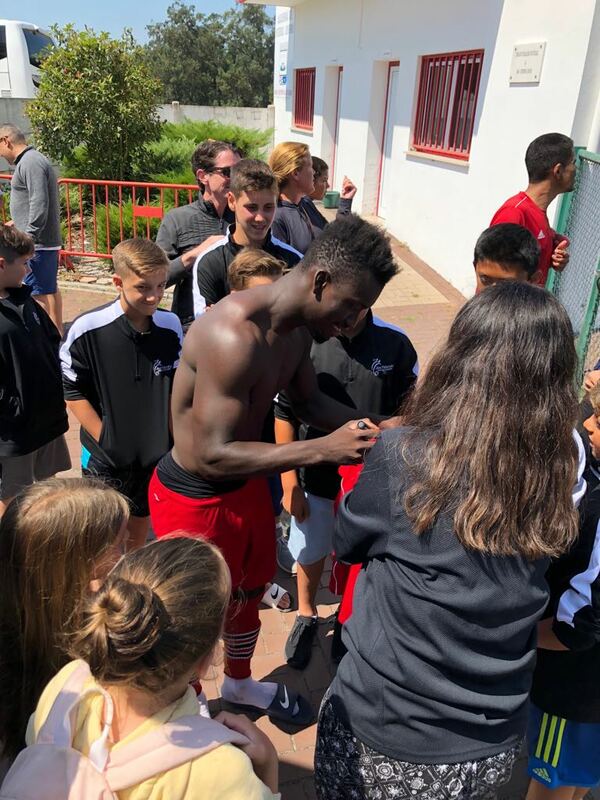 They welcomed the players onto the field for pictures, videos and autographs after the match that made the day for our boys. 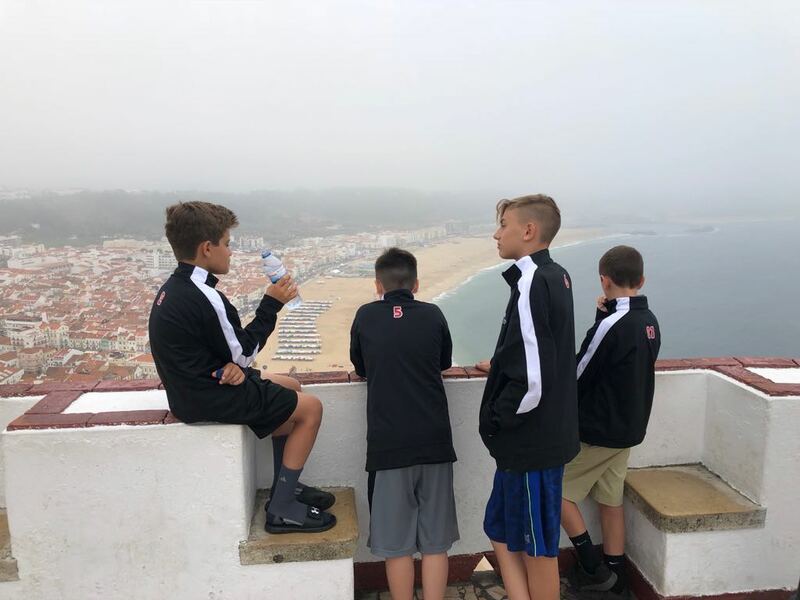 After this spectacular experience the boys headed for a lunch close by and then returning to Nazare to reconnect with everyone who is on the trip. 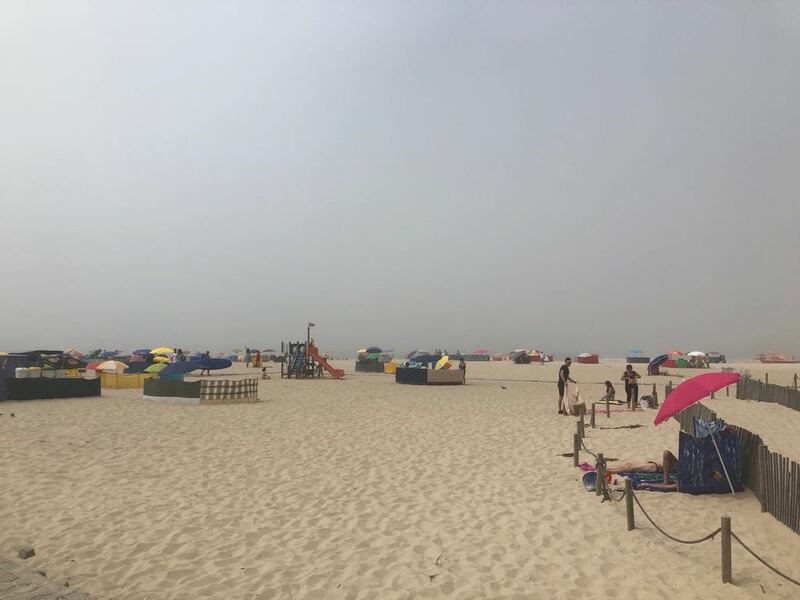 It wasn’t the best beach weather in terms of sun however for our purpose it worked out great. It was overcast and pretty chilly so we didn’t have the heat adding to the already tired legs of the boys. 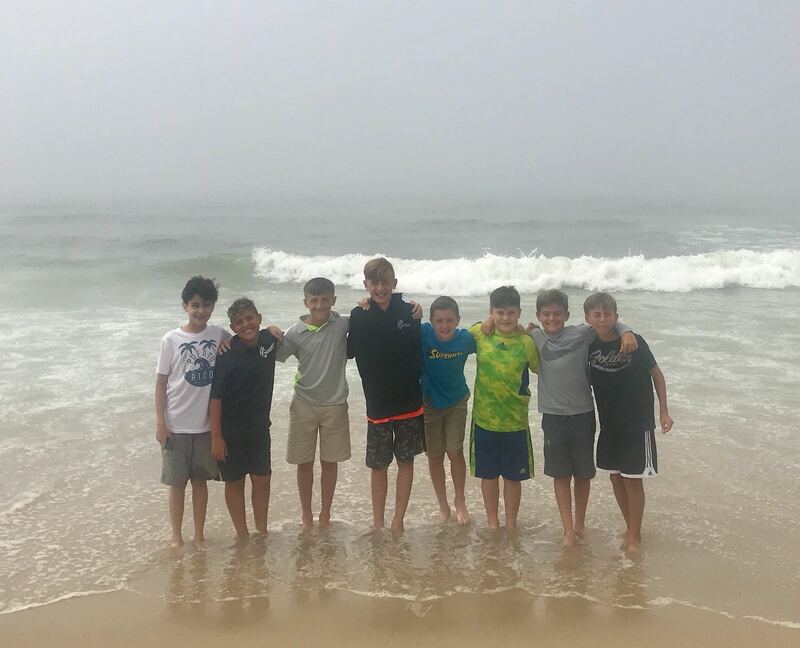 The beach offered a chilly swim, soccer on the beach with new friends and mini shops to explore. The day was well spent before heading to SCL Marrazes for the third game of the tour. 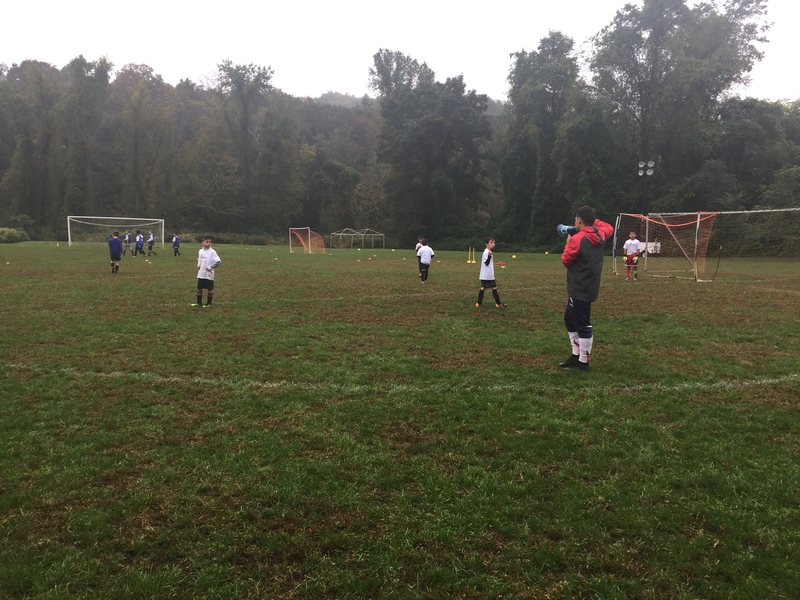 This game would end up being our toughest challenge here so far as the 2004 boys were very strong. The obvious difference is the physicality but this is not the reason for the dominance by them. 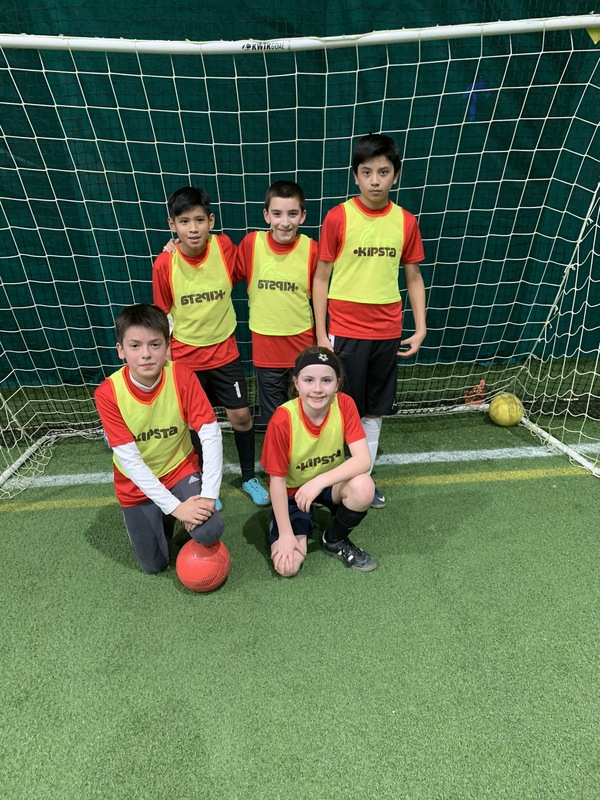 The Marrazes team simplified every situation, they were patient in their attack to find the best space to hurt us and they were playing at a speed that could not be matched but only contained. 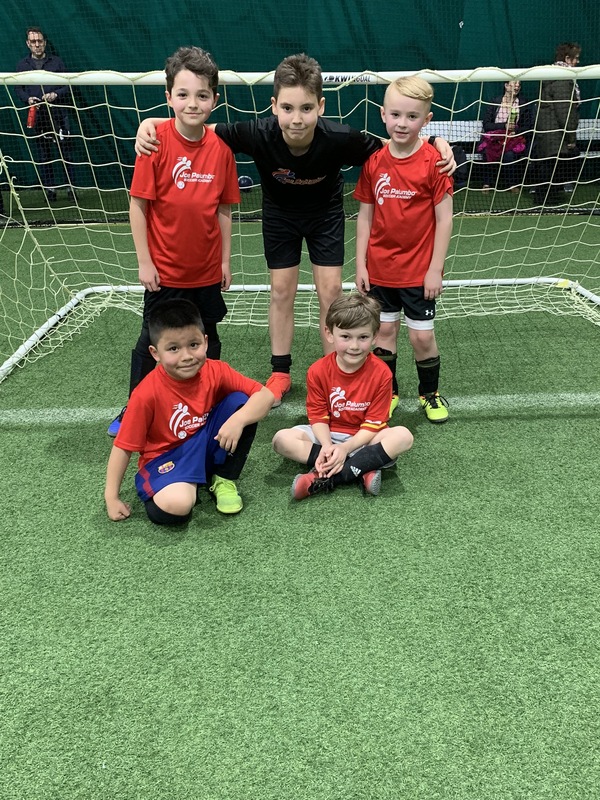 Our boys did a tremendous job of moving as a team and covering one another once their teammate was beaten off the dribble or a line was split with a pass. 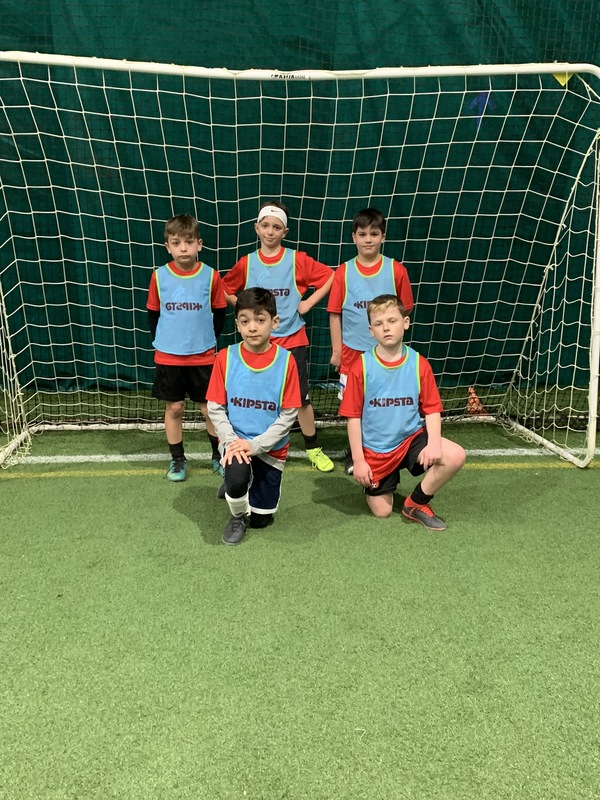 The compliments of the opposing coaching, the round of applause of the opponents parents and appreciation of the effort the boys put it was rewarding. 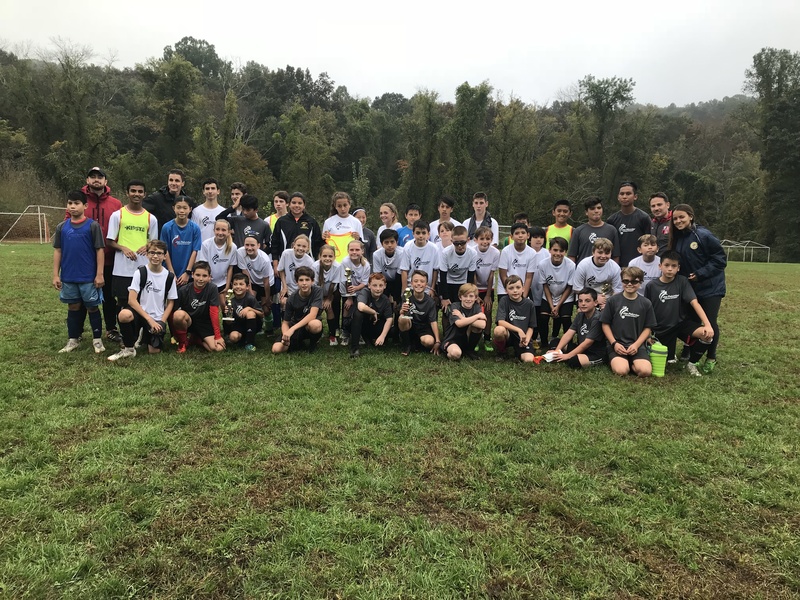 Thank you to SCLMarrazes 2004s for our toughest challenge of the week and additional growth of our players. 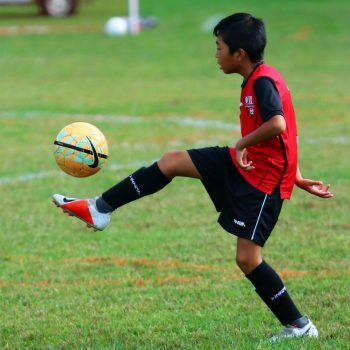 The boys have faced some tough competition with the opponents superior in many concepts of the game as well as a physical level that cannot be matched. SCLMarrazes provided a vision and standard that our players must strive to reach in two years. 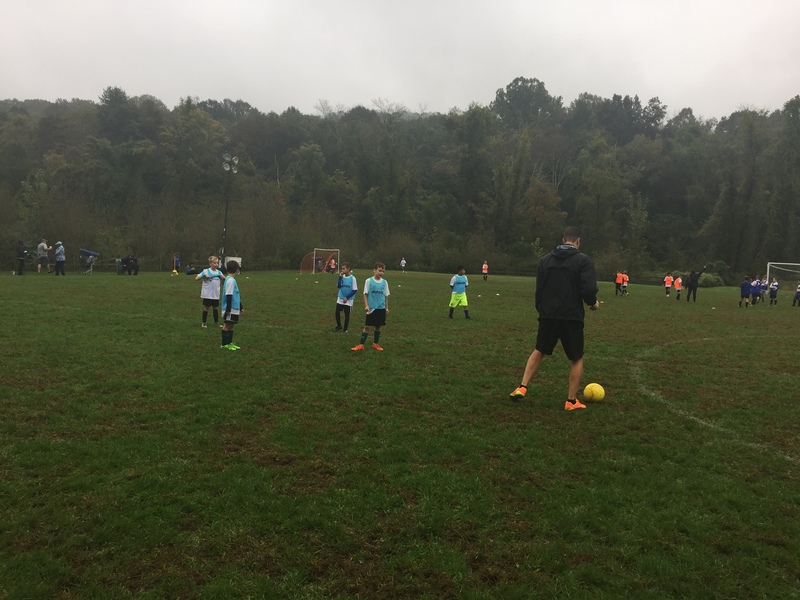 The 0-6 loss is not the focal point today…The takeaway is the growth and experience these young players get by going up against players and teams of quality and professionalism. 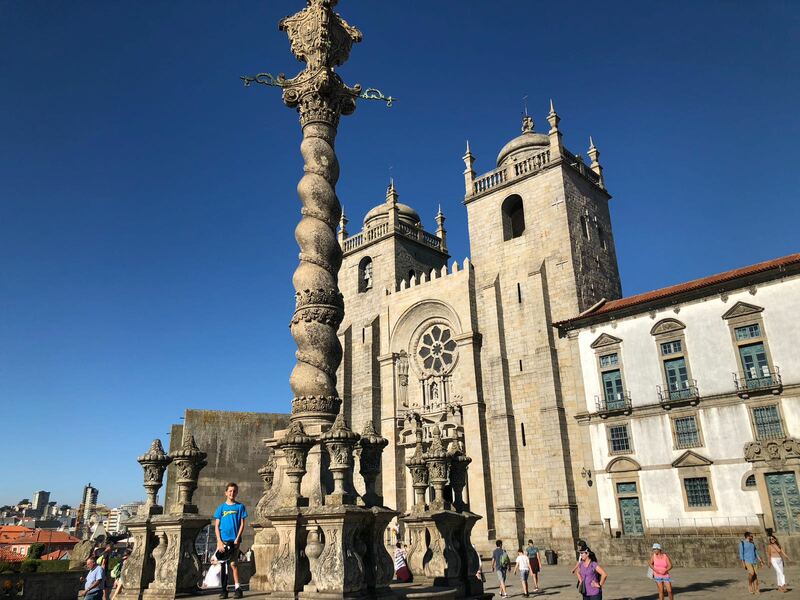 Portugal Tour 2018 – Day #3 in Porto!! 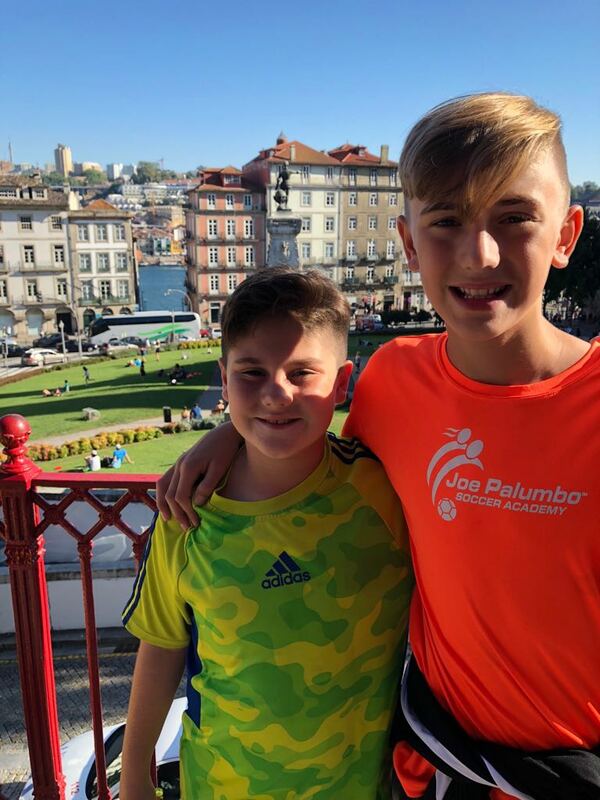 Day #3 in Porto, Portugal! 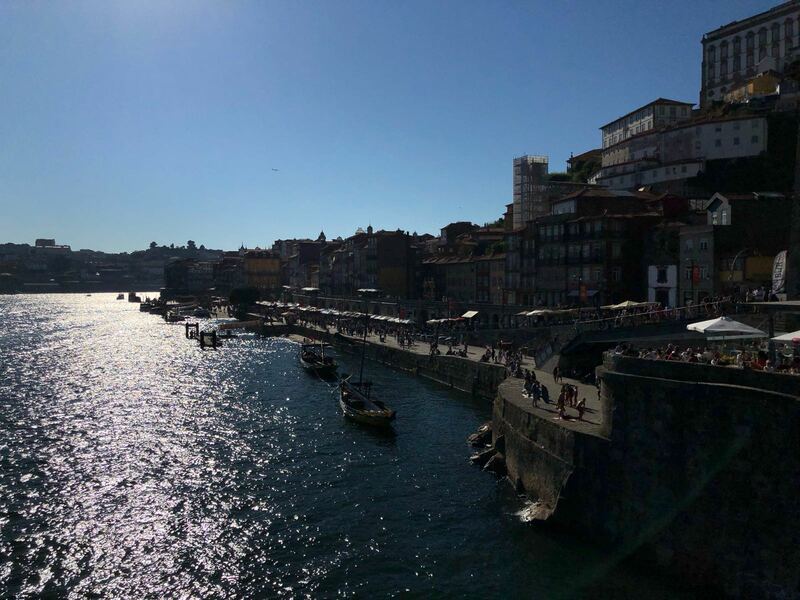 Porto was worth the trip! 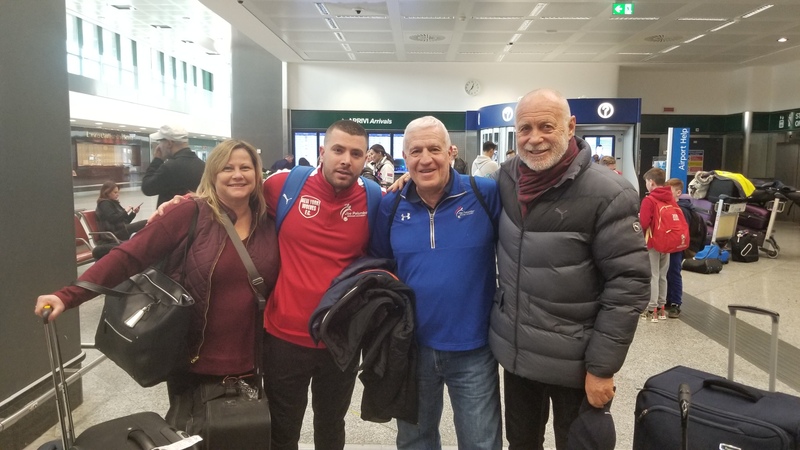 It was an early start for the boys and supporters with a 7am breakfast meeting so we could be on the road for Porto as early as 7:30am. 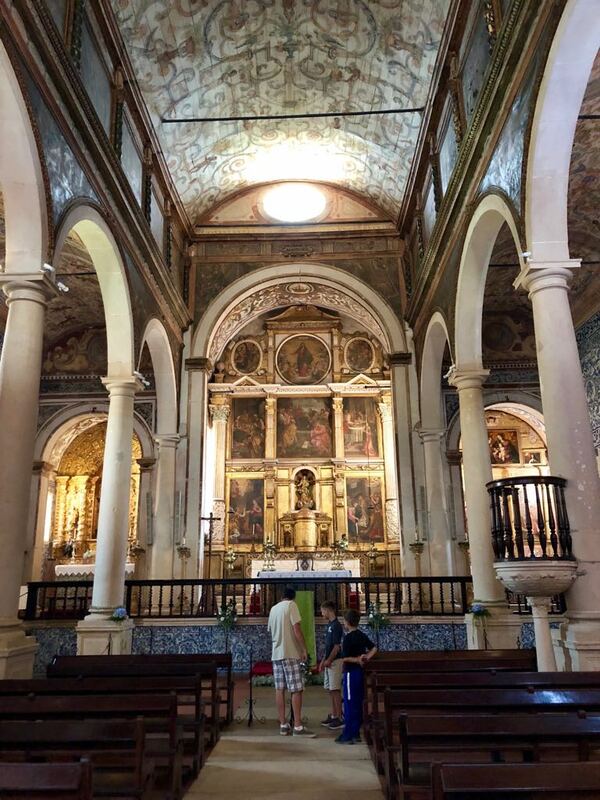 The two hour bus ride to Porto was spent with stories told, songs sung and Mafia games played. Upon arrival at 10:05am we were greeted by Sergio who is the President of the club de Cortegaca. 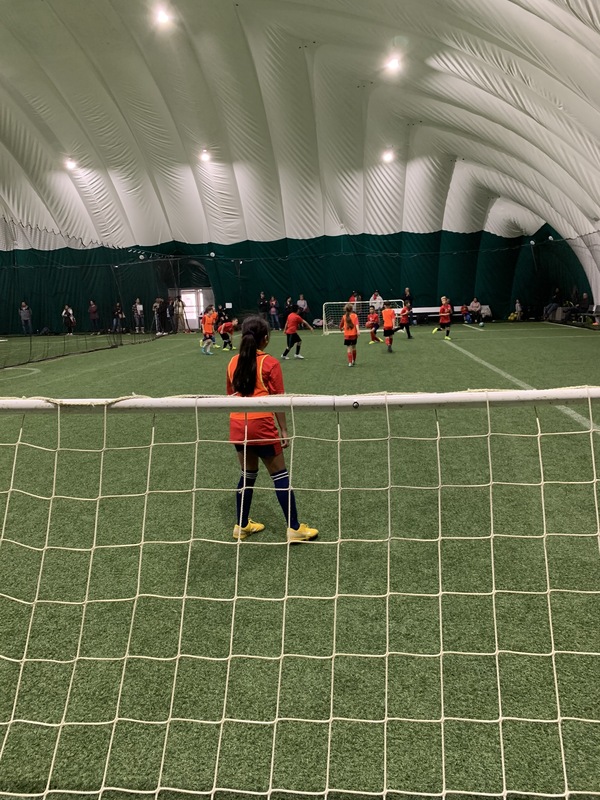 The name of the facility that they use for training is Futpark which has two 11v11 regulation size fields, two 5 a side fields and one training area with skill challenges. Behind these fields was an indoor building for the colder months in the winter time. 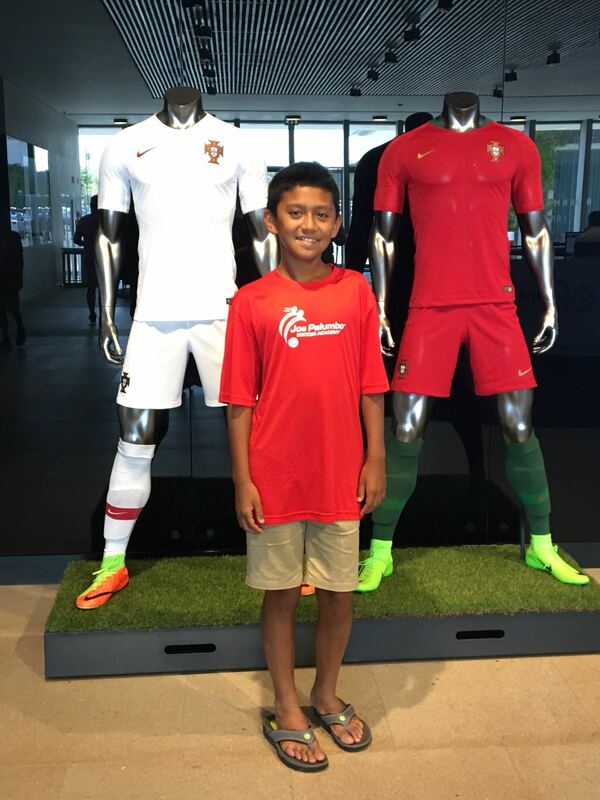 It is an ideal setup for their Academy and training schedule. 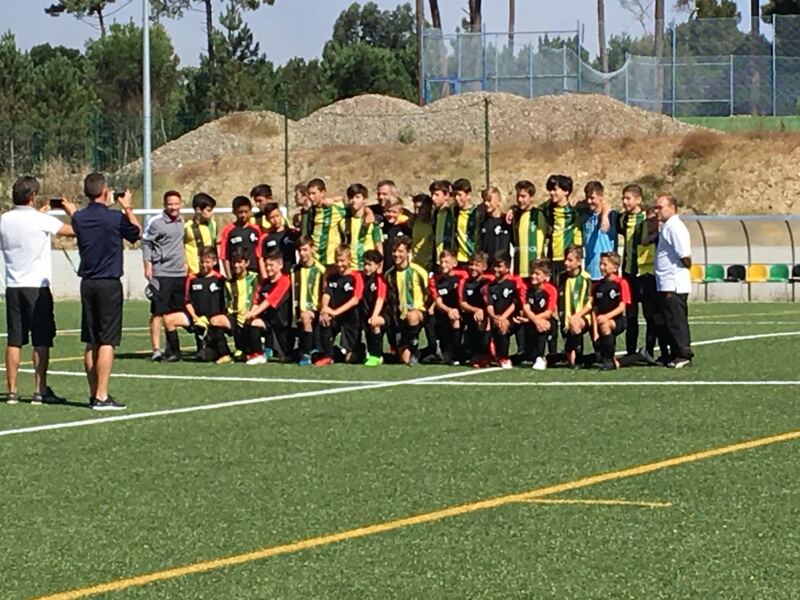 The second game of the tour would be another tough challenge for the boys as they played against another 2004 team that was more technical and organized than yesterdays group. 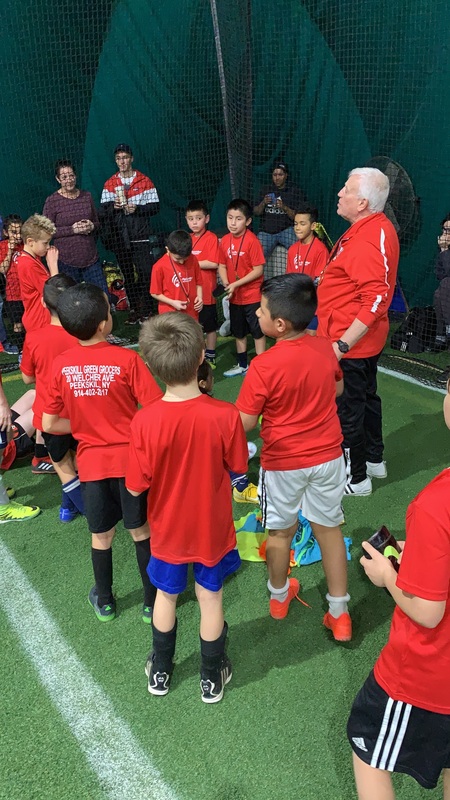 The patience of the other team, the confidence of the players individually and the organization of the group was a challenge to keep up for the full game. The first half ended 0-0 with a few chances created from us on the counter but the most impressive performance of the boys so far is their defensive effort. The second half continued to be controlled by Cortegaca in terms of possession but not many clear chances created until about 15 minutes left in the 2nd half. 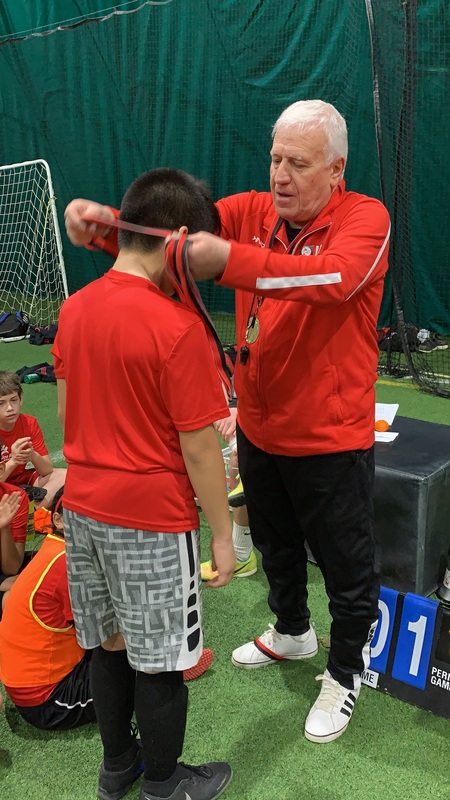 Once they broke the tie it was difficult to stop the second one from coming in a short period time psychologically as well as making changes. 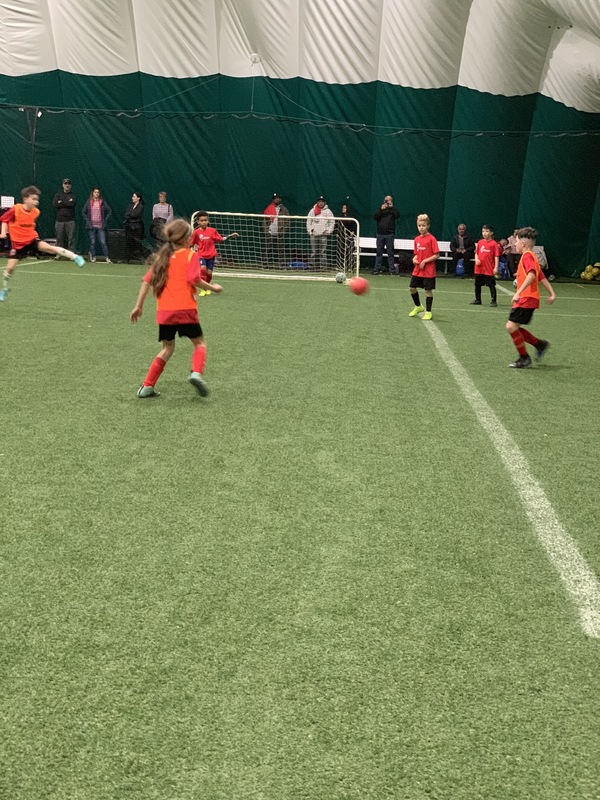 We went for it after taking the first goal with some position changes to create more pressure higher up the field and cause an error closer to their goal. This only resulted in more space behind us for the team to attack and punish two more times ending the game 0-3. The respect that not only the trainers but players showed our boys after the game was great and welcoming. The coaches had some nice words to say about our team as a whole and some top individual player performances. I continue to express my satisfaction with the boys effort, attitude and approach to these challenges. 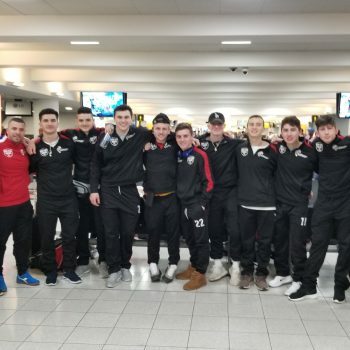 It is another experience that makes them stronger when facing adversity and humbling them in the realization that more work needs to be done individually and as a group going into the new season. 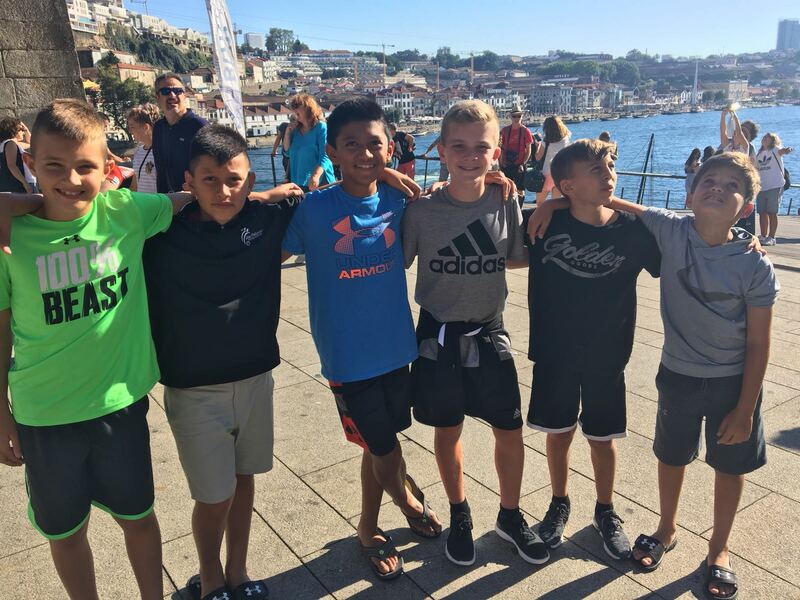 With the game being played early, the rest of the day was planned out for a pizza lunch and a trip to the Douro River in Porto. The entertainment of street performers, the views and architecture was an impressive site to see. 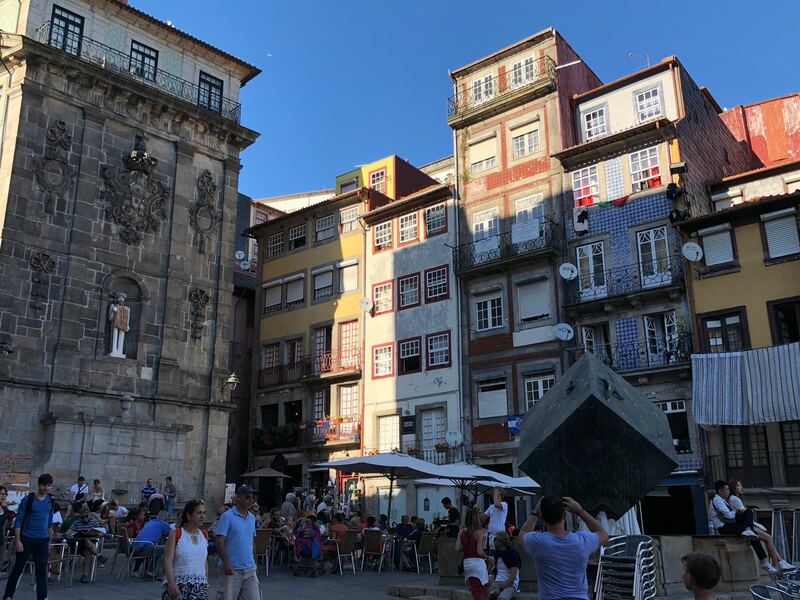 The time we spent in Porto was nowhere near enough to see all that this beautiful city has to off, however the short time that we were there this afternoon left a long lasting impression on many of the newcomers to Portugal. One of the more impressive sights was the view from a large bridge that extends across the river connecting you to both sides. 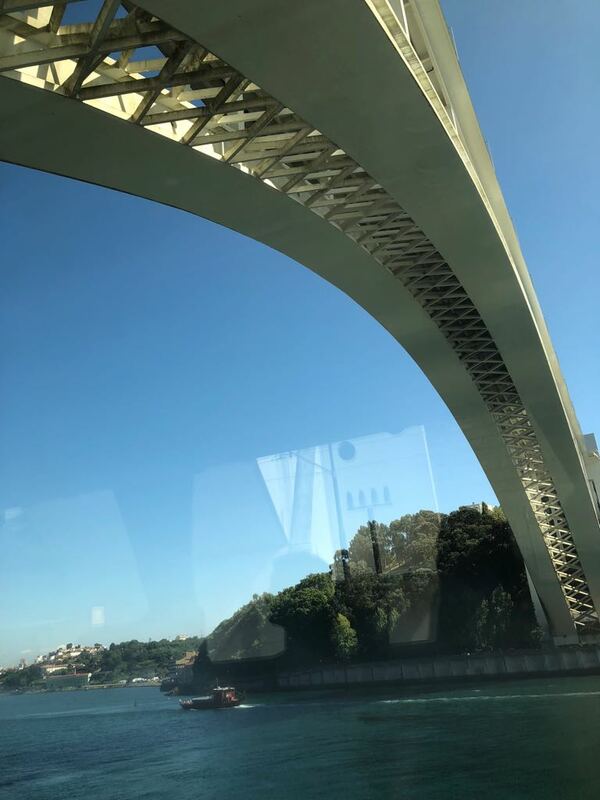 There are two far apart heights to the bridge that you can walk across and even catch the sight of young teenagers bridge jumping into the river! After taking pictures and videos of all that we could we made our way back to the bus to begin our return back to the hotel and dinner. We finished off the day with a nice dinner across from the hotel at a buffet style restaurant called A Grelha. 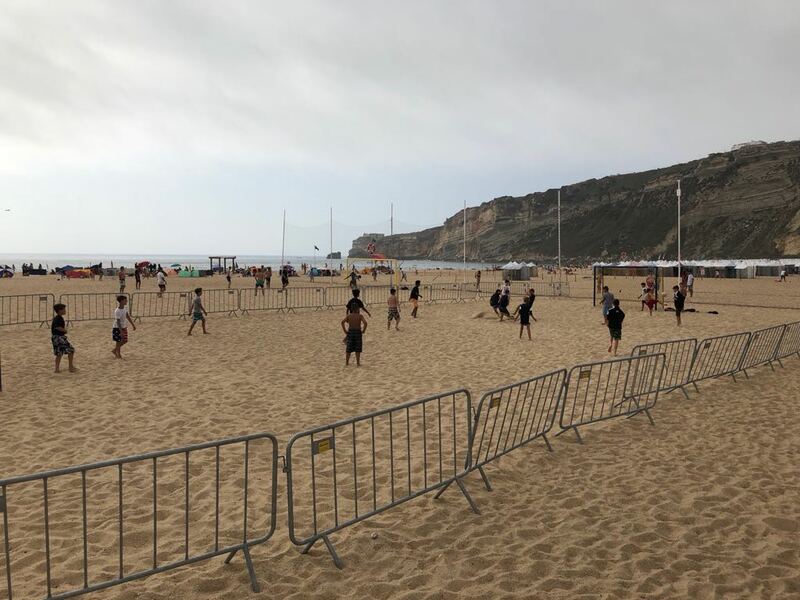 On tomorrow’s agenda we have a visit to the famous beach of Nazare’, an open training session viewing of Leiria’s first team and a game at night against Marrazes! 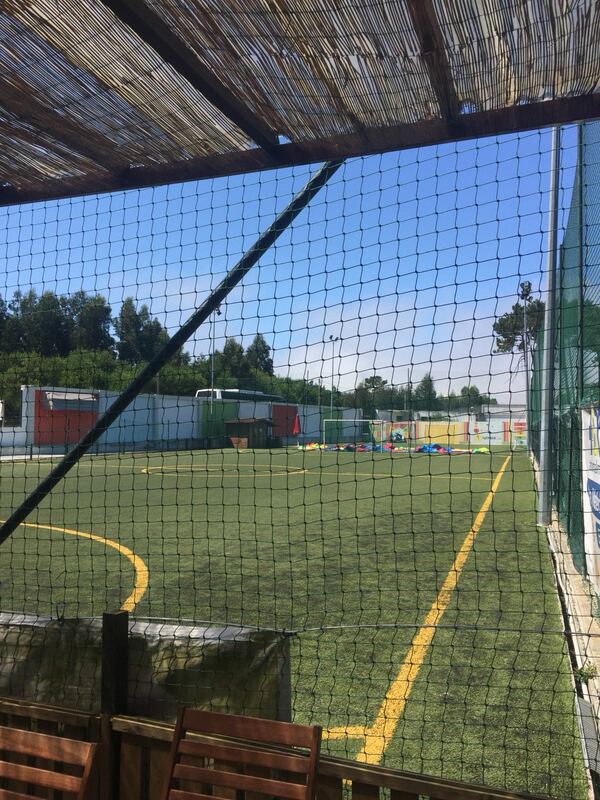 Day 2 in Portugal in the books! Read about it here! The day began with an 8:15AM breakfast in the lobby. 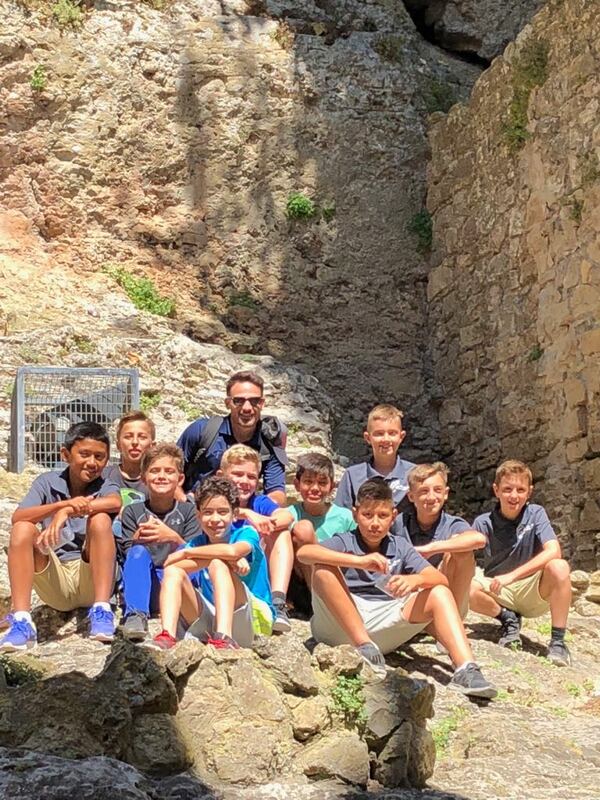 When taking these tours, one of the off field experiences is doing things as a group. One ritual that is simple but important is to start the day together by meeting at breakfast with everyone seated before anyone can get up for breakfast. 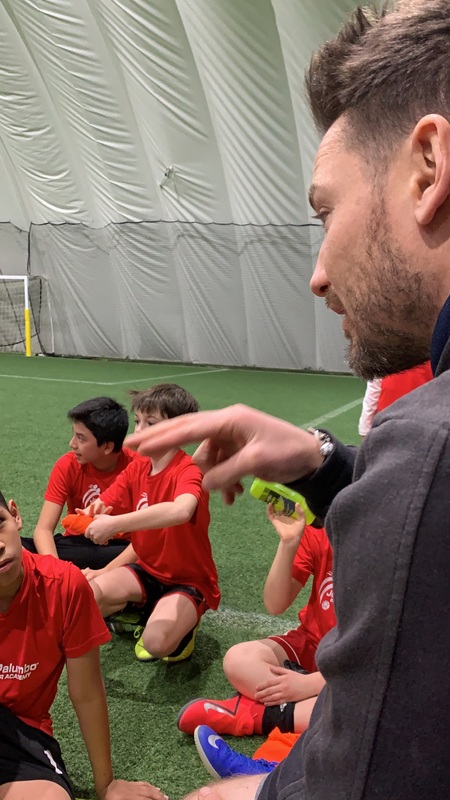 This is one example of the group knowing they are accountable to the their colleagues to report on time and have the self-discipline to follow the schedule of the team. 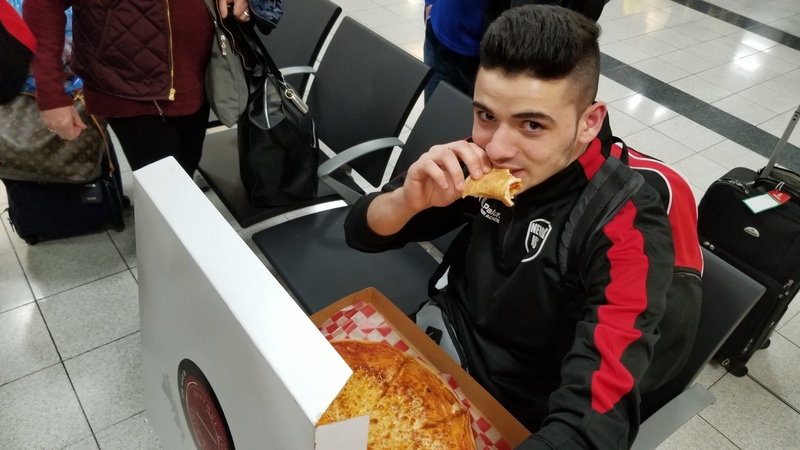 The on-time teammates will not starve if players are late but they might lose trust and respect for those who do not value the sacrifice of the others and come on their terms. 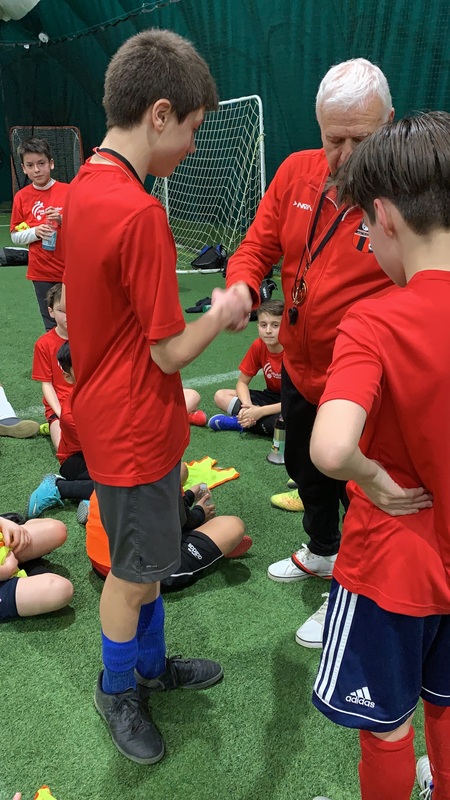 Self-discipline must be incorporated into reporting on time in order to show the sportsmanship that we are a group and we will commit to a time of meeting together. 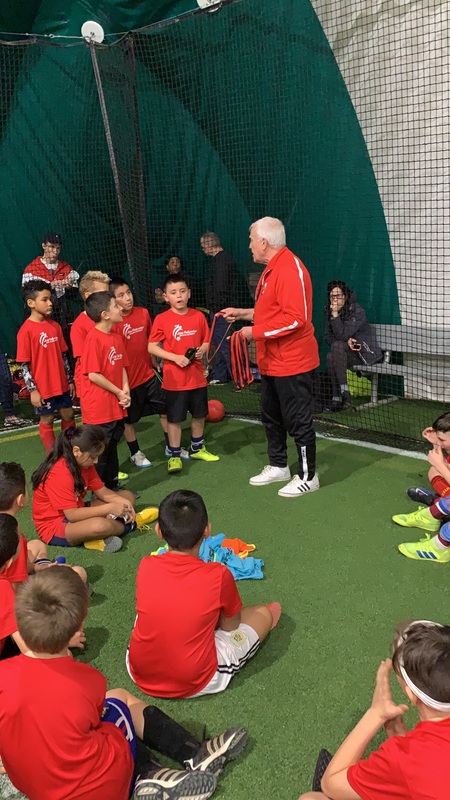 This is helpful for a group that is put together for the experience of playing in another country, especially when players are playing on different age groups and teams in the club. 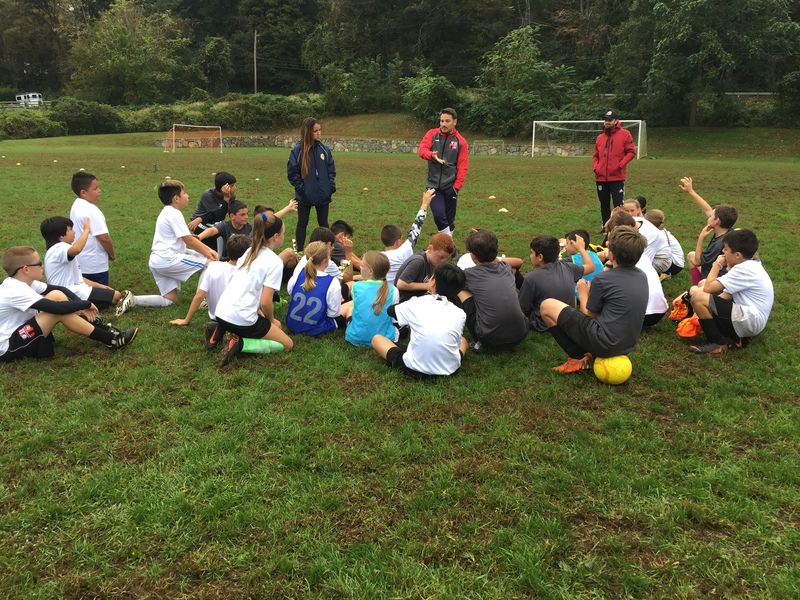 The bonding and experiences off the field make the group stronger in a small period of time. 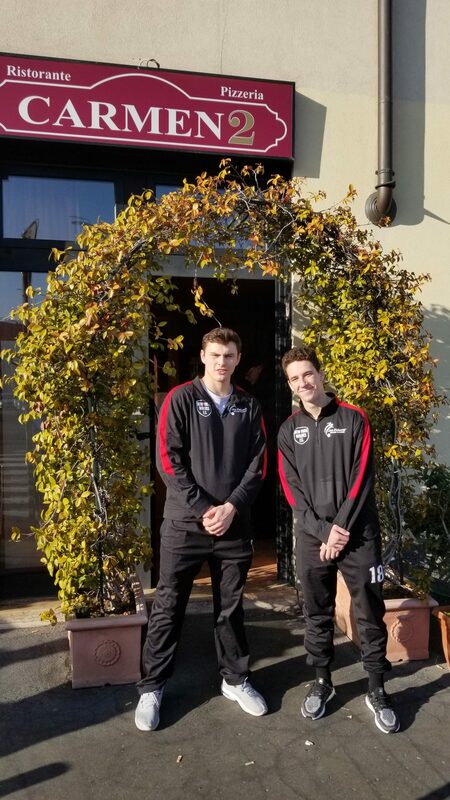 Long story short, the players were on time, enjoyed breakfast and had a little time to prepare before leaving at 9:45AM for the Stadium tour of U.D. 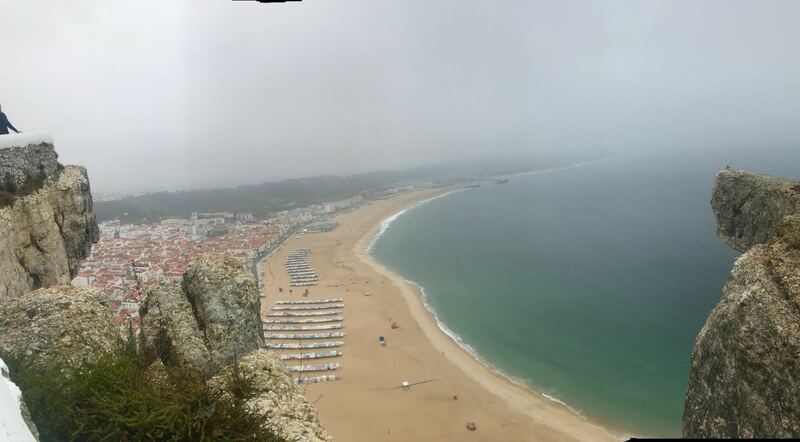 Leiria. U.D. 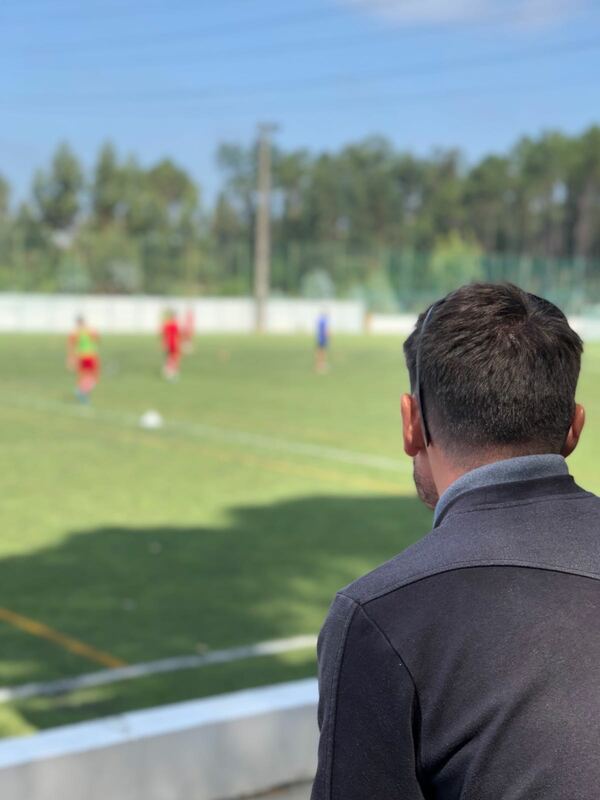 Leiria is a famous club here in Portugal who has had success in the first division at one time but some complications within the club set them back quite a bit. 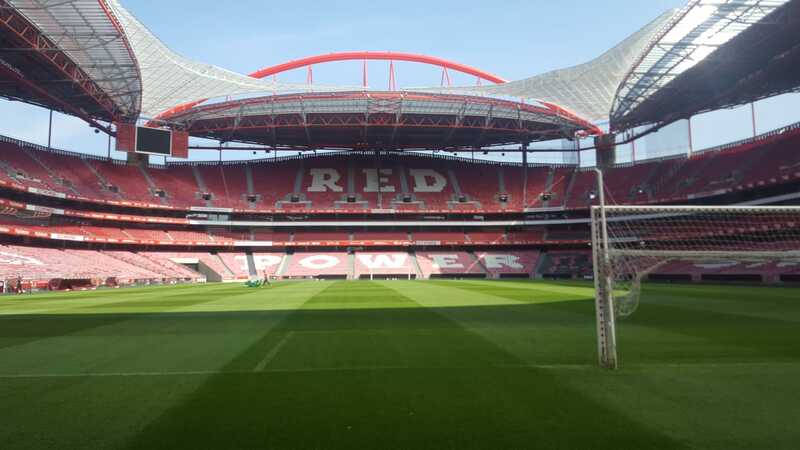 The stadium is a larger stadium that had matches played in for the 2004 Euro when Portugal were the hosts of the competition. Unfortunately the now Champions of Europe lost that Euro in the finals to Greece. 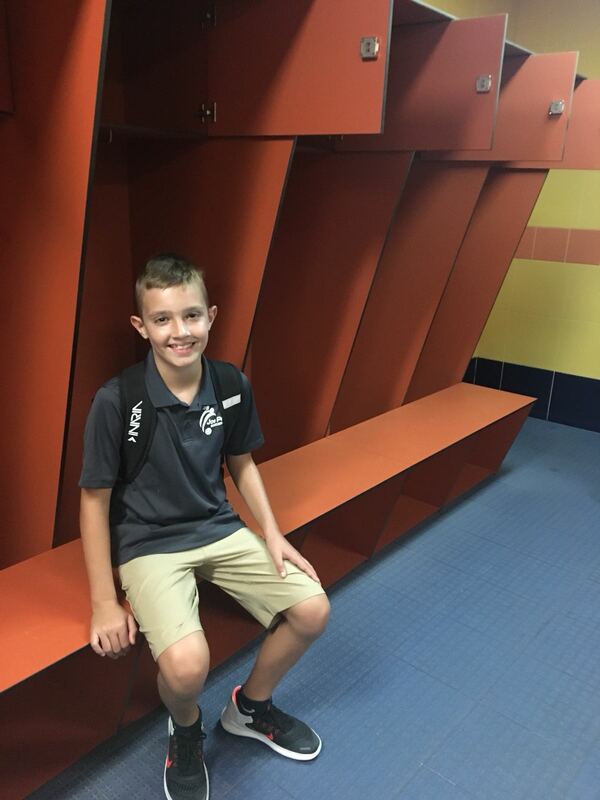 The tour was nice with the players and parents granted access to the entirety of the stadium, from field entrance to locker rooms and press conference rooms. The field was in poor condition as they just finished a concert event over the weekend so there is fertilizer and seeding down for the upcoming games in two weeks. 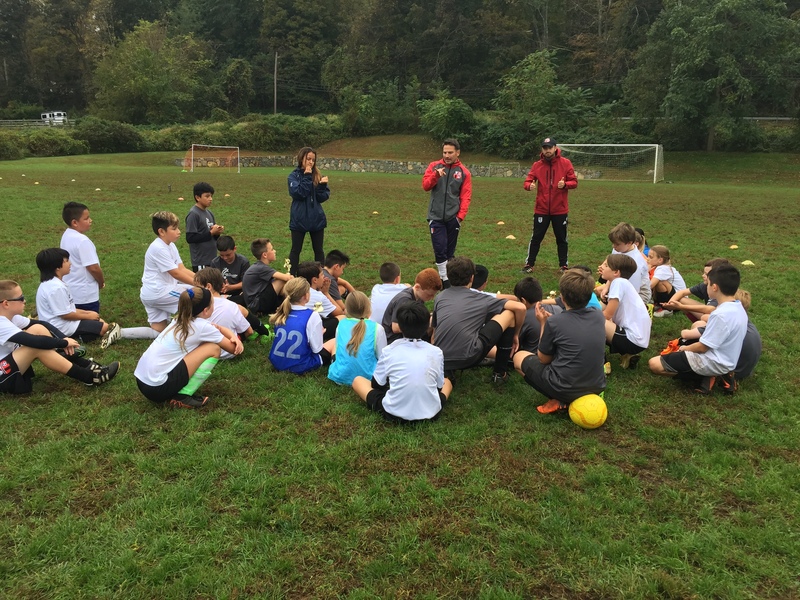 It is helpful for the players to see and realize the professional approach to the game. 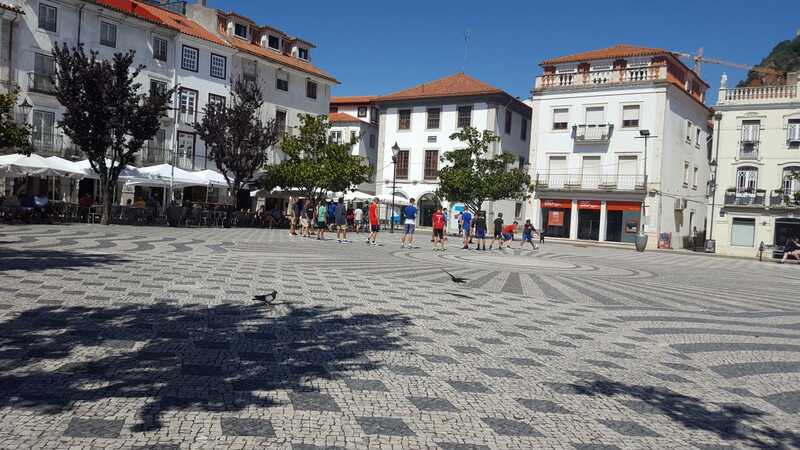 After the tour, the boys were able to partake in a walk and kick around with some young kids with a ball in the center of Leiria before going to lunch. On the menu for lunch was a bbq chicken that was most likely the group favorite, but also beef and rice with salad and multiple options for dessert! 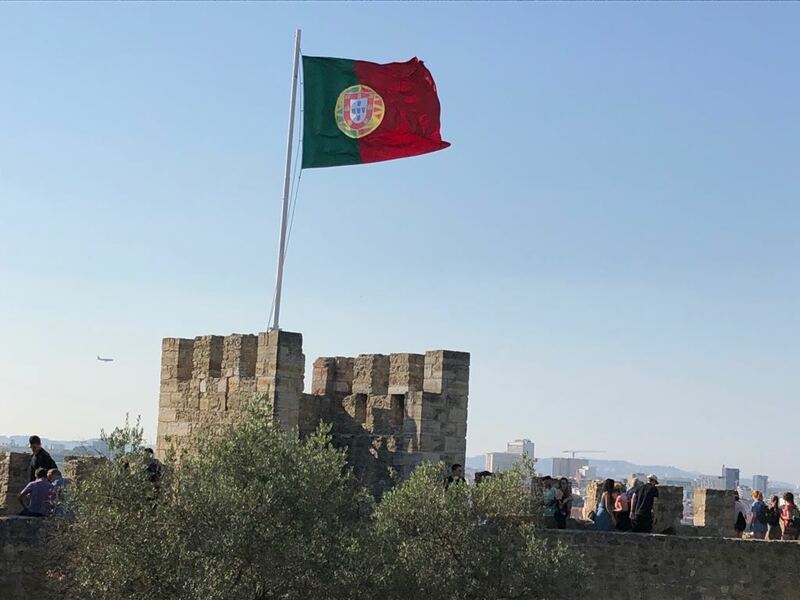 After a delicious lunch at Pires e Pratos, the tour was off to Obidos! This is one of those places that I feel you can visit multiple times and not be bored or disinterested in what it has to offer. The streets, views, people and shops all have something to offer and a story to tell. The kids did plenty of walking, exploring and picture taking before it was time to head to their 1st game. 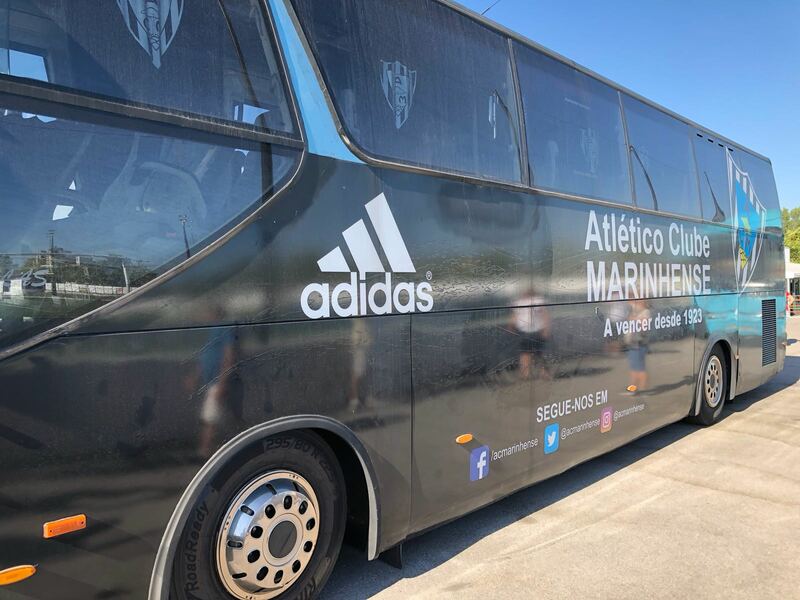 The game…..Arriving at A.C. Marinhense around 5:30PM to meet the club representatives and trainers where they guided us to our locker room for the preparation of the friendly match. 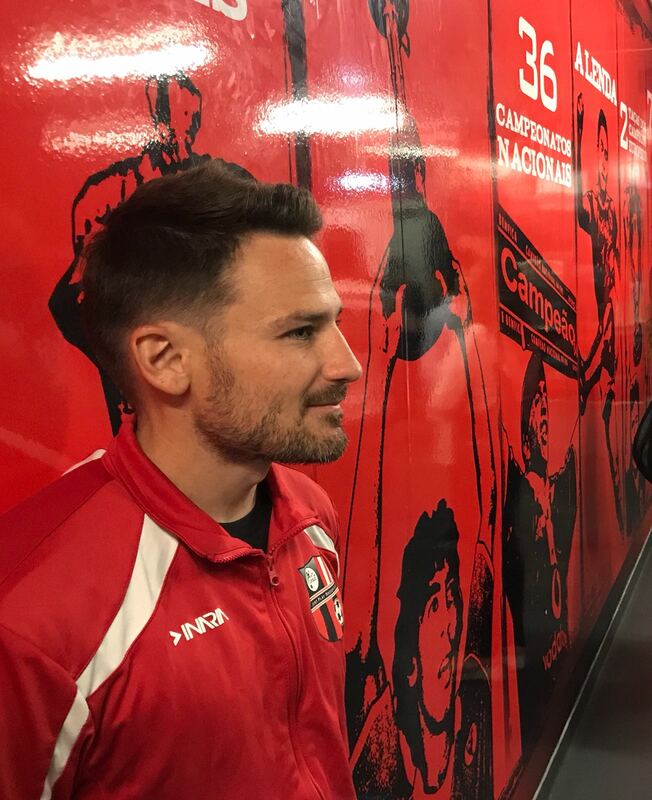 The boys were all excited and anxious to get onto the field but there was also a moment of uncertainty in the locker room. The thoughts begin to run through your head of what can happen right or wrong. The questions begin to arise where you ask yourself are you ready?…Is my teammate ready?…Are they good?…We will win?…We will lose?…These things are normal and they continue to arise throughout the warmup and even right before the match begins…The boys were about to face a big challenge against players 2 and 3 years older than them! 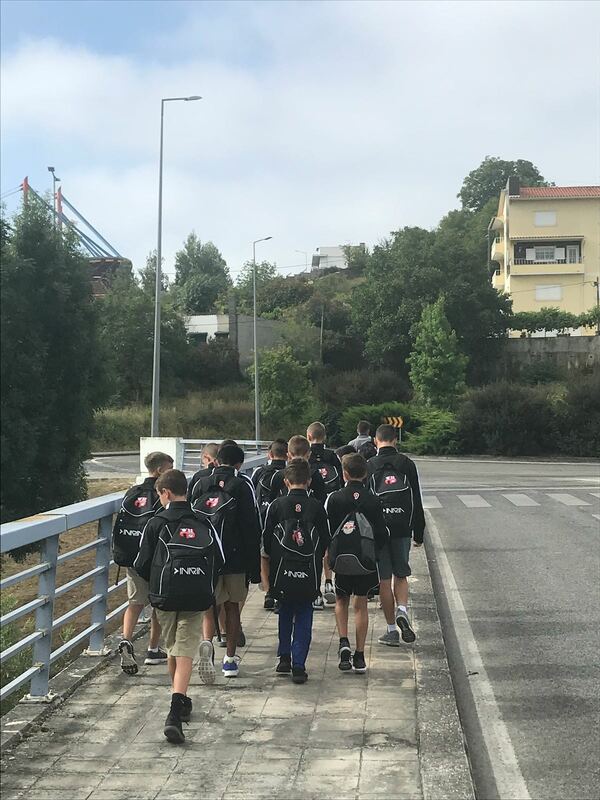 The game ended in a 0-2 loss and was an overall great experience for all of the boys. There is a lot of talk that goes on about development and what is the “right” thing to do. 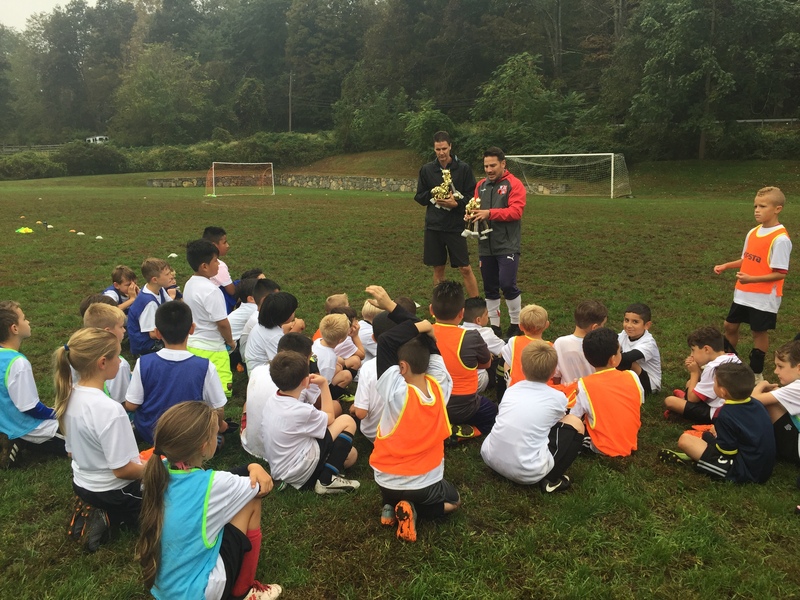 What the boys experienced today was development of their character, their pride and passion as a player/person. 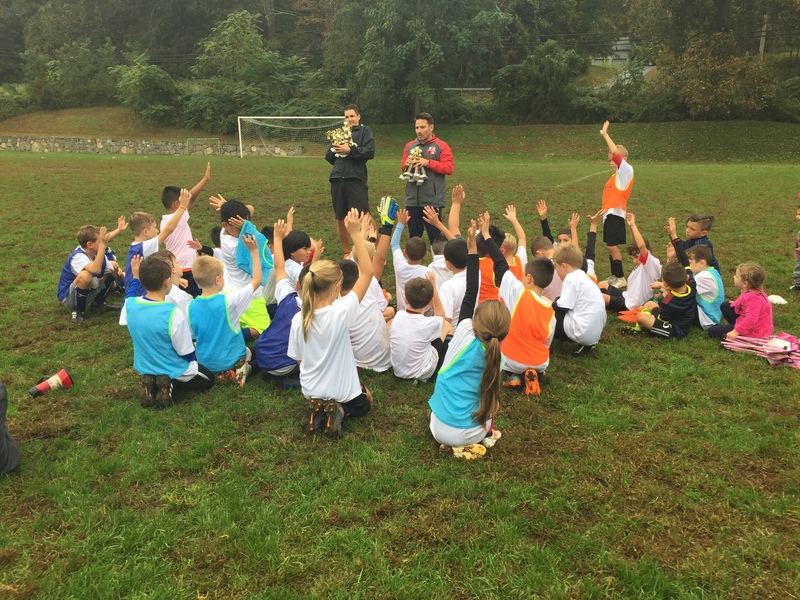 There is no difference when it comes to being a player in the game of life or soccer. 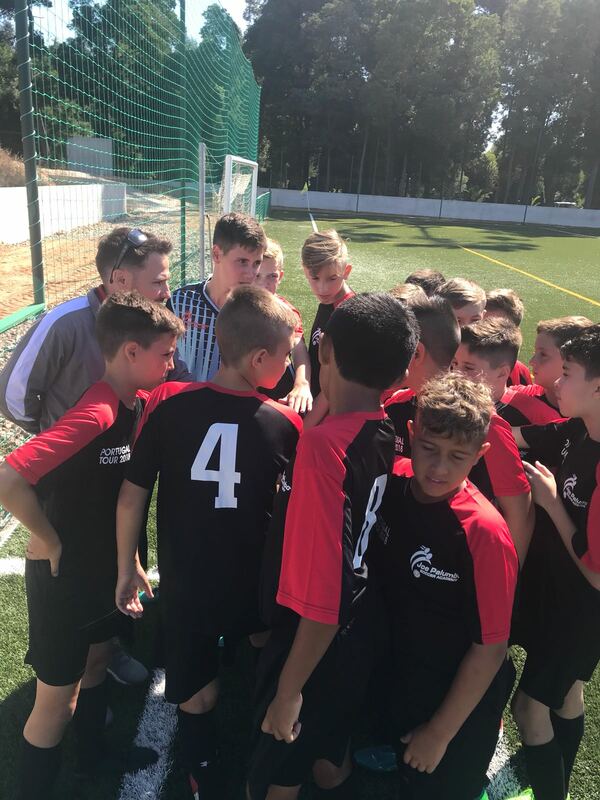 Everyone is proud of you boys today and good luck tomorrow as the team will be traveling north to Porto for their 2nd game and touring in the afternoon! 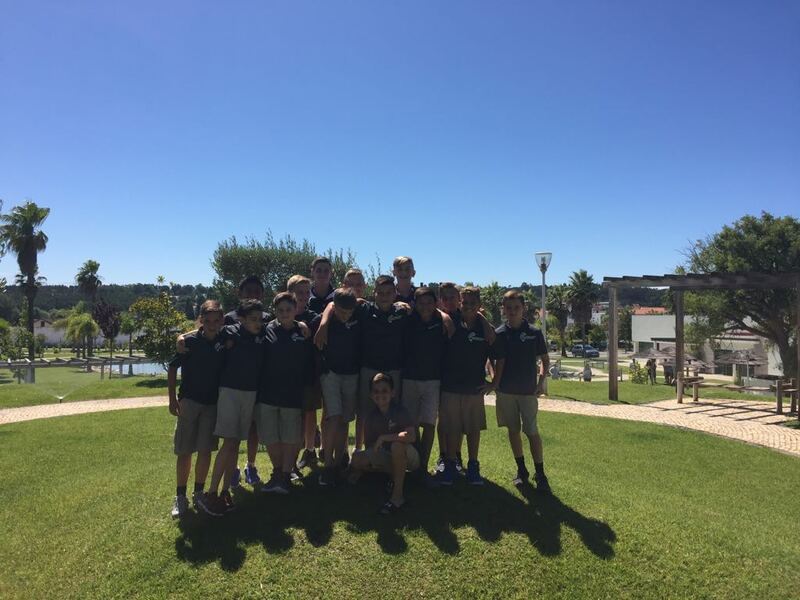 JPSA HAS ARRIVED IN PORTUGAL! 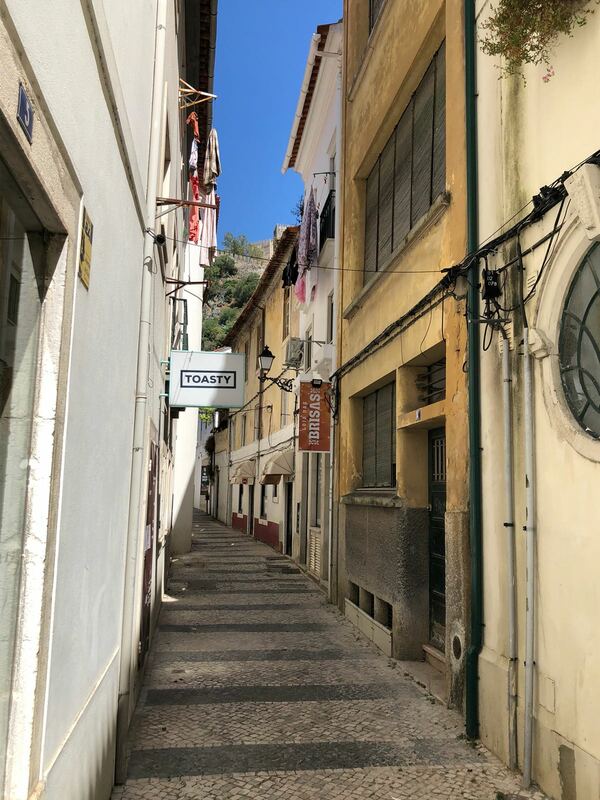 We’re back for our Portugal tour; Summer of 2018! 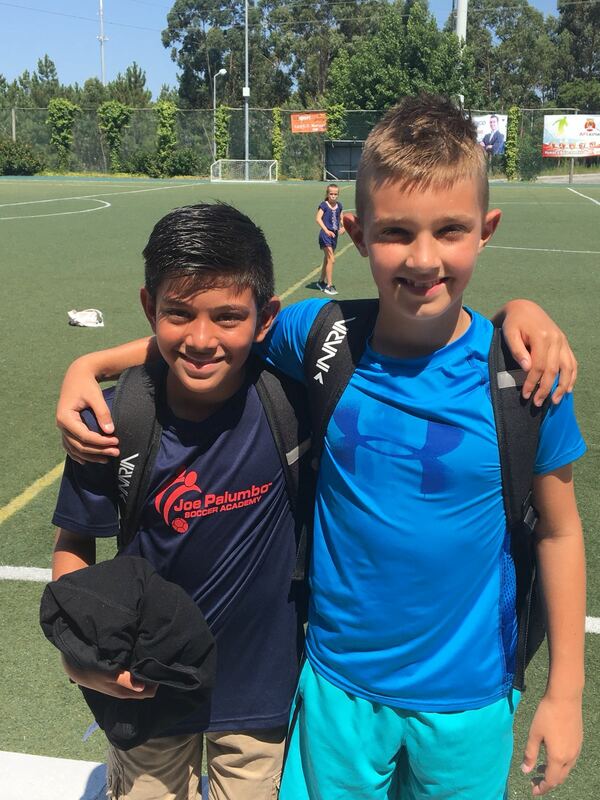 If you have been following our stories on Instagram all summer, you have seen many moments captured at our summer camp. 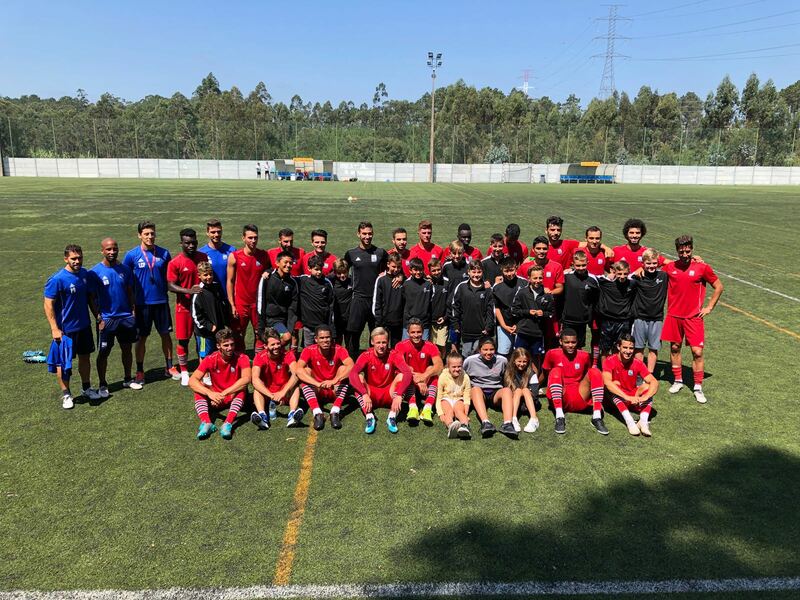 Today, however, might have looked a bit different as 15 players from the Academy have traveled to the country of the European champions, Portugal! 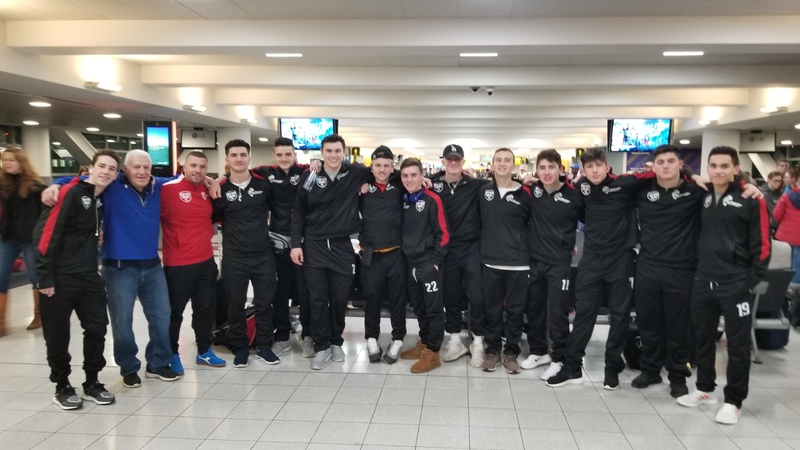 The journey to our JPSA Portugal tour of 2018 began yesterday, flying out of JFK for 20 of our tour participants. Landing here at 10:36AM and patiently waiting to make our way through the 50 lines of people at the passport check through, we successfully met up with the remaining tour participants and headed for our first lunch of the tour. 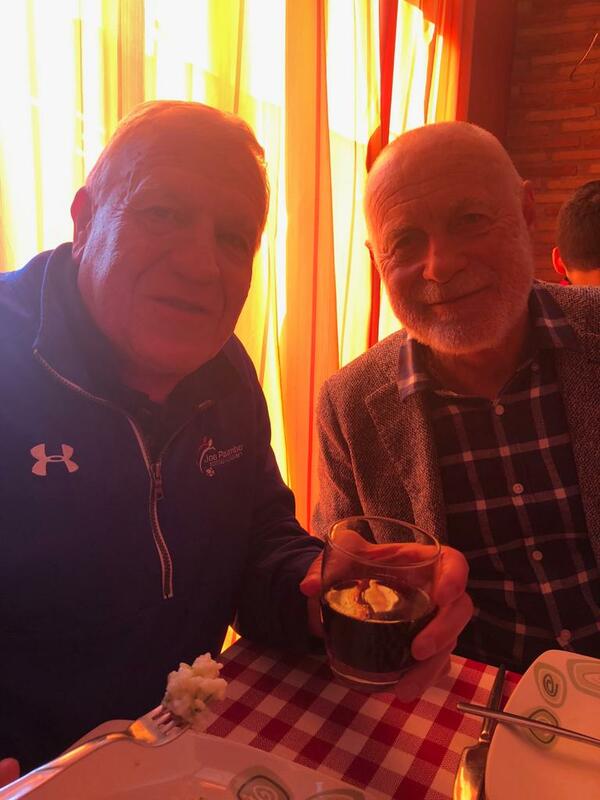 The restaurant was called Restaurante gato PRETO and had great options for everyone to eat some things they were used to and potential to try some foods they never seen before (Blood sausage being one option). After Lunch we went for a nice walk in the outdoor area to stretch our legs before returning to the bus. Soccer was soon to begin from here. 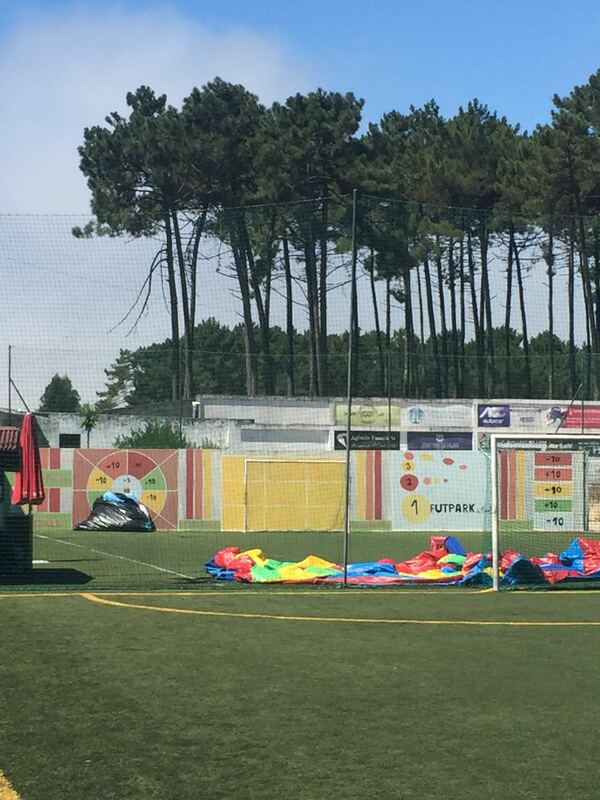 We quickly checked in at our hotel and left for the first training session of the week at Porto do Mos Training field. 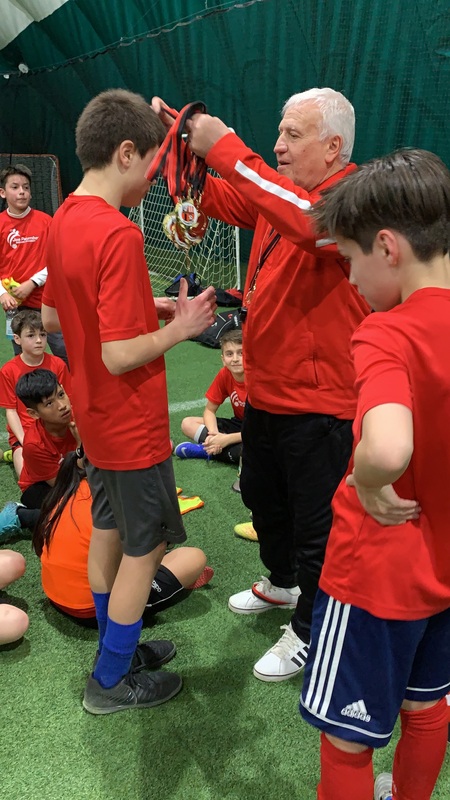 At this time, the boys met our Trainer for the week Andre’, who ran a simple training session with the emphasis being technical. 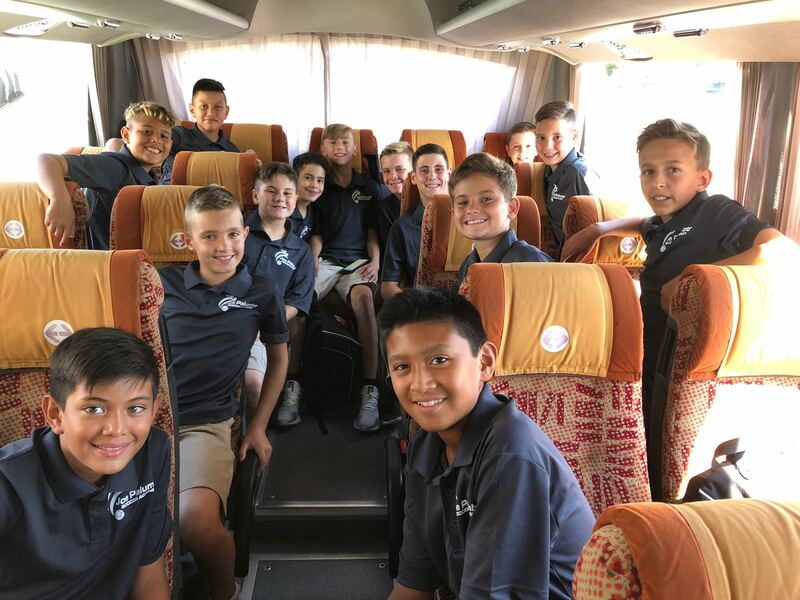 It was a long trip for the boys, with some batting fatigue and sickness and others a little nervous and anxious however all of the boys participated in training. 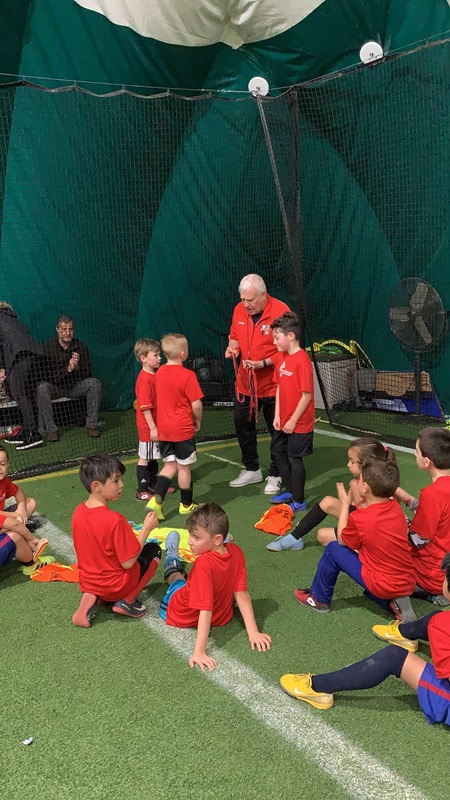 The training session was good for Andre’ to see the basic technical level of the players before going into the long week of soccer ahead. We finished off the night with a dinner at the hotel a couple parent and player meetings to discuss expectations and itinerary for the next day. We have a big day ahead tomorrow with a stadium tour of U.D. 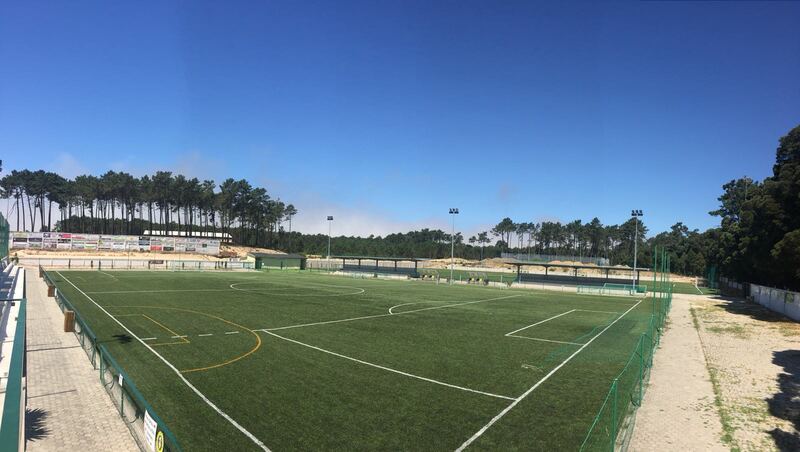 Leiria and our first game against A.C. Marinhense later in the day! We will keep you posted throughout the week with photos and videos on all of our social media outlets so you can come along with us! 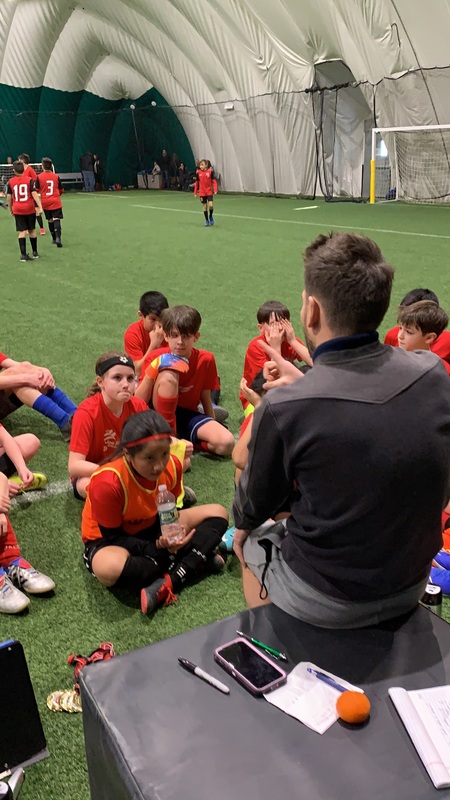 Wrapping up the Saturday Academy League! 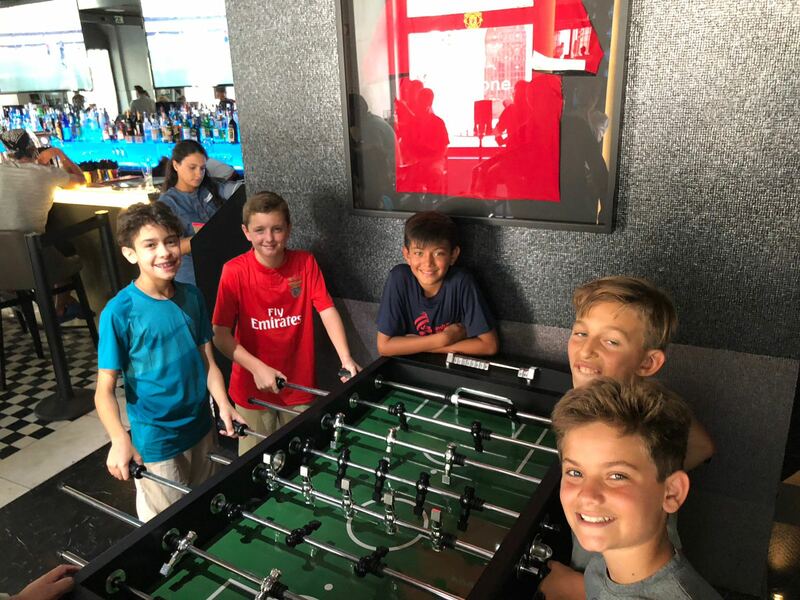 EPL, Bundesliga, La Liga and Serie A have all culminated in 6 weeks of truly exciting soccer action here at JPSA. 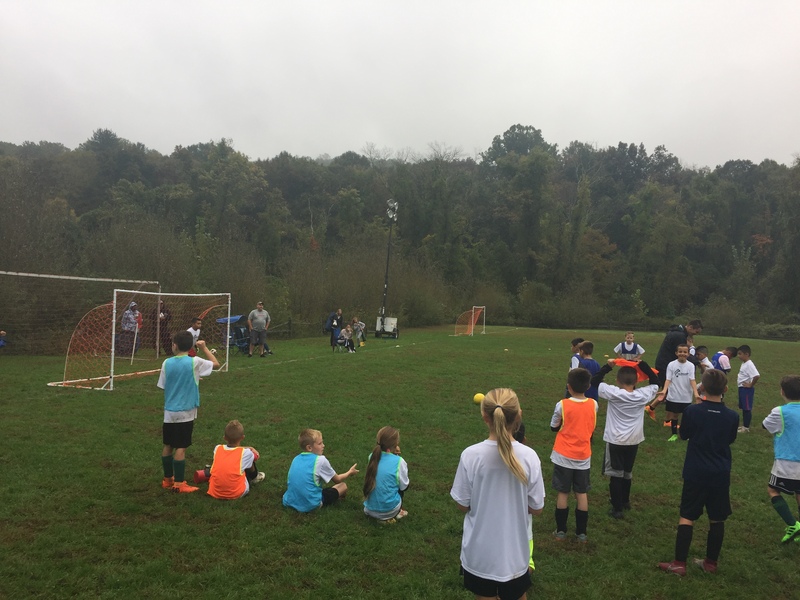 It is here where those who participated were empowered to be creative, make decisions and play the game with the freedom to attempt without consequence! An environment designed to allow players to make mistakes, learn and correct in later moments throughout the six weeks of play. This is a program characteristic of the JPSA trademark and it defines the quality of our instructional framework starting with summer camp. 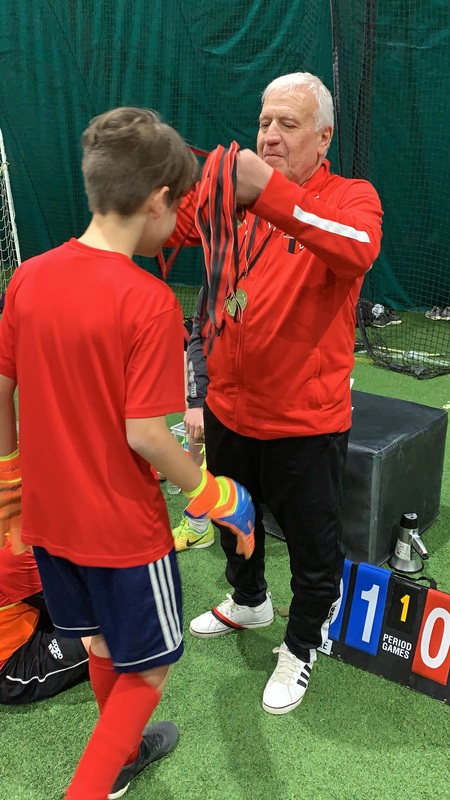 Our summer camps are designed so skills both new and learnt are executed and reinforced in AM training 5 days per week. 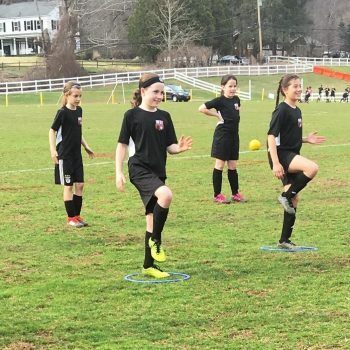 The intensity of training will be feverish in anticipation of the world cup style afternoon matches where every child who loves the game is given the license to express themselves in a competitive team setting. In a magnificent turnaround from last week’s fixture Man City produced a stunning performance to win 8 – 2. Chelsea were left shell shocked by Man City’s quick start but soon rallied and forced their opponents on to the back foot. In the second half Man City soon established their dominance once more and went on to win comfortably. A repeat score line from the last time these two teams met proves both sides are so evenly matched. A game which had it all, including goal line clearances and penalty decisions, was end to end right up until the final whistle. At the final whistle players were left exhausted from all their effort, testament to their desire to take all three points. An epic game ensued between Bayern and Wolfsberg to produce a 12 goal thriller. Both teams passed the ball with assurance and were clinical in front of goal. A thrilling tie in which neither team deserved to lose. Both teams had a chance of winning the title if they were victorious in this game and it was Dortmund who were to rise to the challenge. They went on to score 11 goals against a skilful RB Leipzig team. In La Liga the teams combined to make two super teams to decide who would be crowned the Champions with Sevilla and Barca both starting on 15 points. Sevilla were to get off to a flyer and took an early 2-0 lead. However, after some tactical changes Barca rallied and tied the game up at 2-2. The second half was end to end and it was Sevilla who were to be the more clinical an as a result clinch the title. Teams were combined in Serie A to produce a dramatic finish to the title race. Roma were to start the brighter with some slick interchanging play but failed to shoot effectively when the chance presented itself. As a result of some fine individual performances Napoli opened up a commanding 4-1 lead at half time. Napoli continued to threaten early in the second half and looked to be comfortable at 7-2. However, Roma never gave up and left Napoli clinging on at the end after 5 quick fire goals. 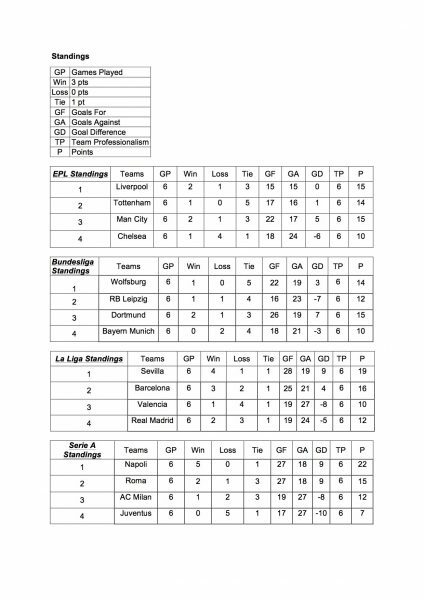 Below are the final standings for the JPSA Spring Saturday Academy League 2018! !